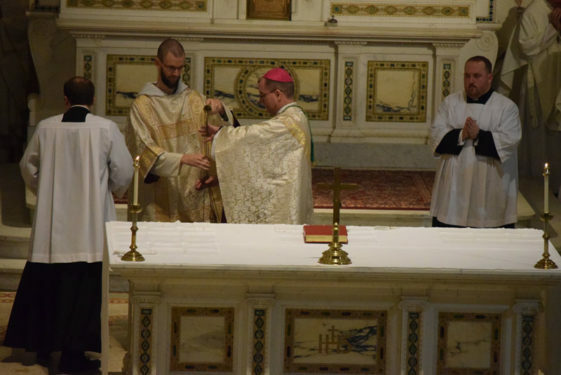 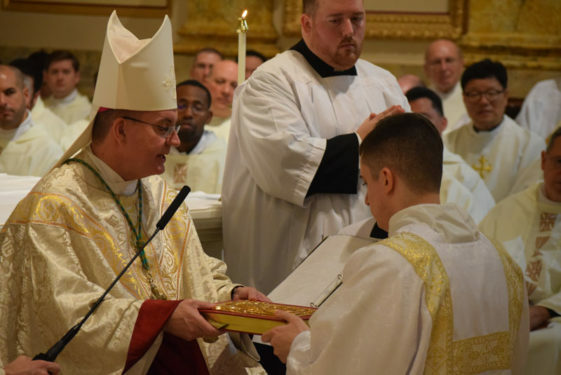 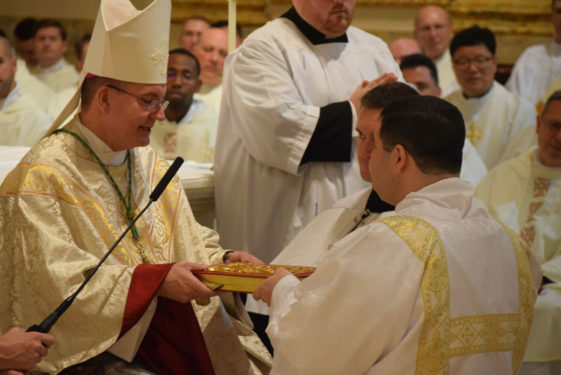 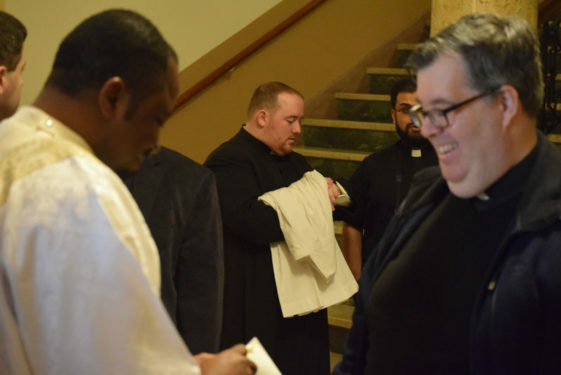 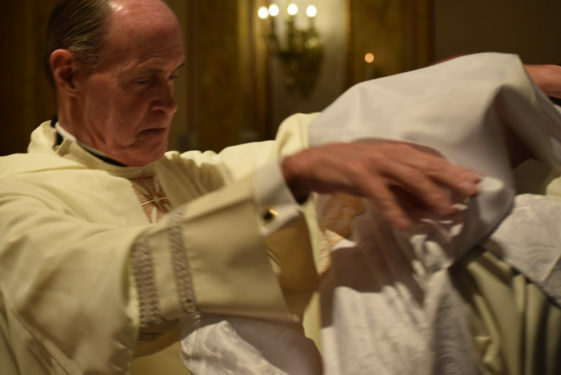 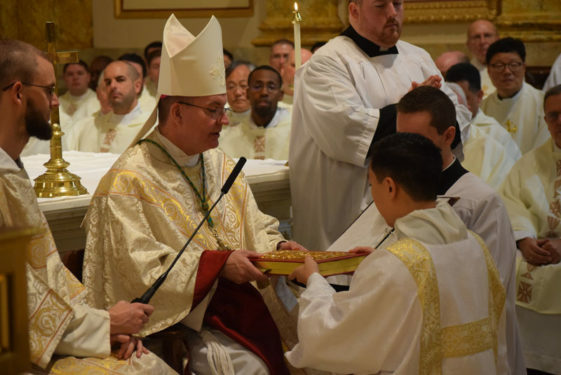 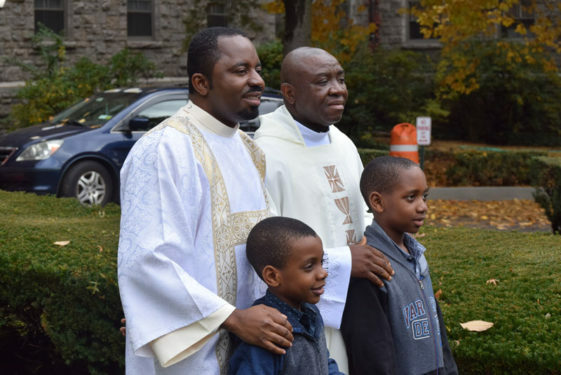 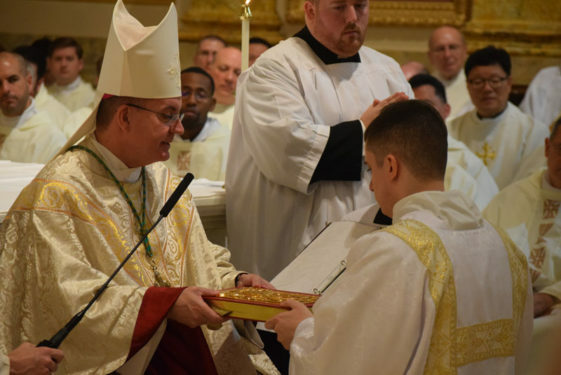 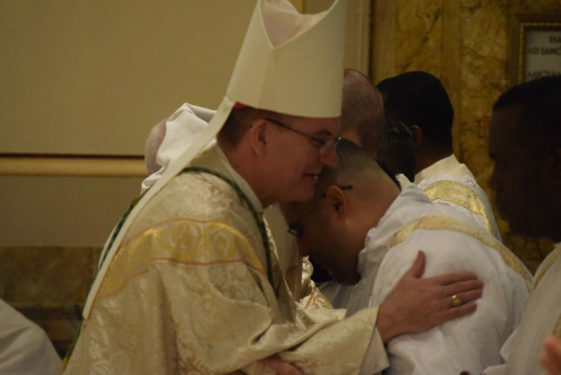 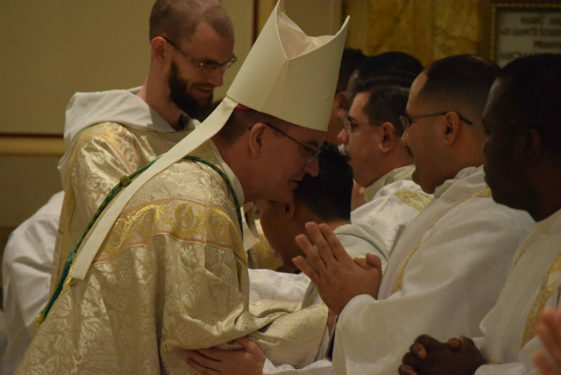 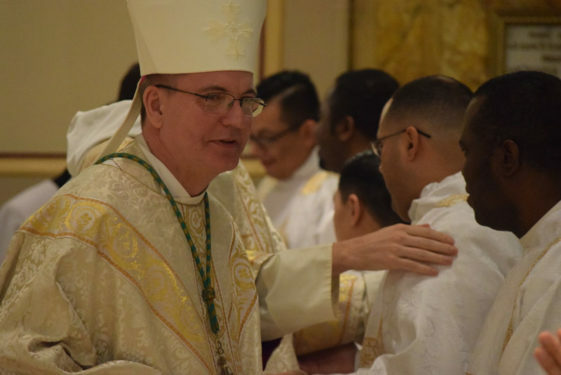 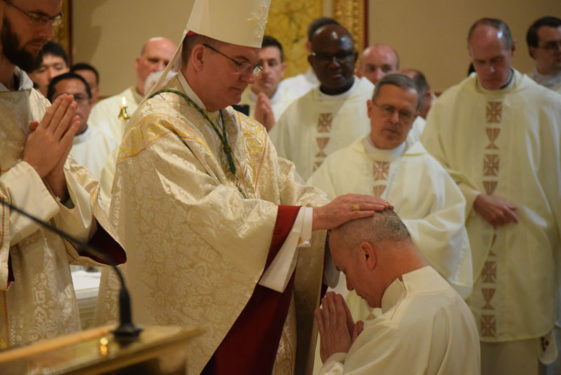 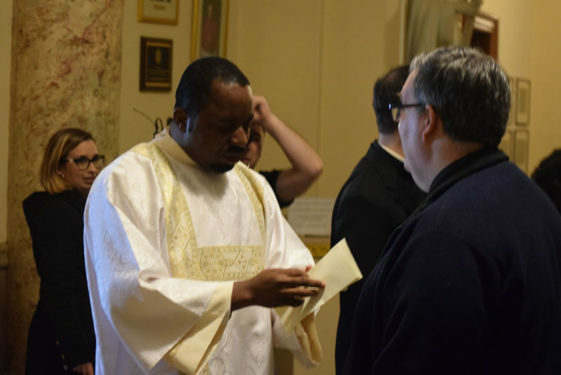 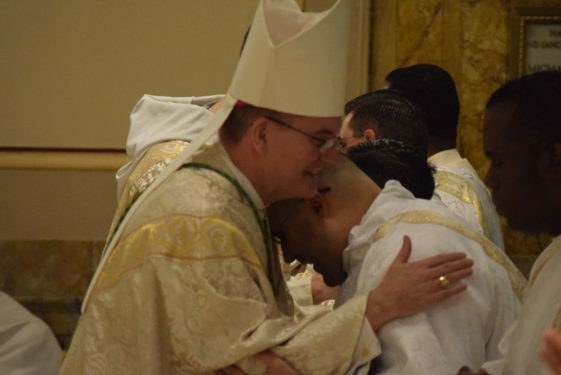 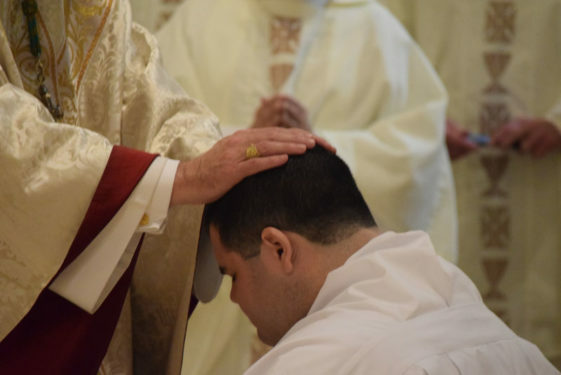 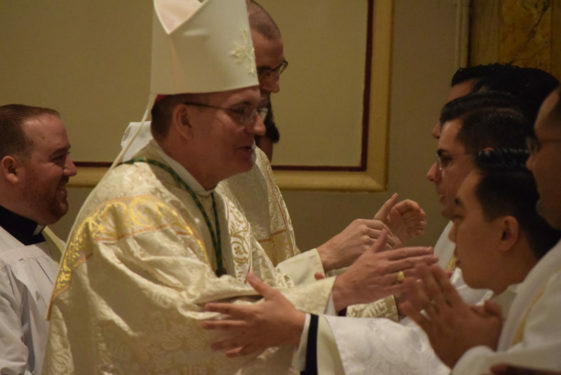 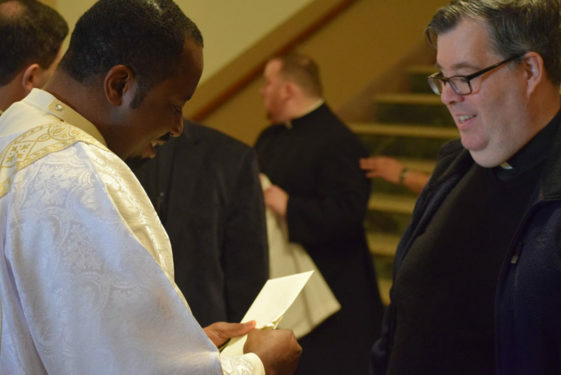 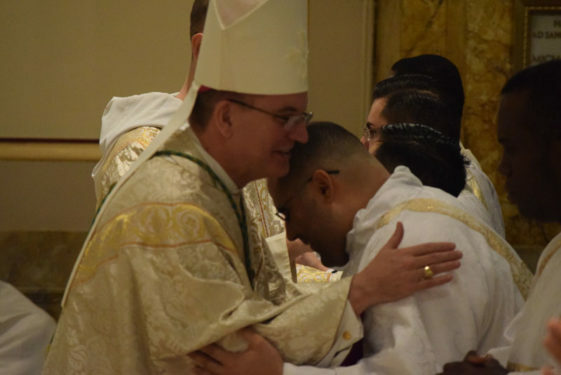 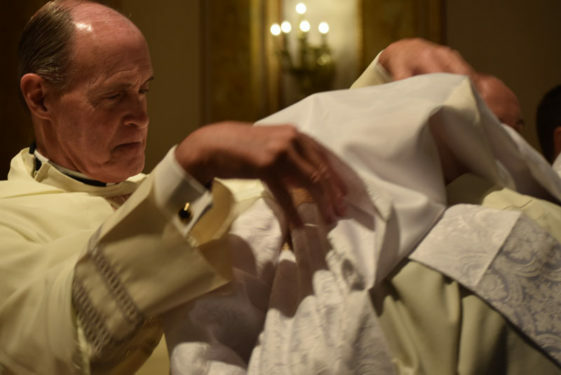 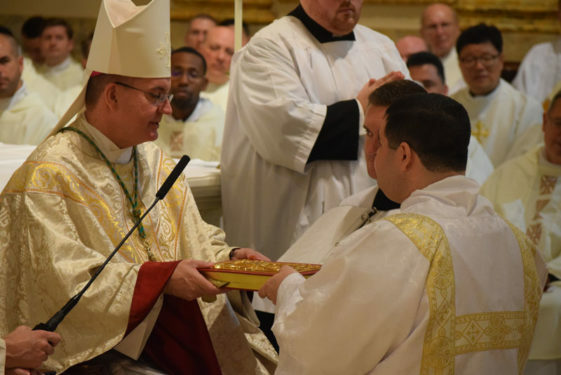 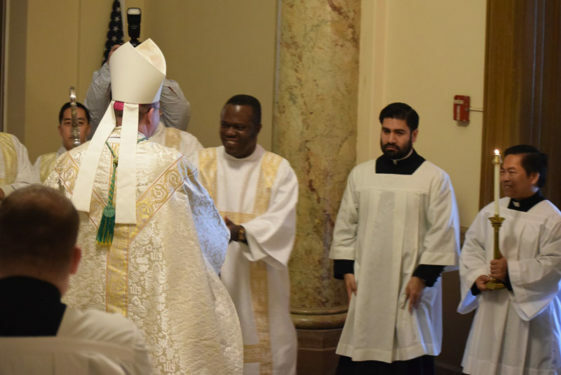 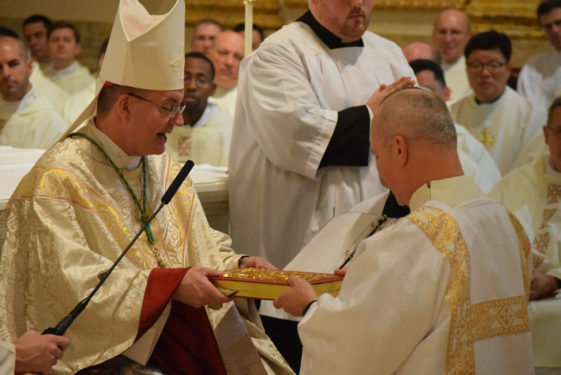 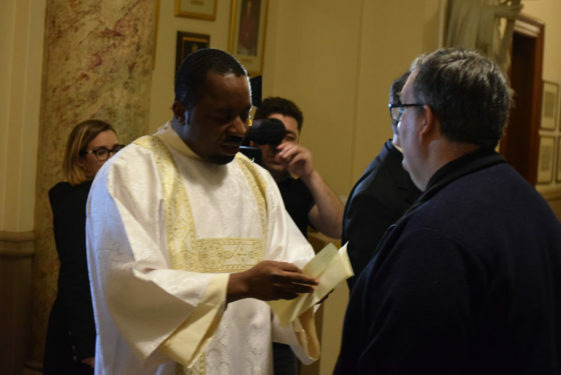 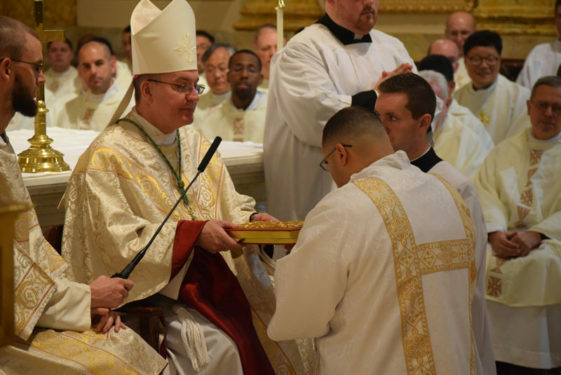 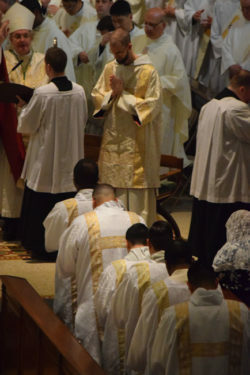 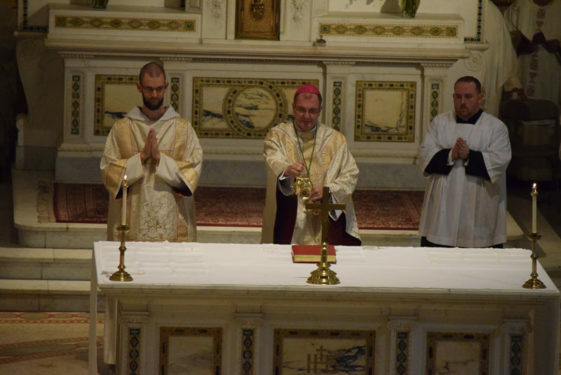 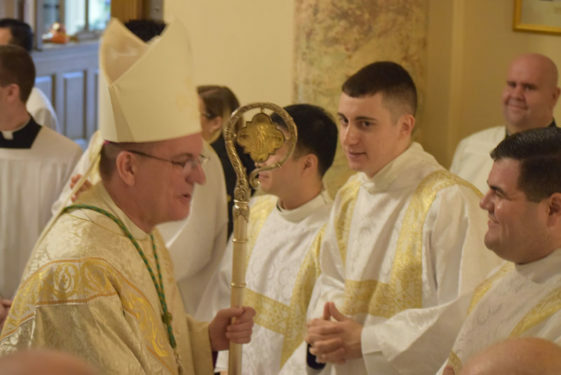 The celebrant was the Bishop John O. Barres of Rockville Centre. 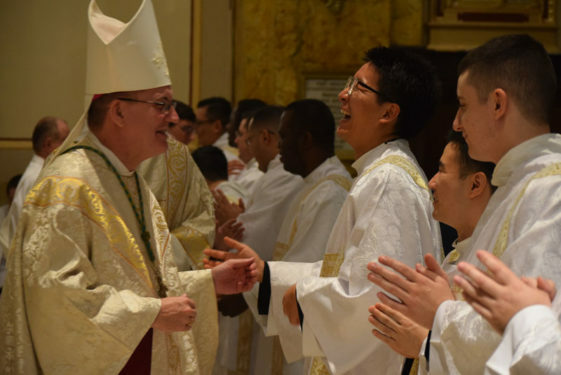 Clockwise from top right, Bishop Barres shares a laugh with Sangbin Alex Lee as he congratulates him. 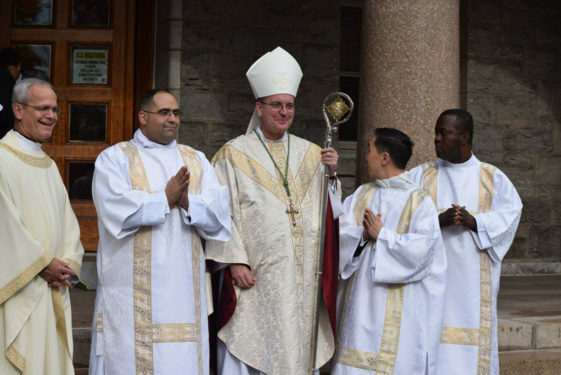 Johnpaul Obiaeri poses to take pictures with friends. 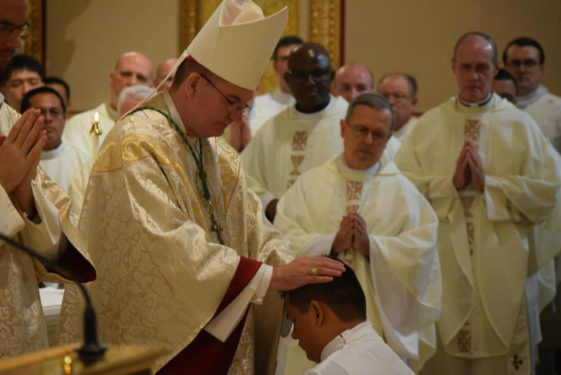 Michael Falce receives the laying of the hands from Bishop Barres. 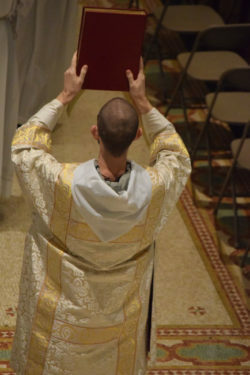 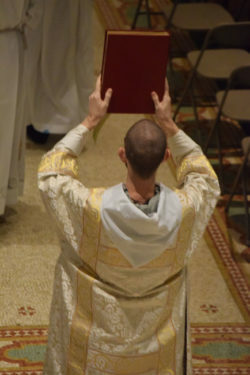 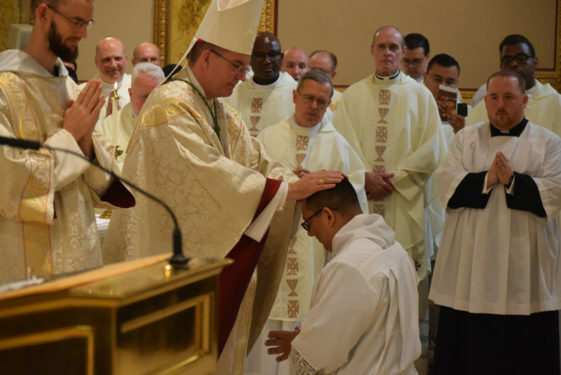 Edwin Ortiz lays his hands on the Gospel. 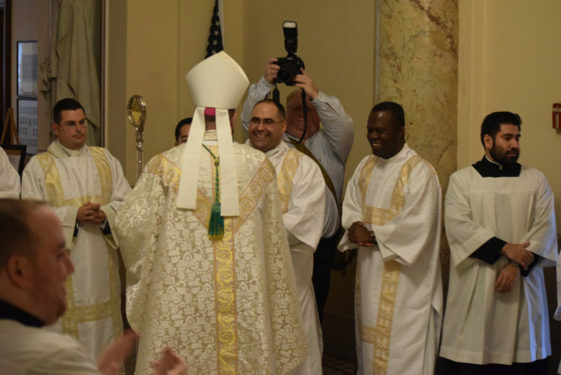 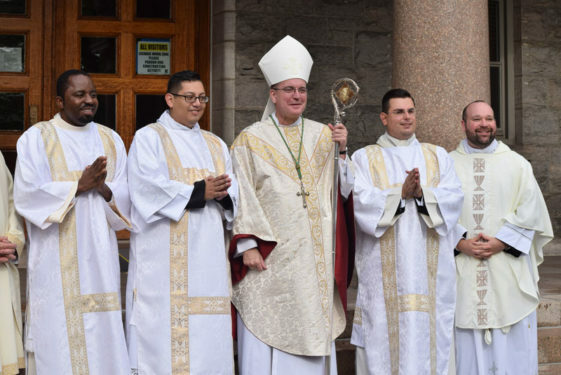 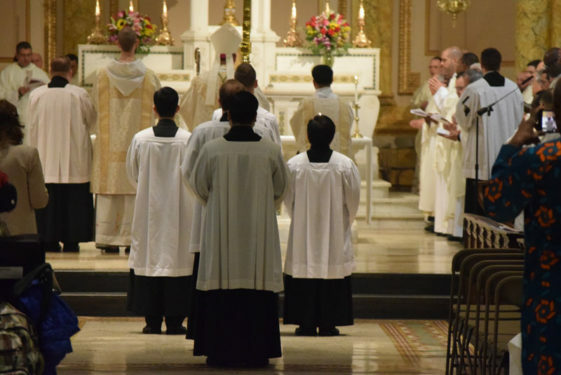 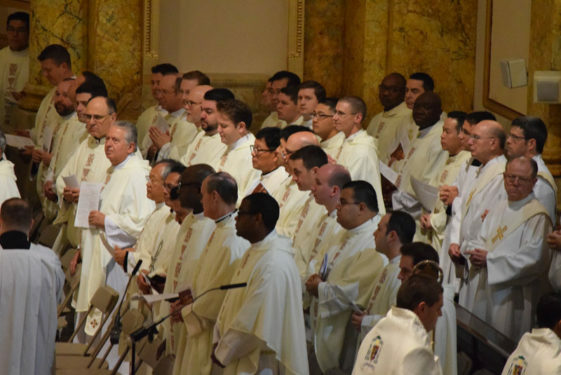 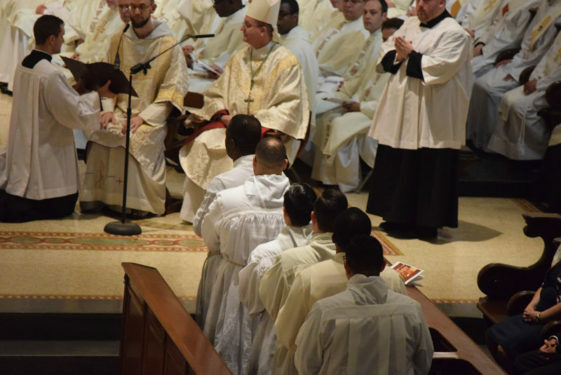 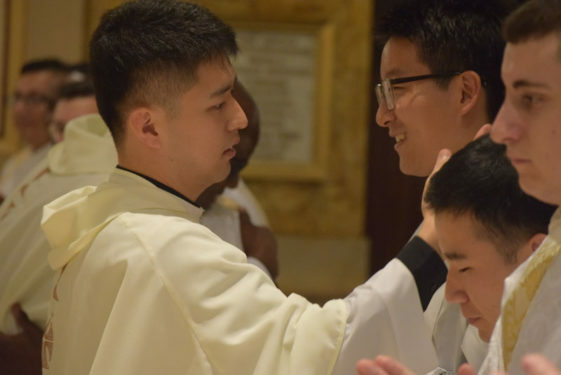 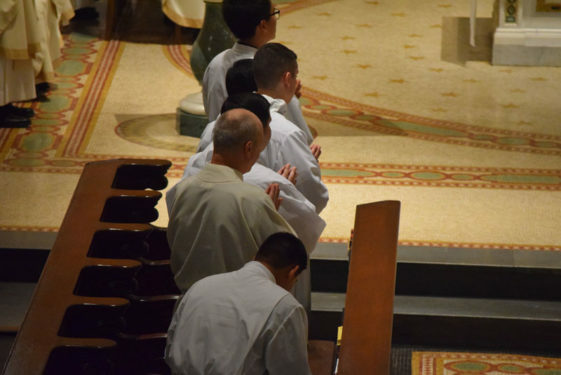 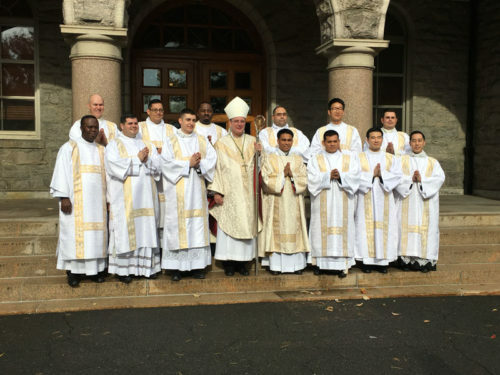 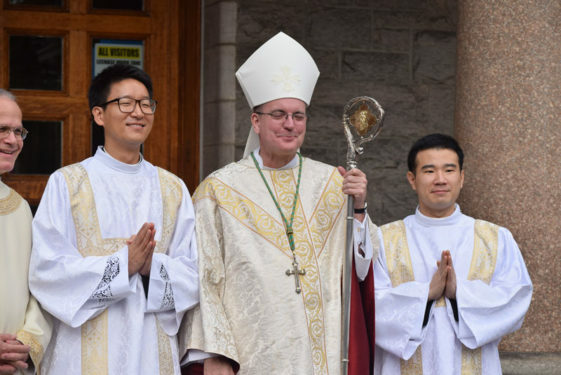 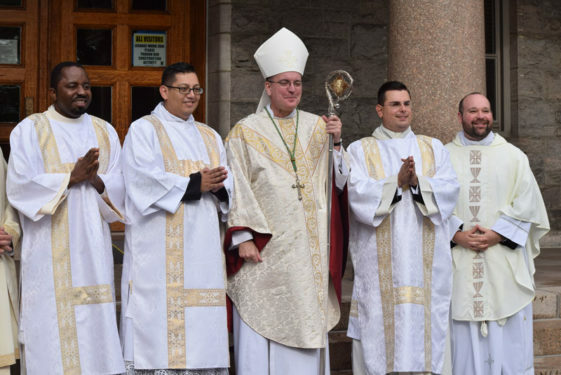 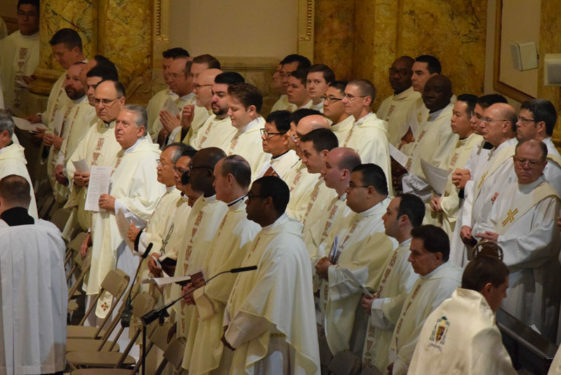 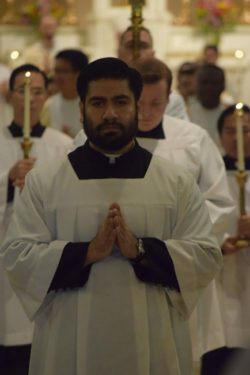 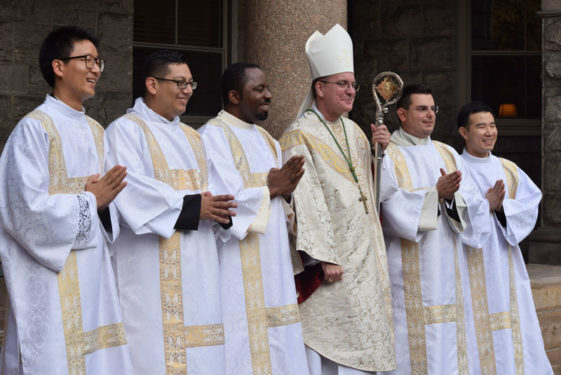 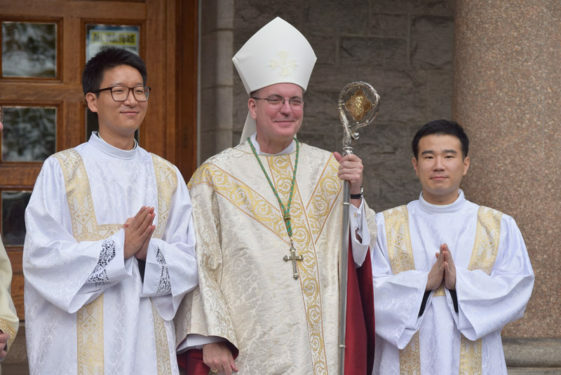 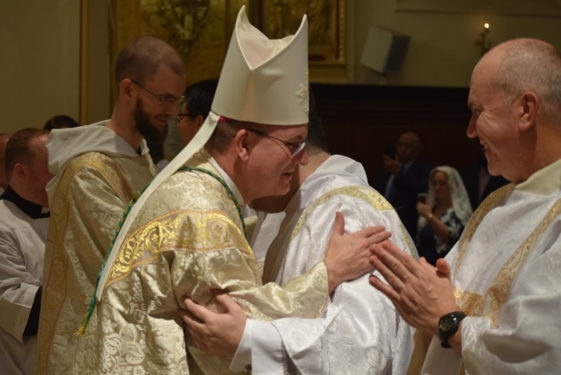 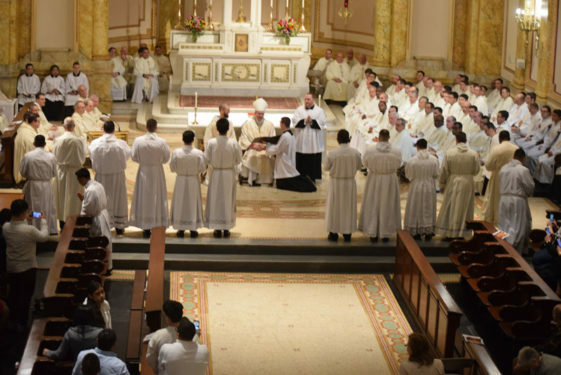 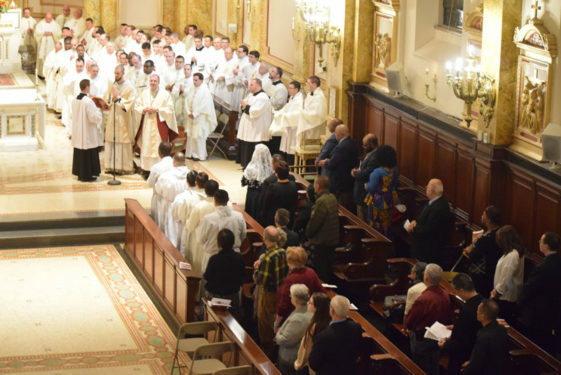 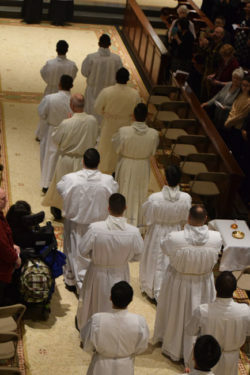 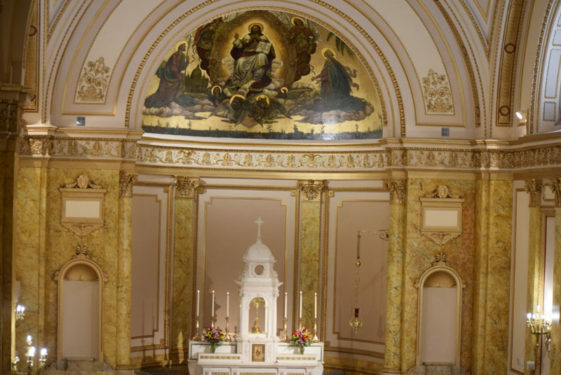 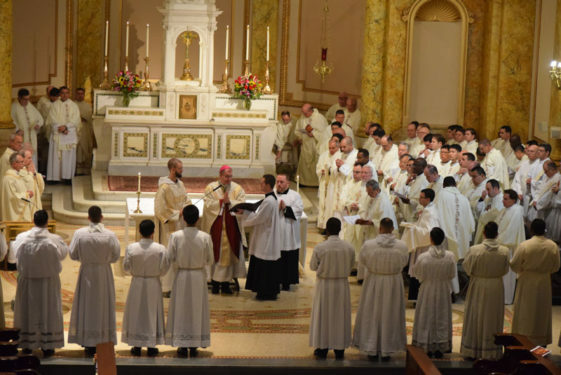 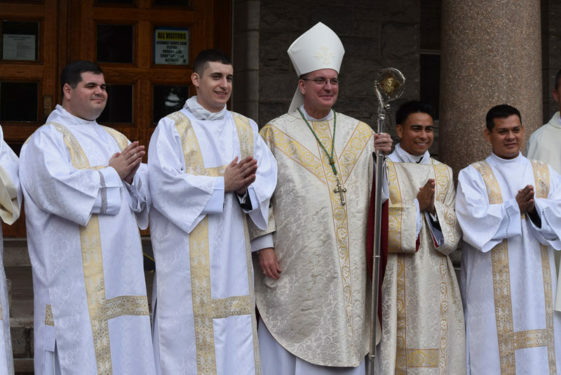 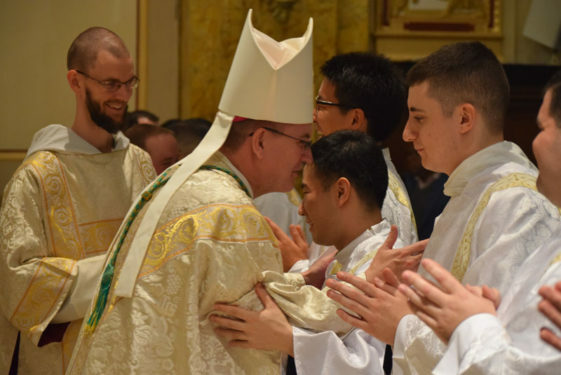 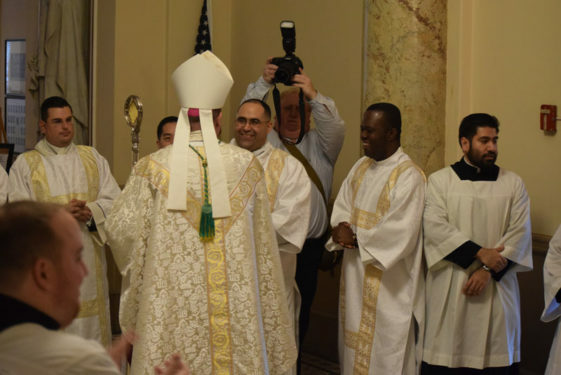 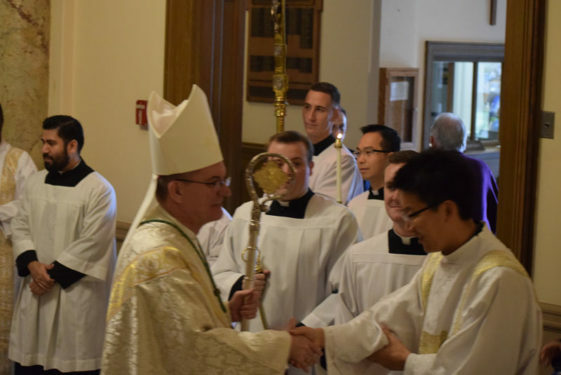 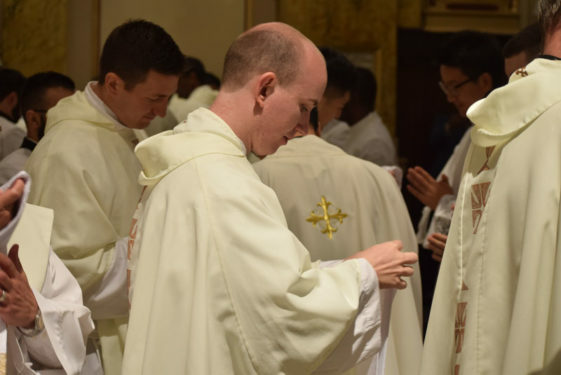 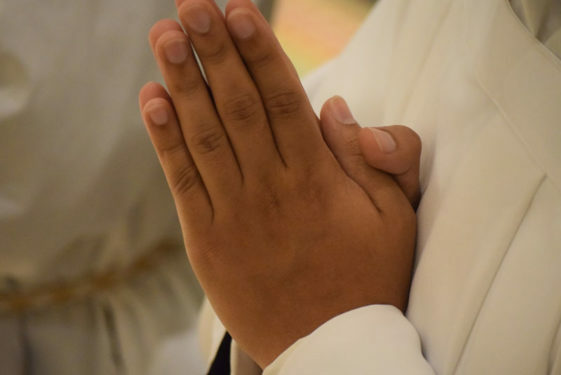 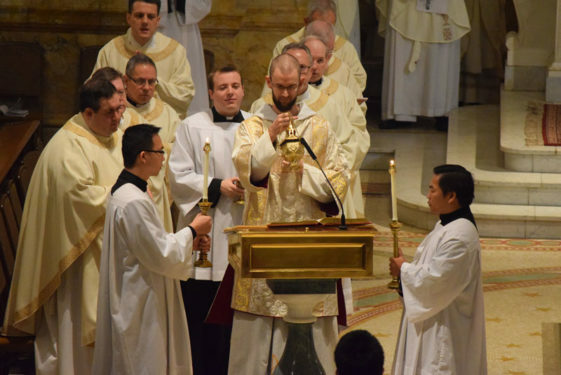 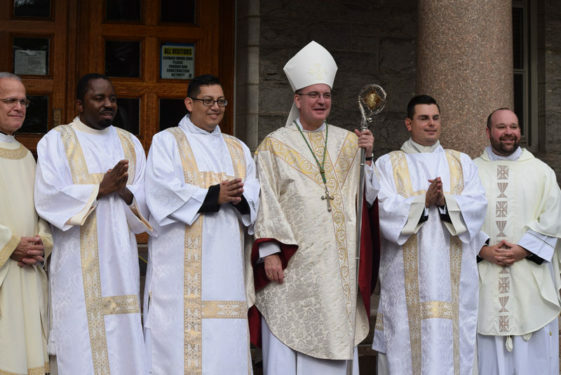 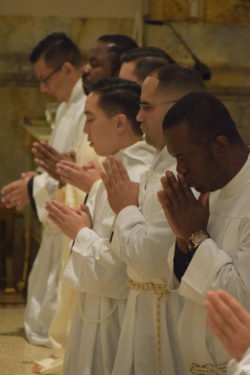 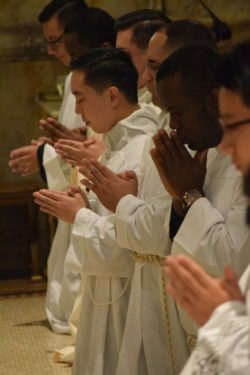 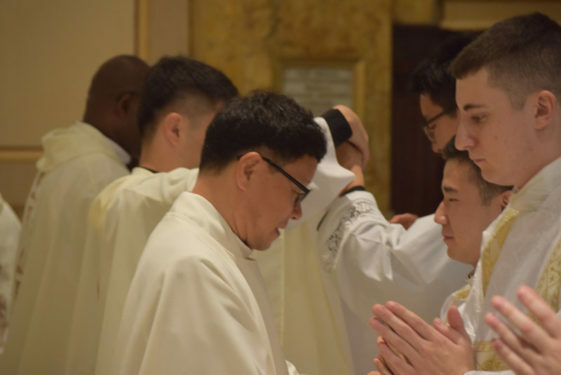 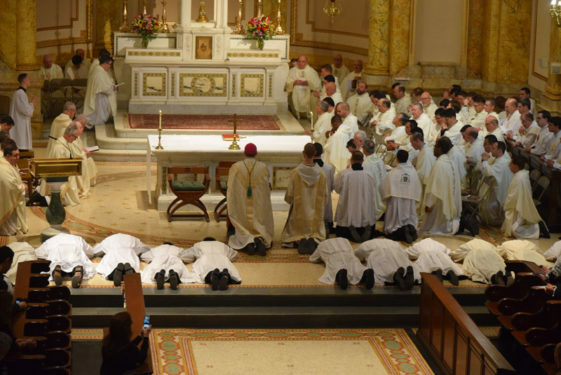 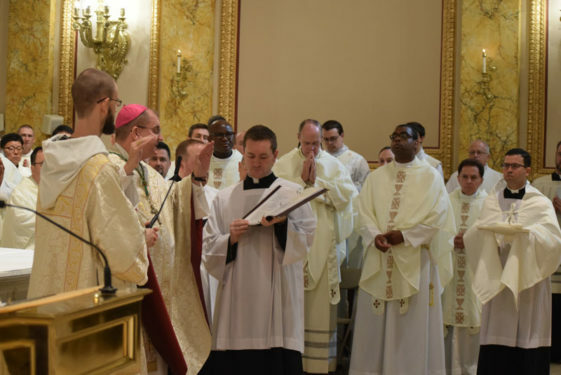 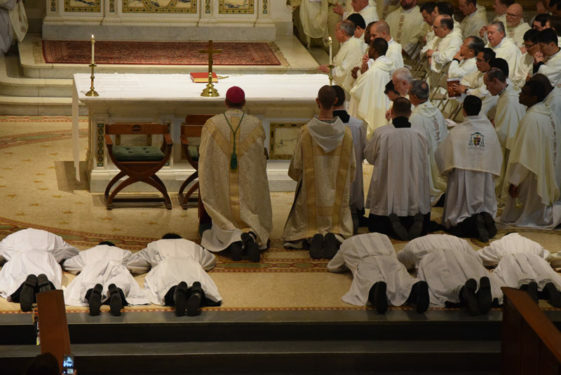 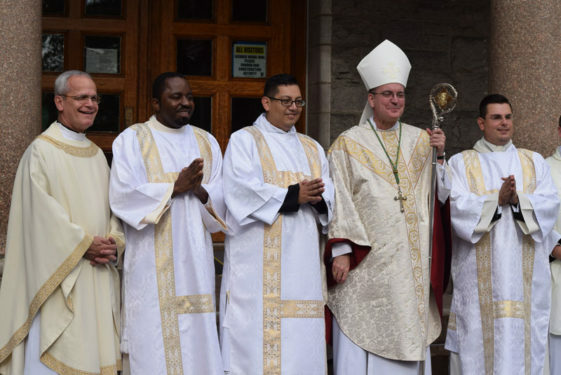 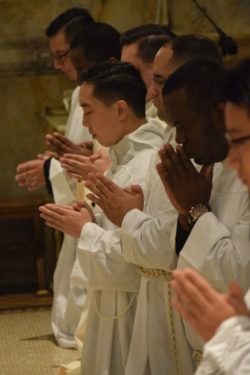 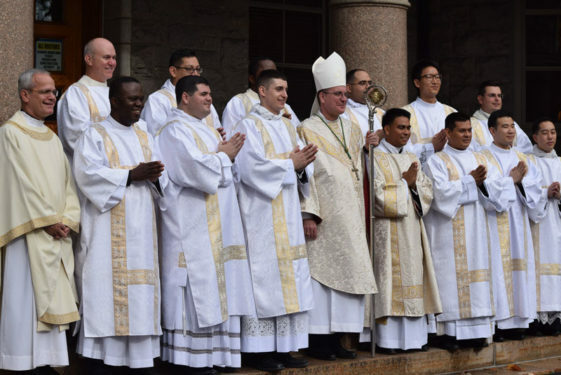 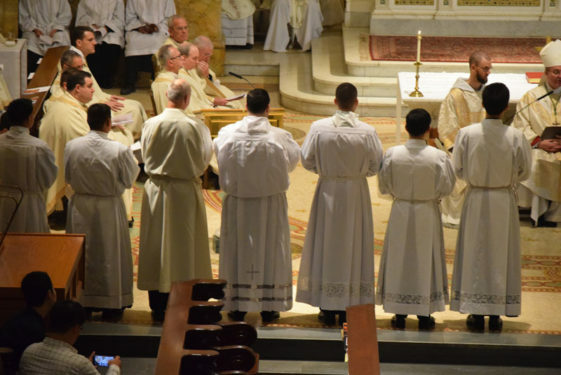 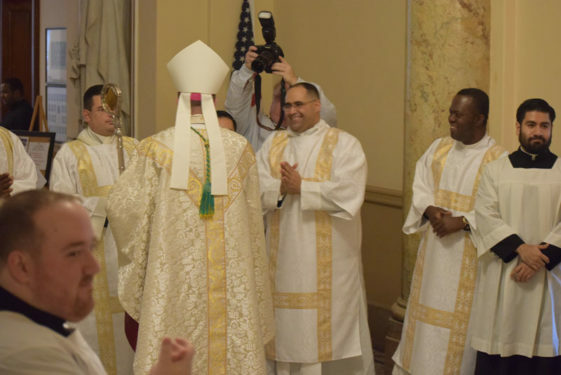 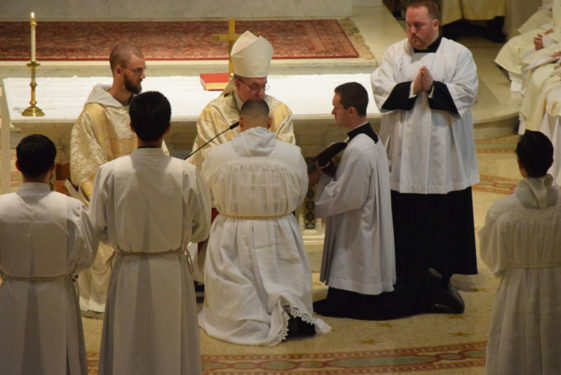 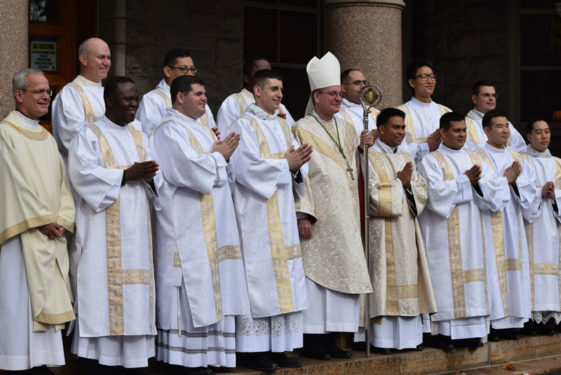 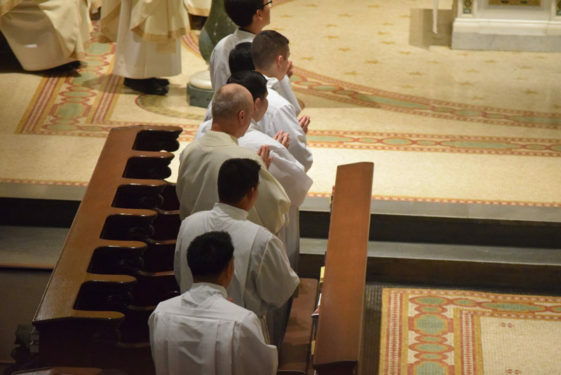 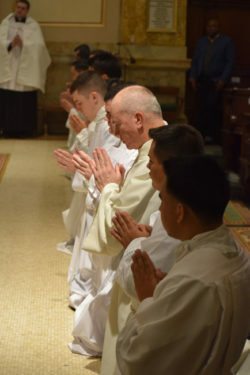 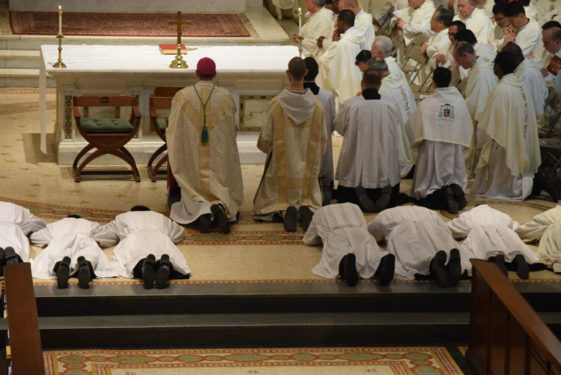 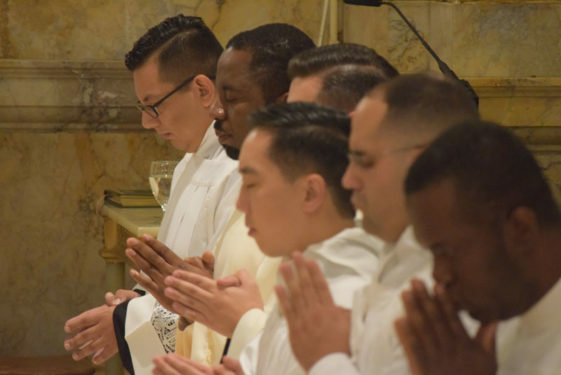 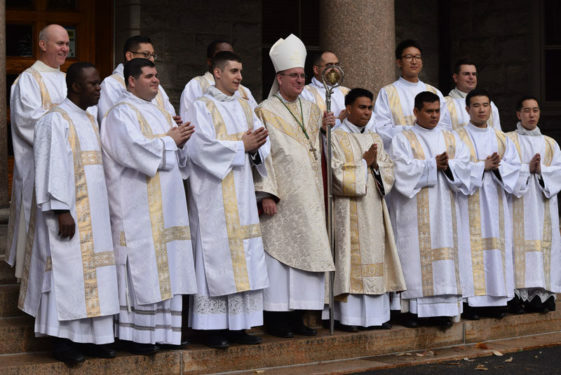 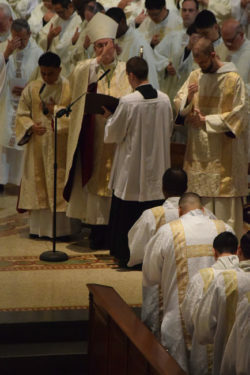 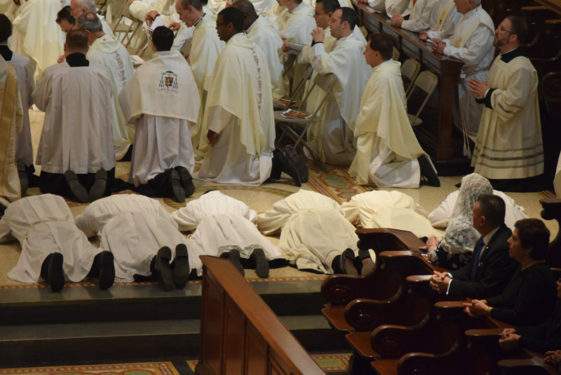 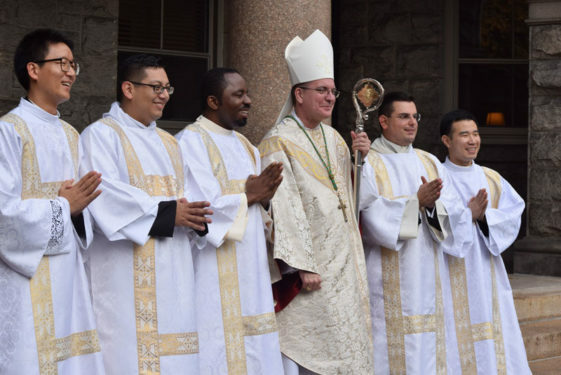 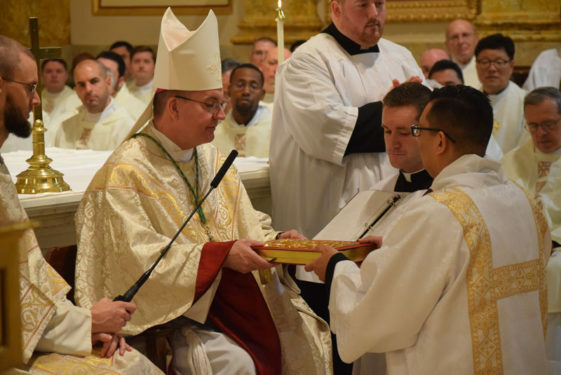 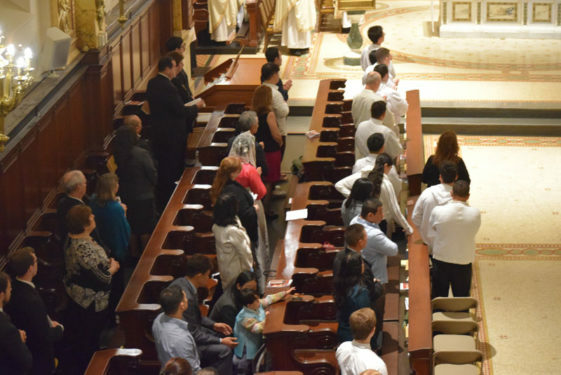 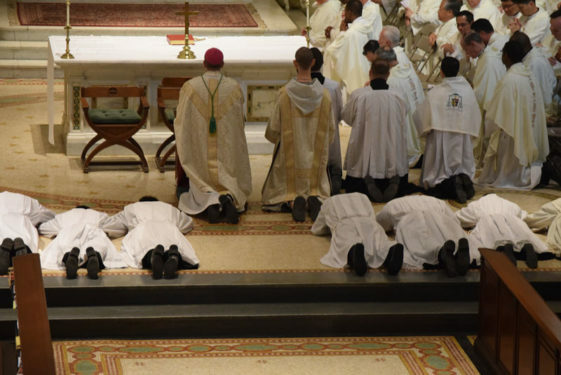 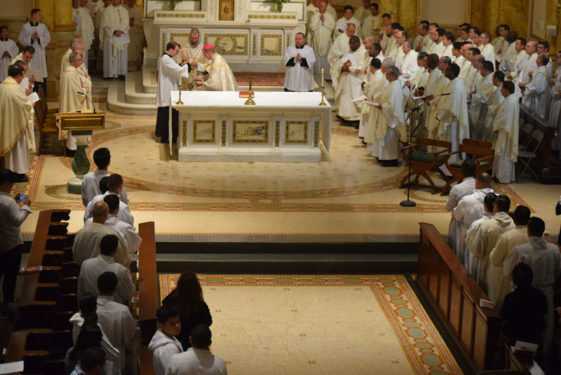 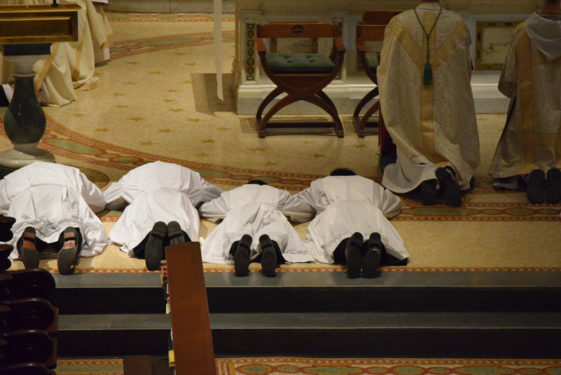 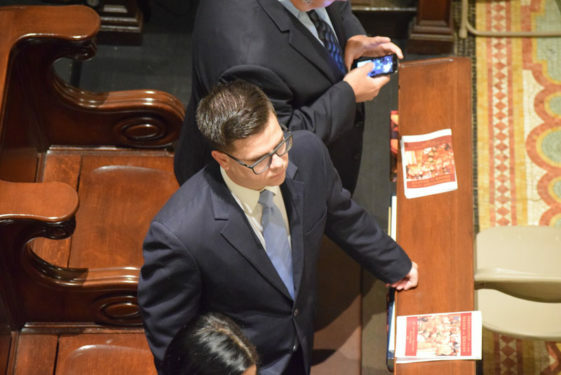 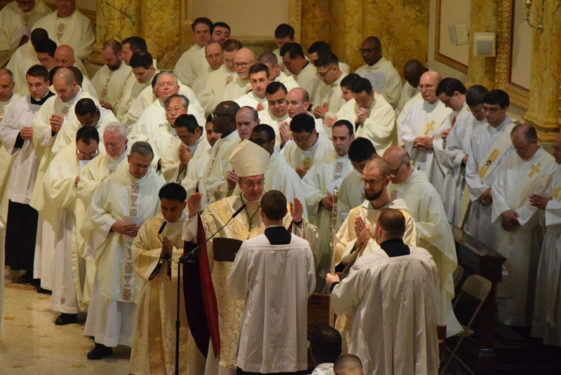 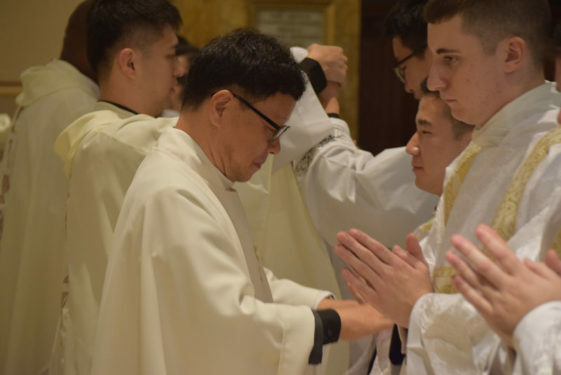 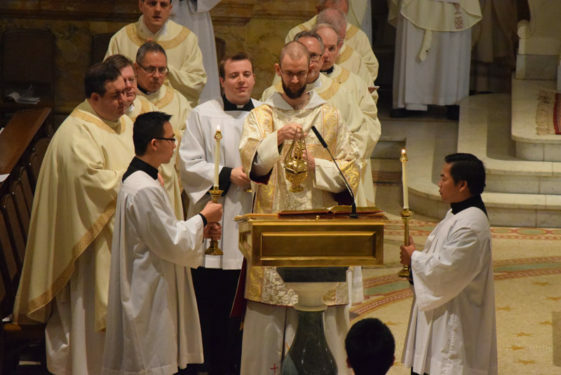 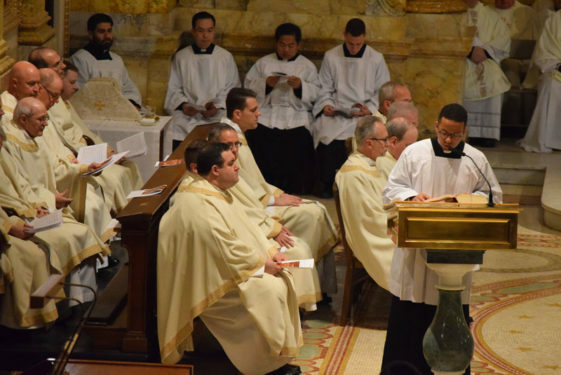 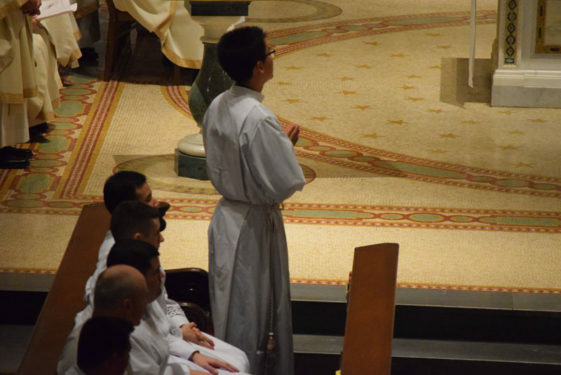 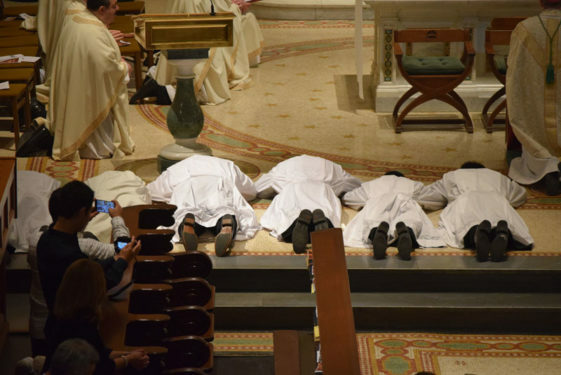 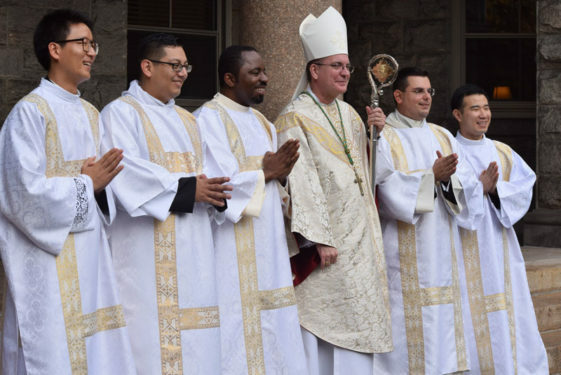 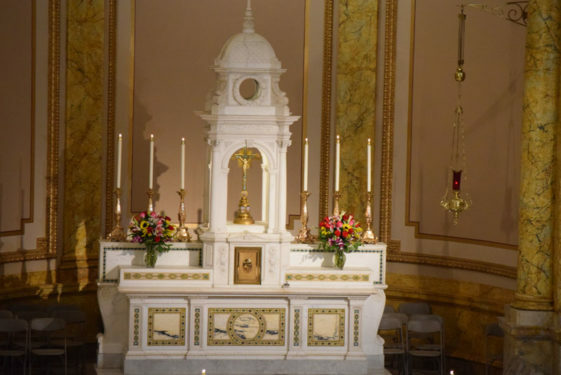 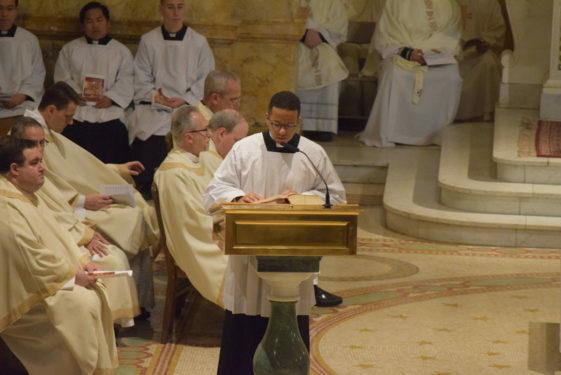 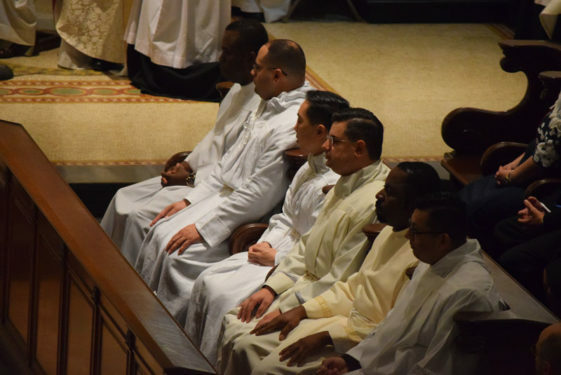 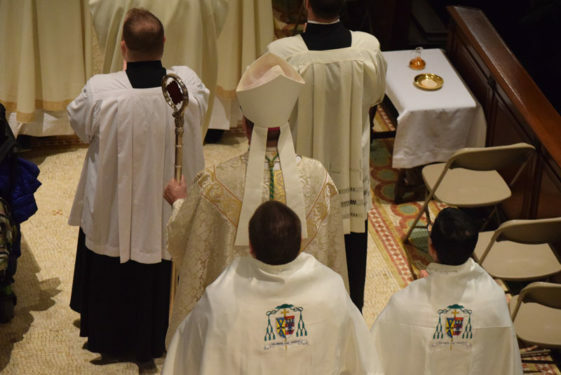 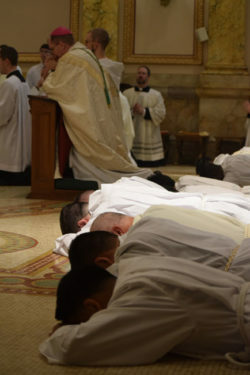 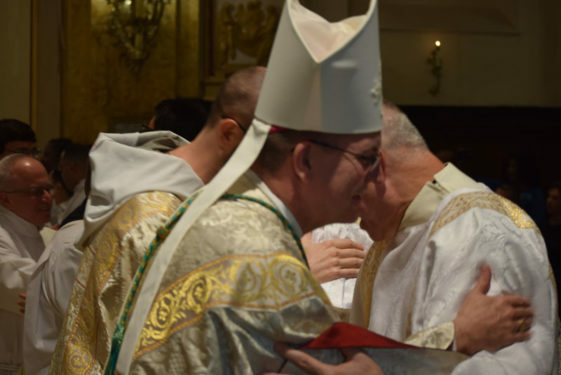 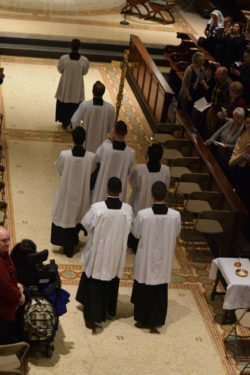 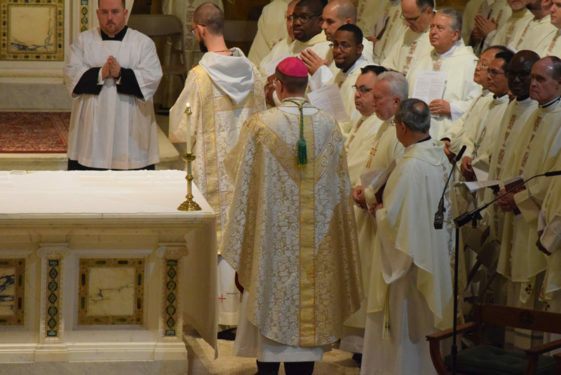 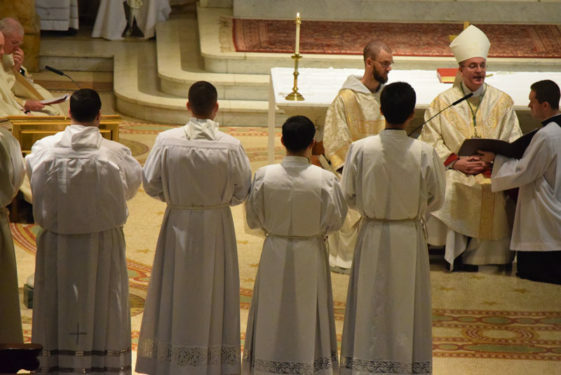 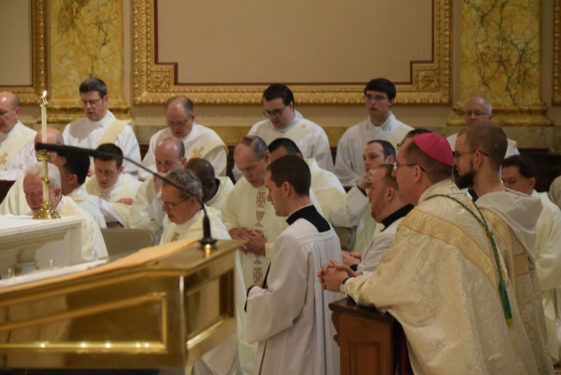 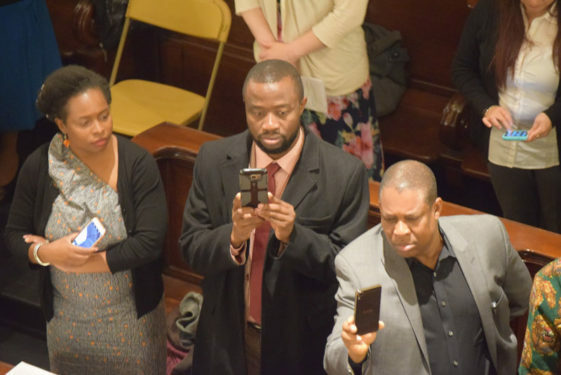 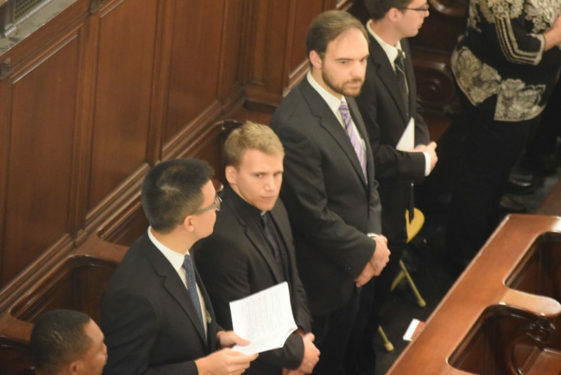 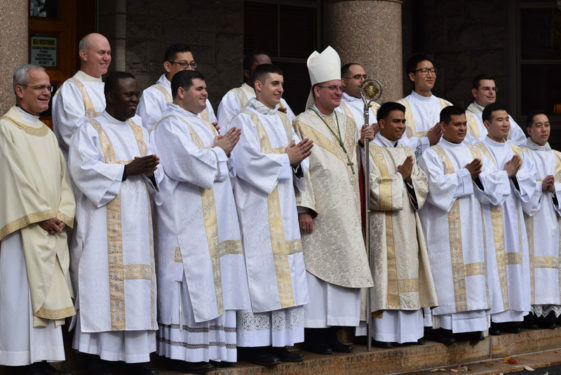 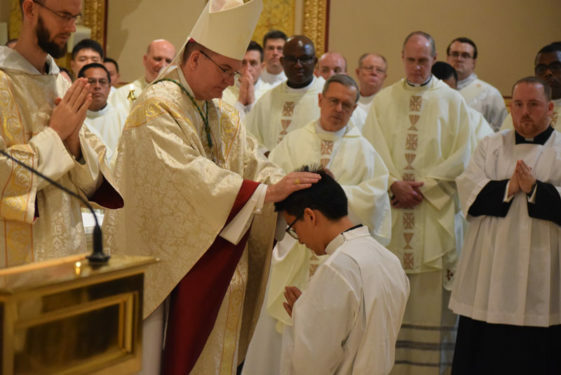 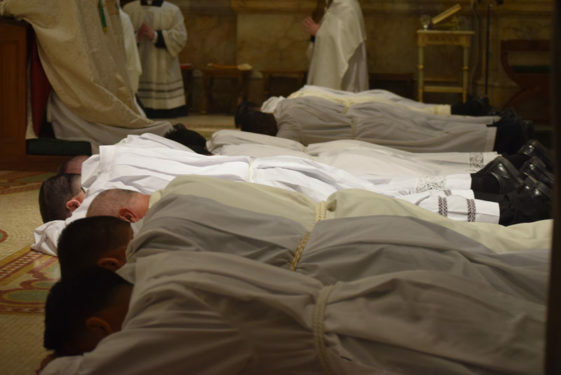 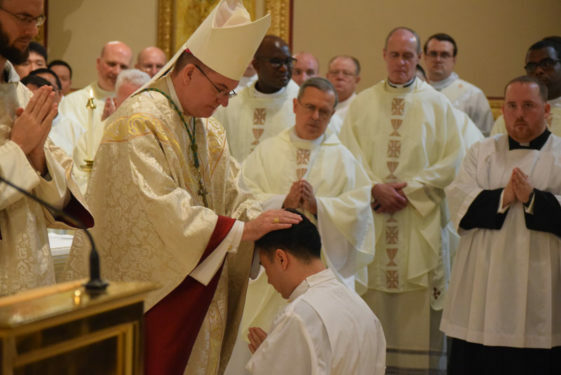 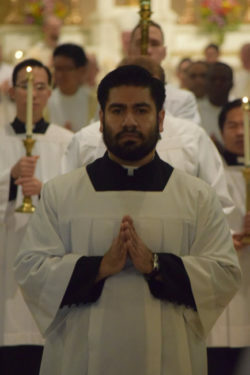 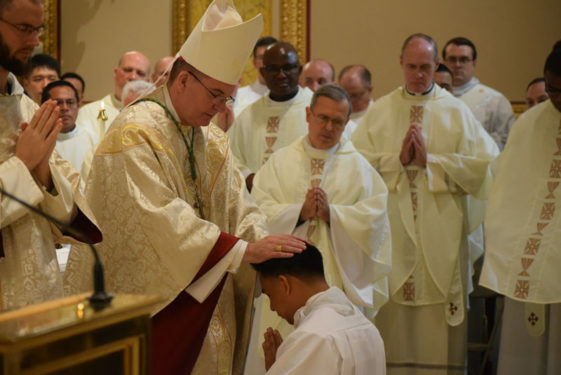 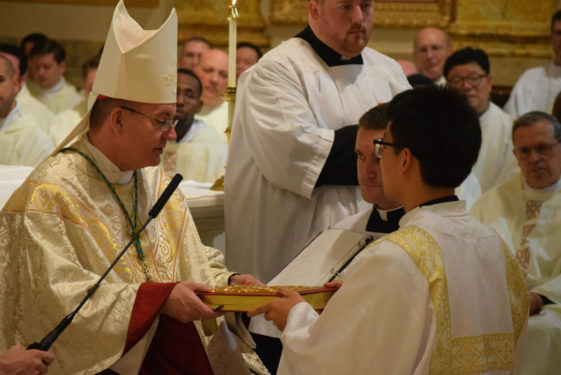 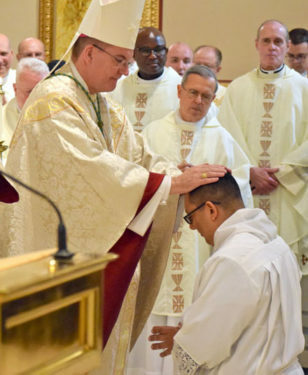 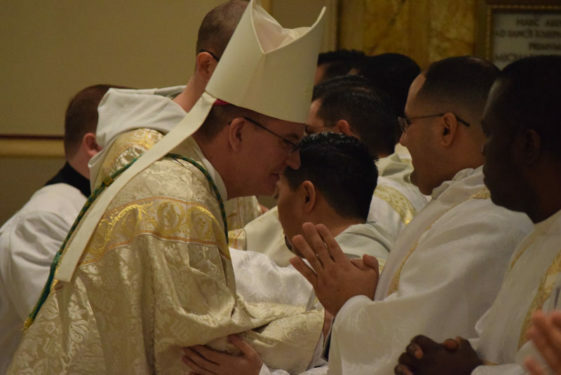 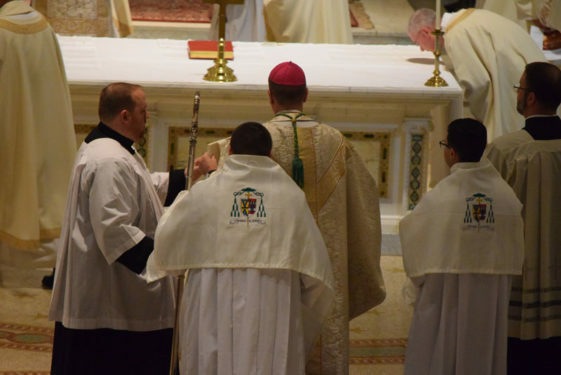 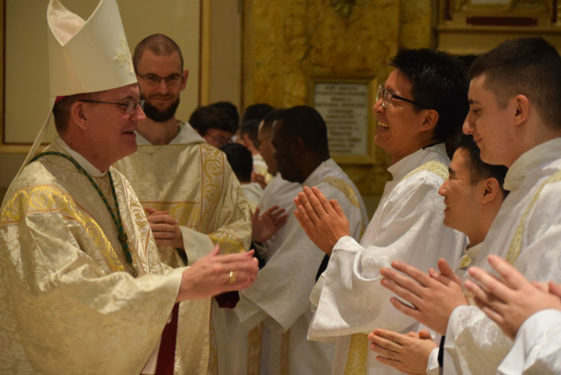 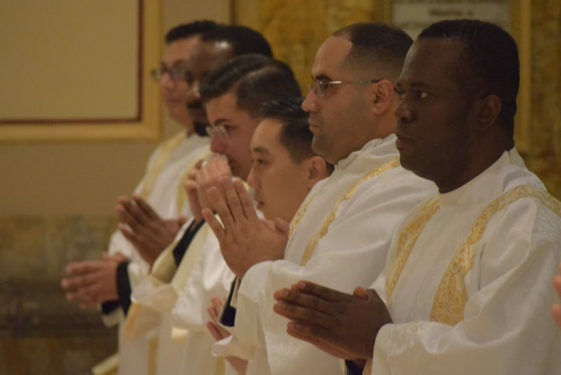 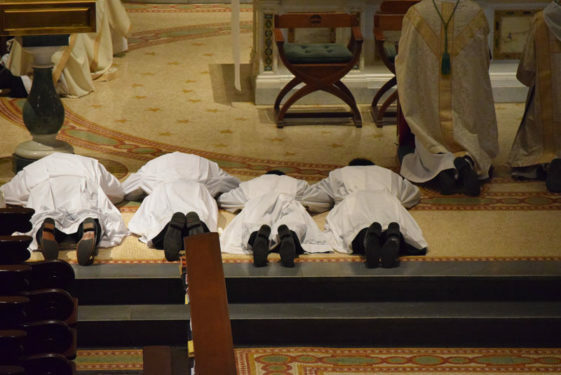 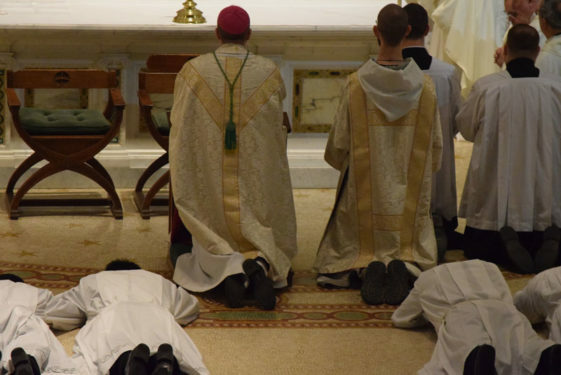 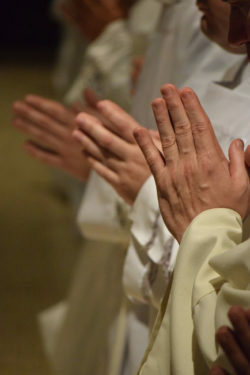 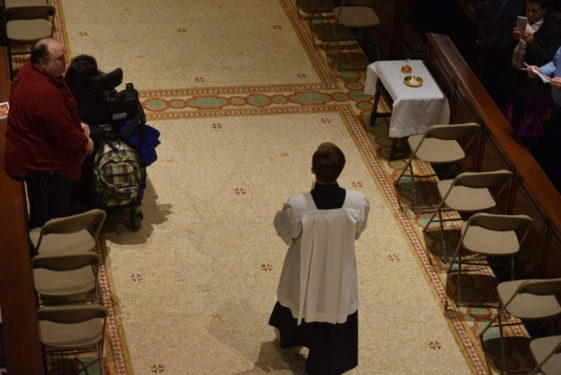 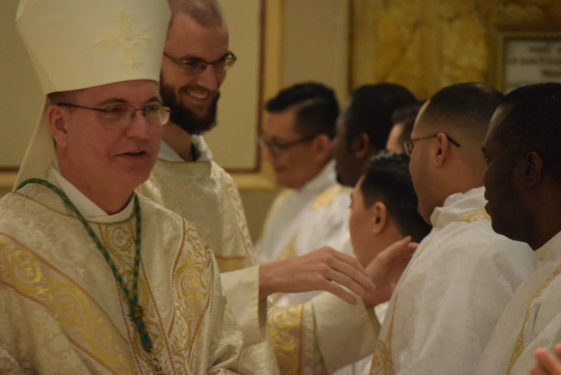 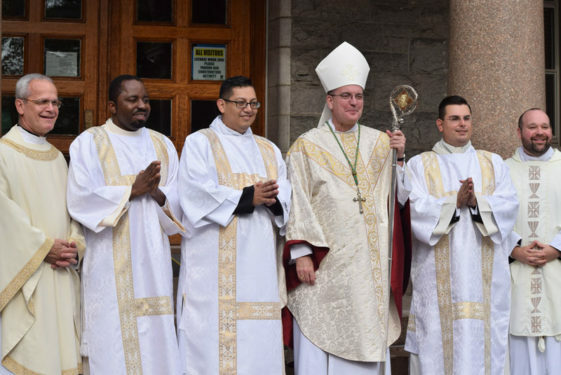 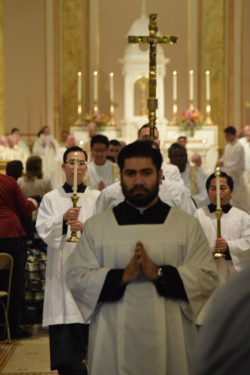 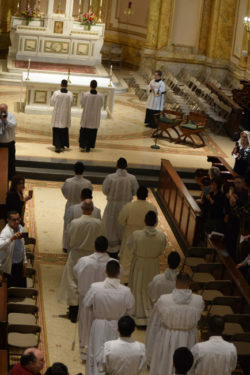 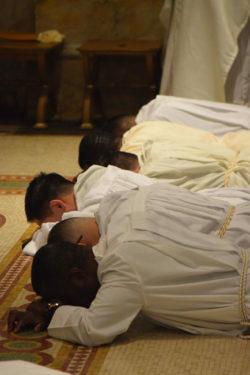 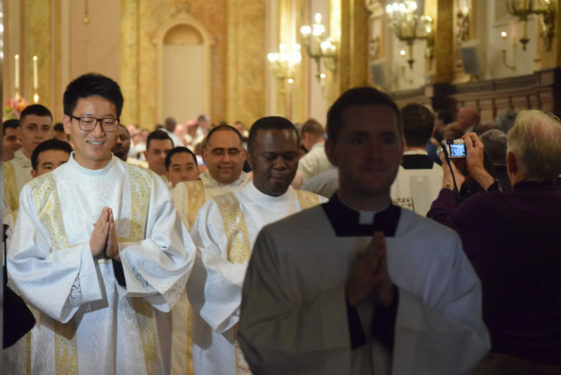 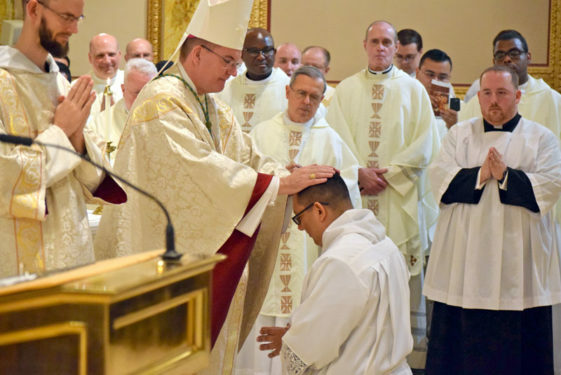 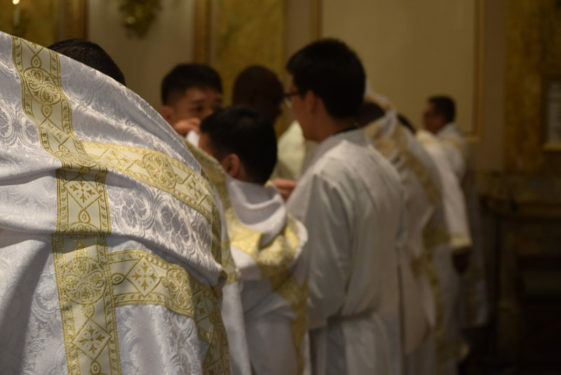 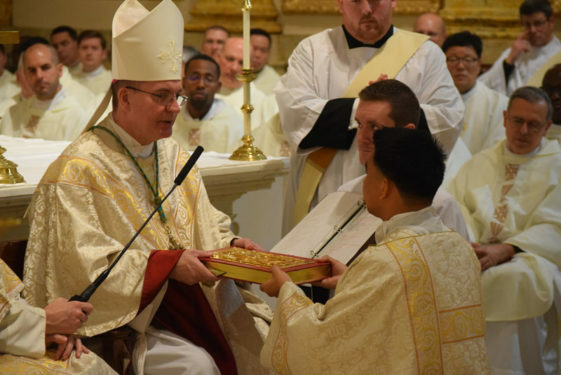 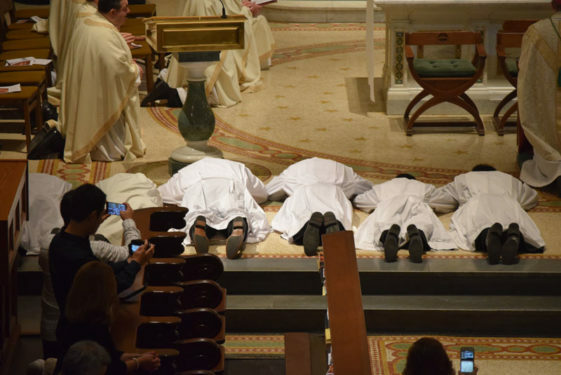 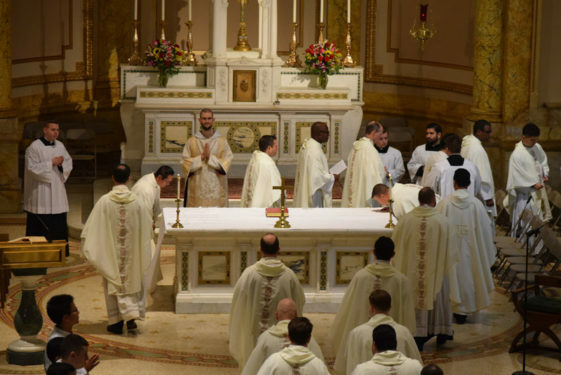 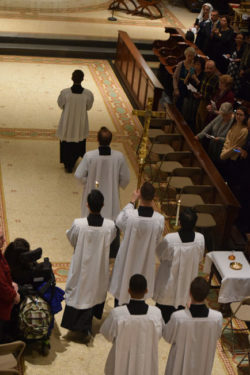 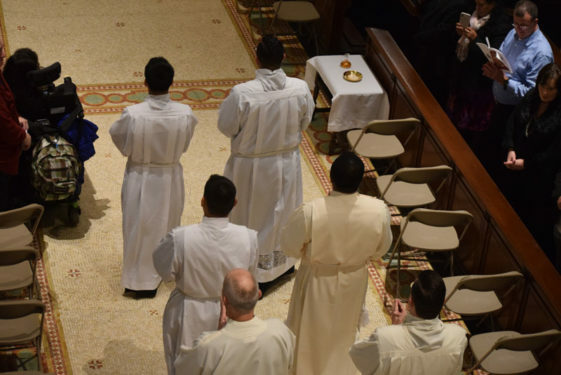 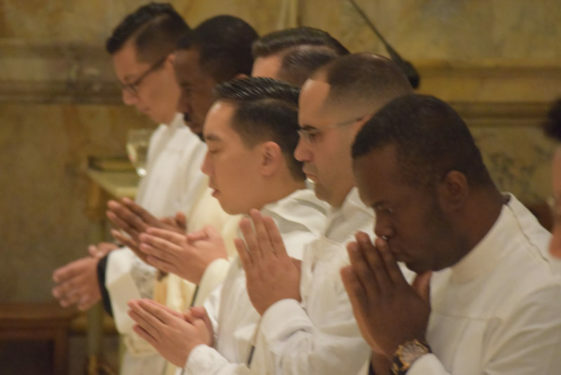 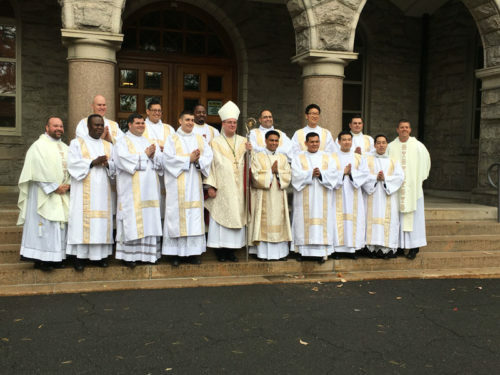 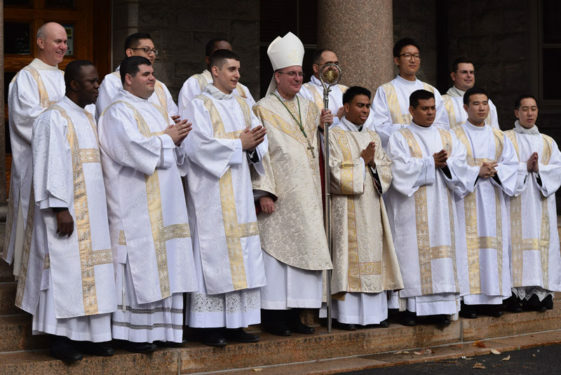 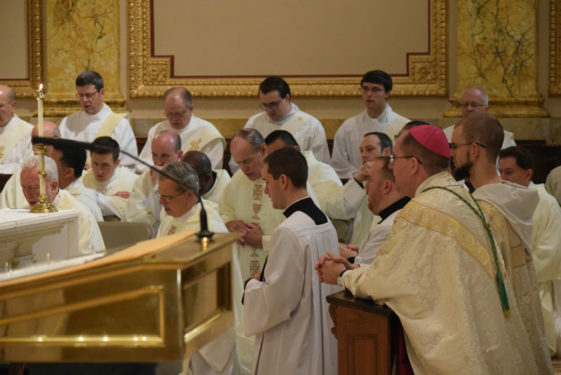 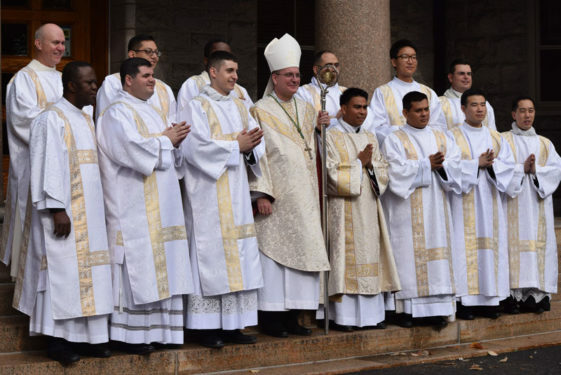 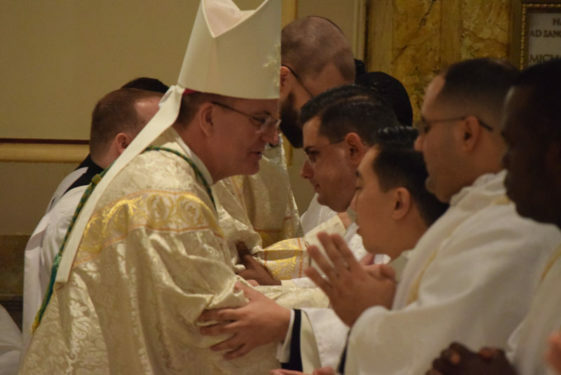 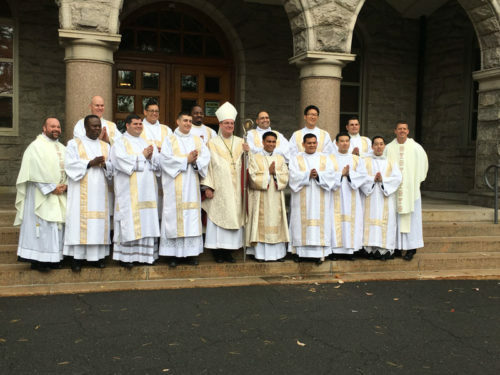 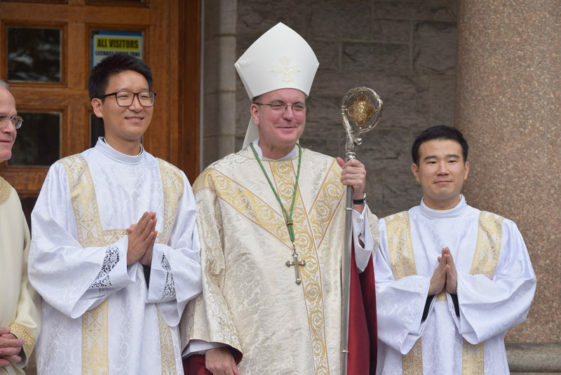 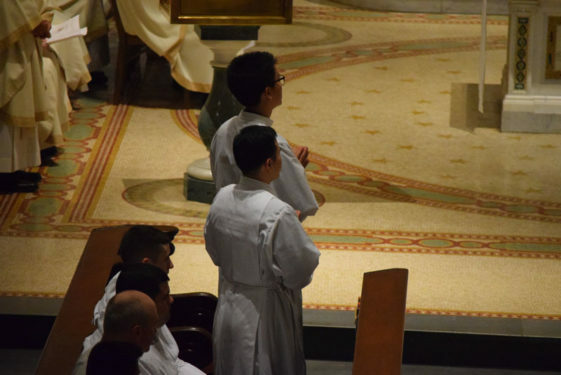 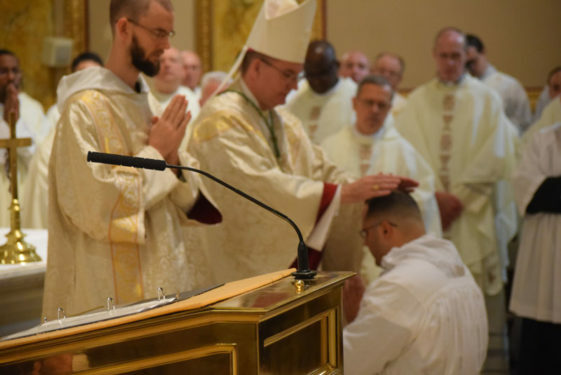 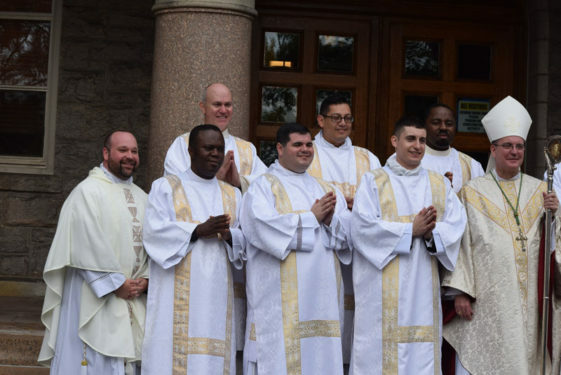 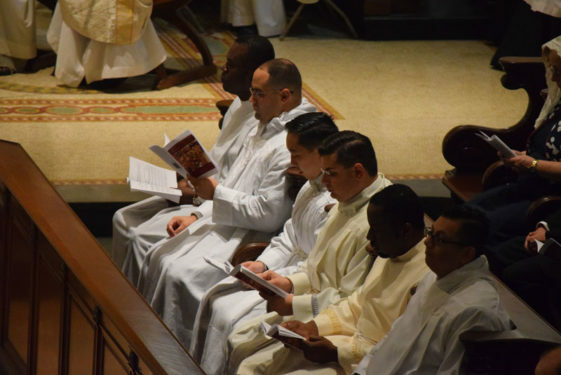 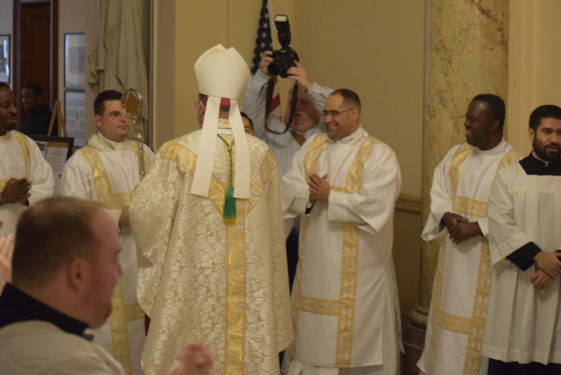 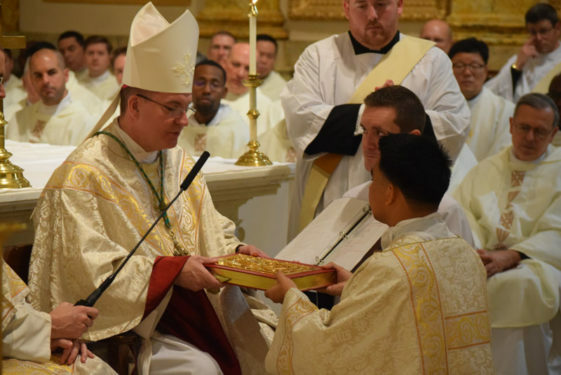 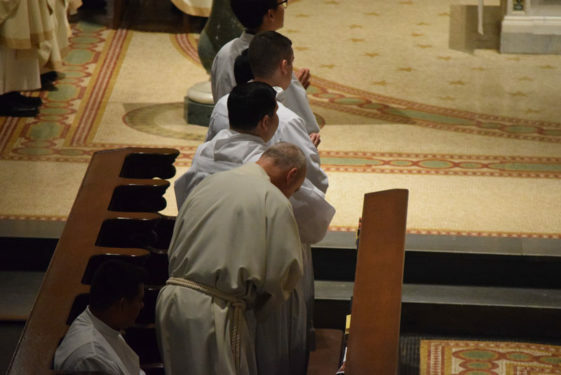 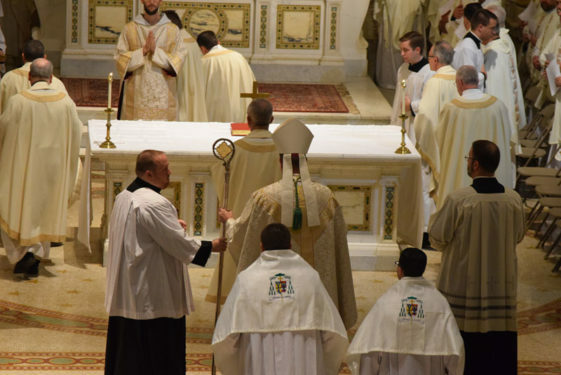 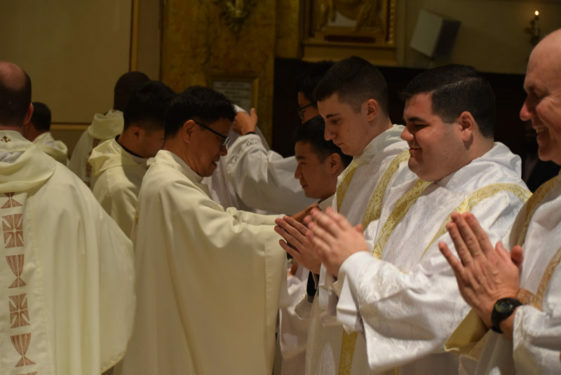 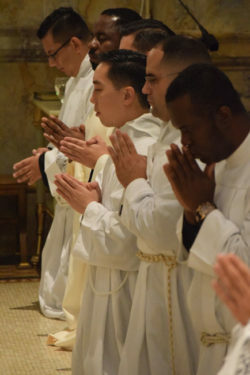 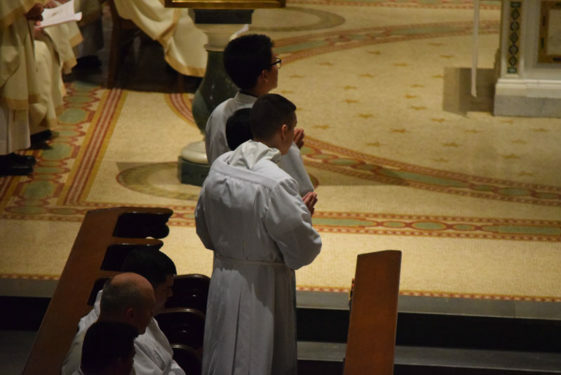 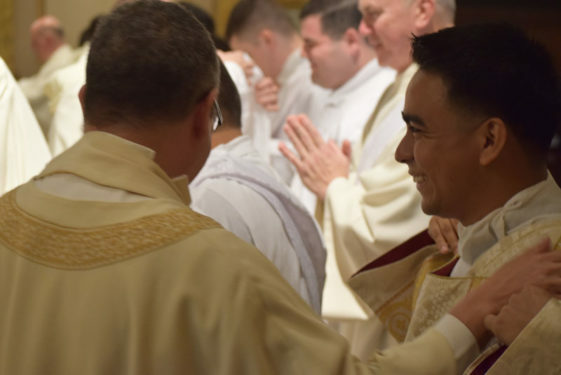 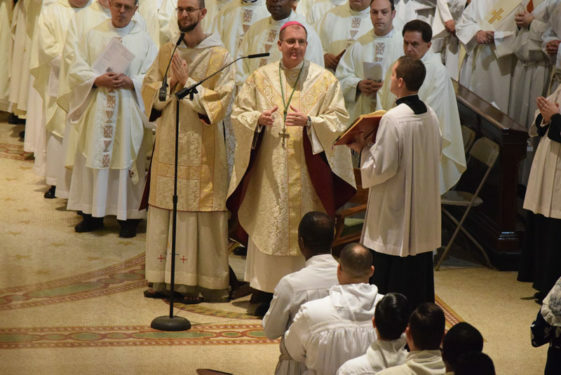 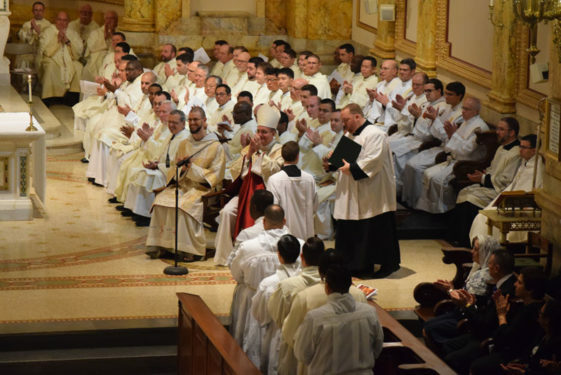 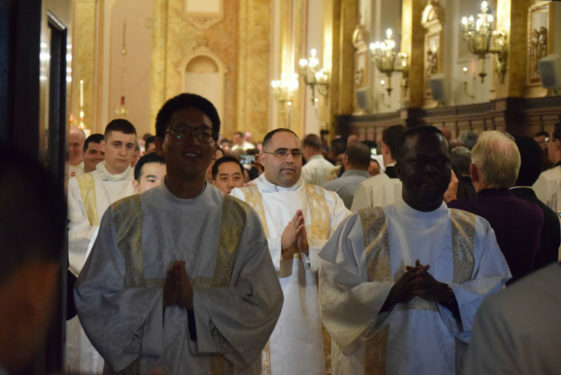 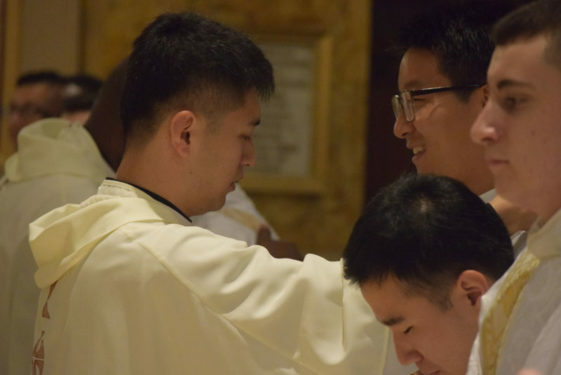 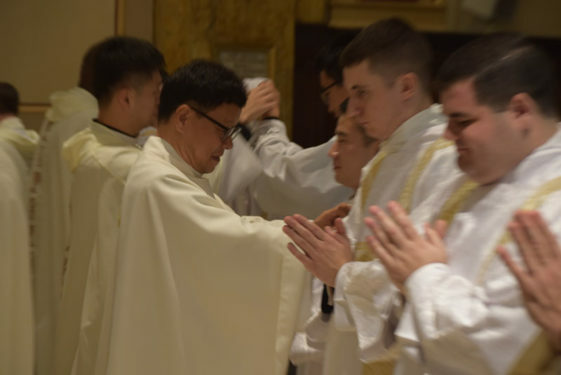 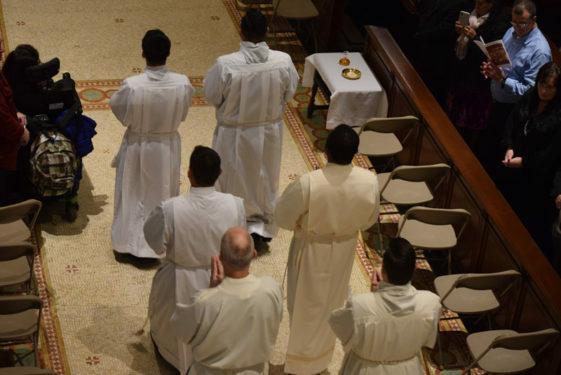 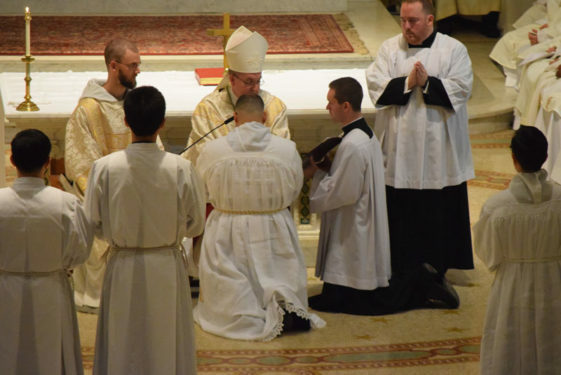 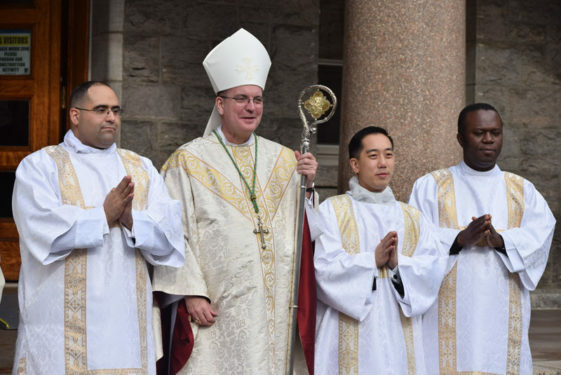 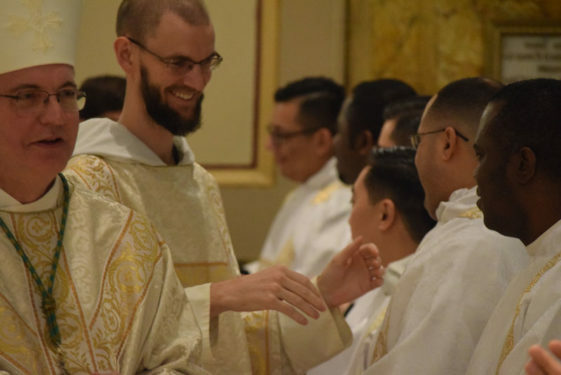 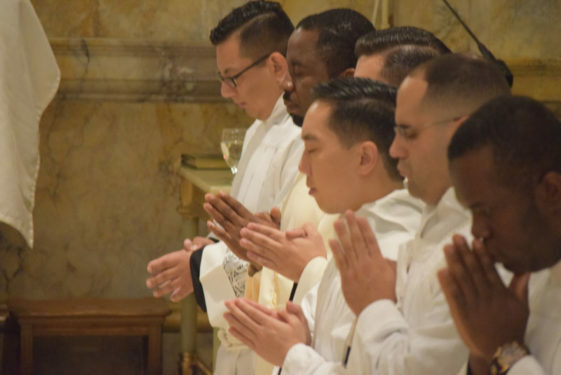 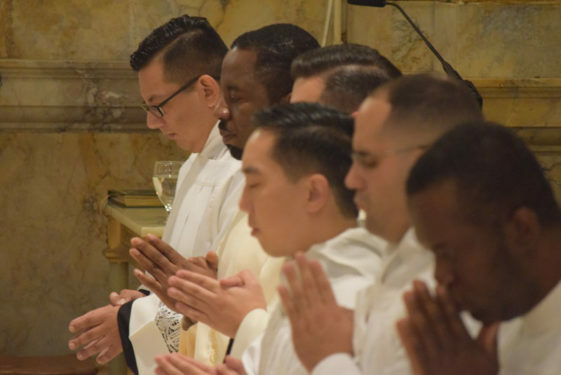 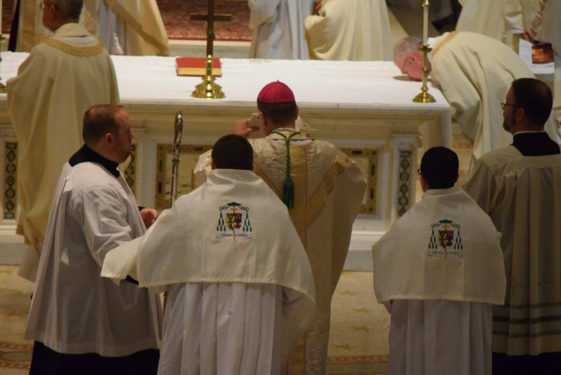 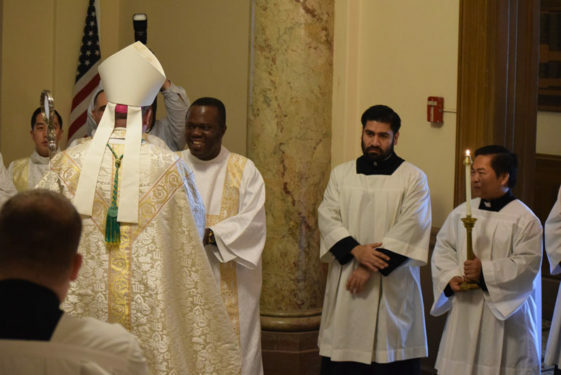 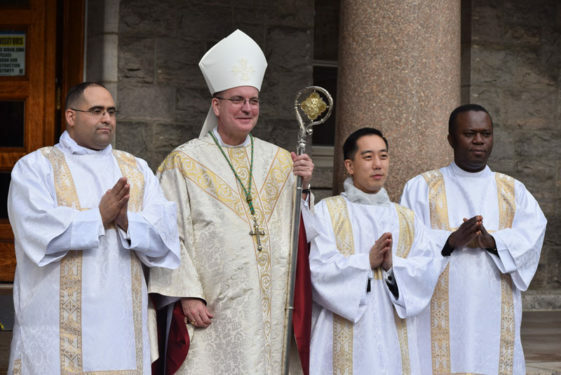 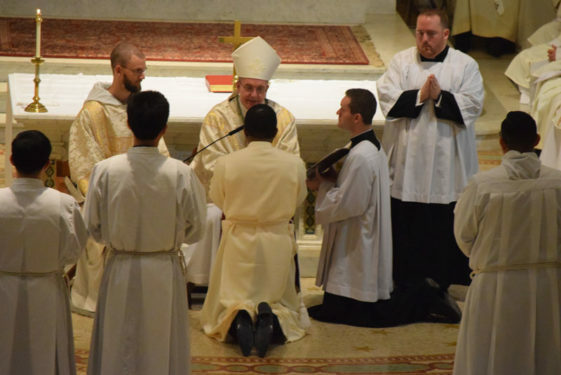 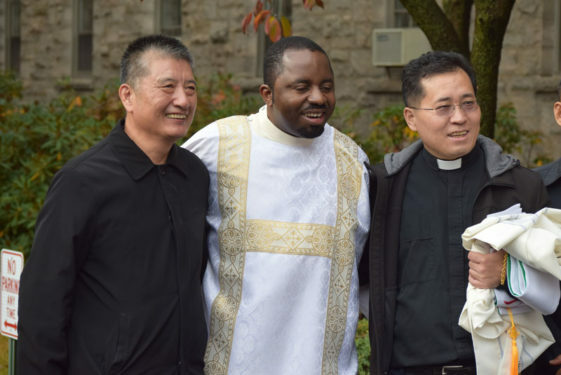 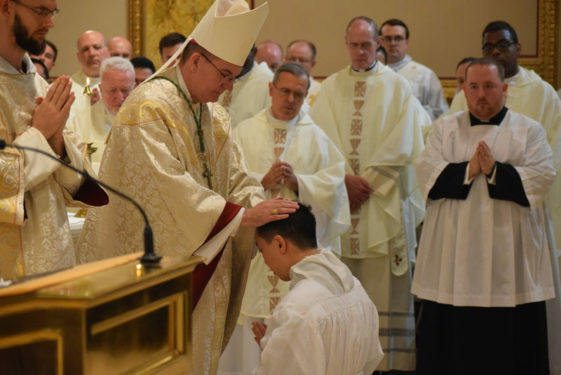 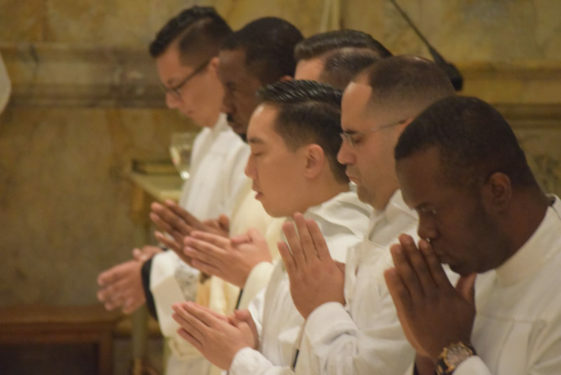 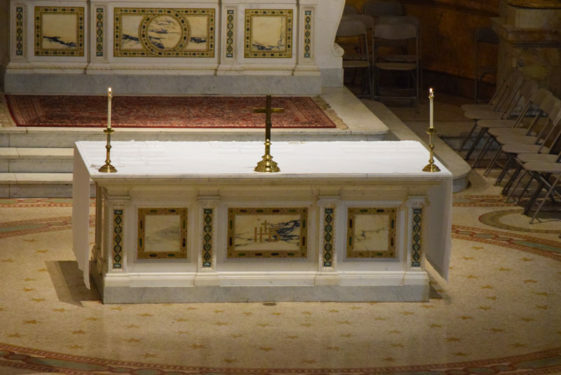 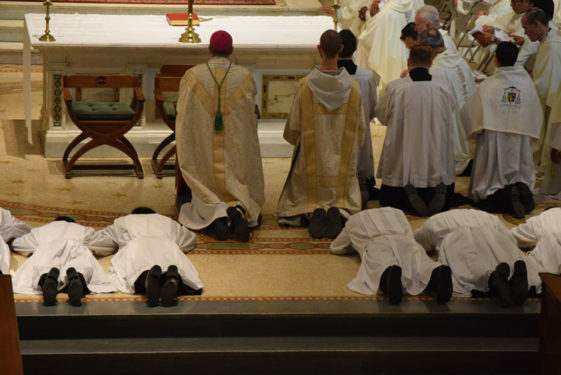 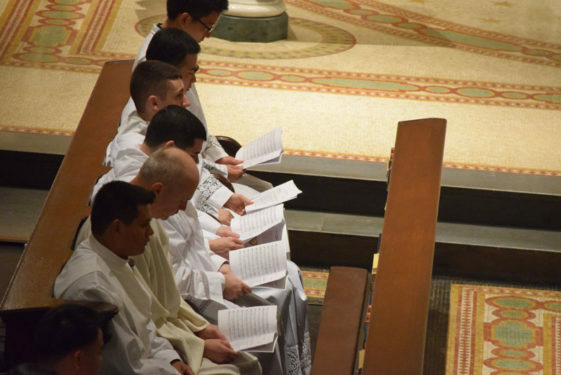 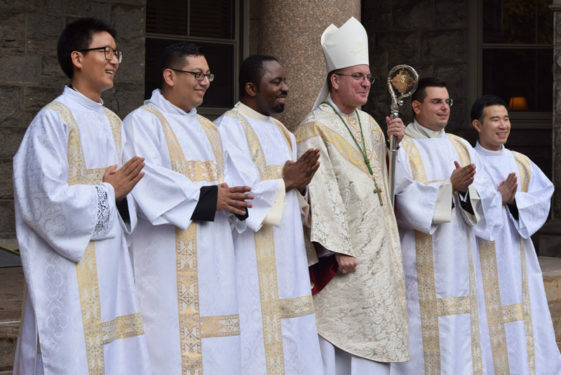 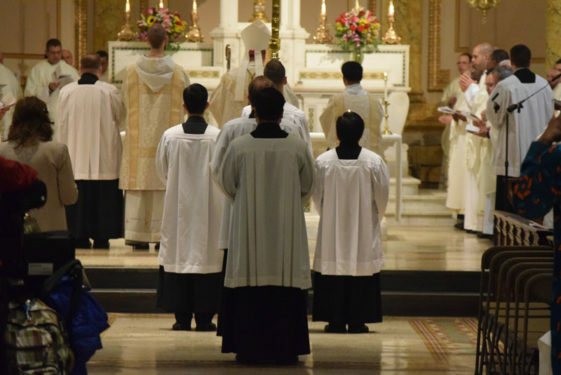 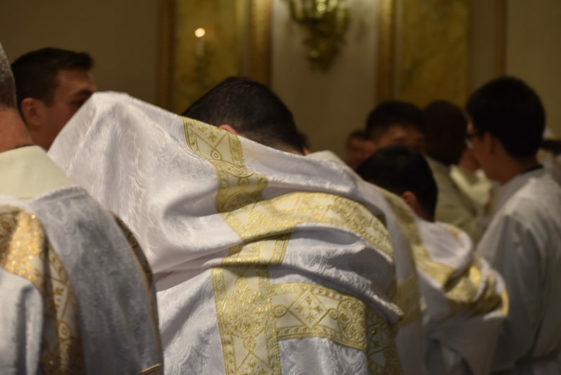 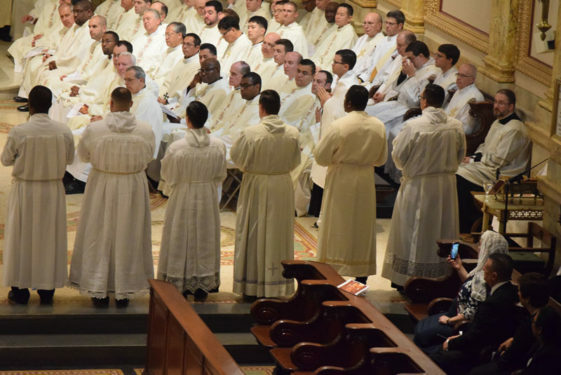 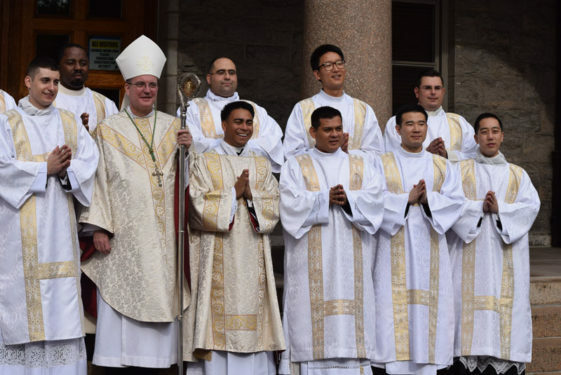 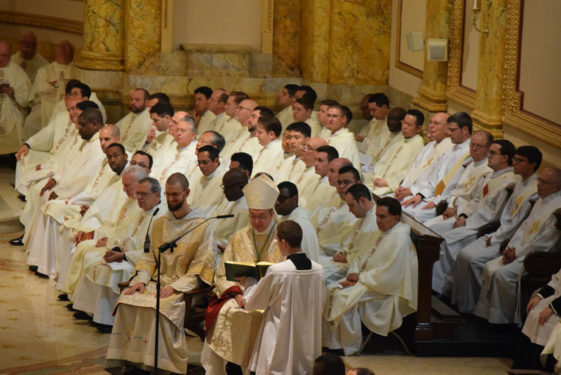 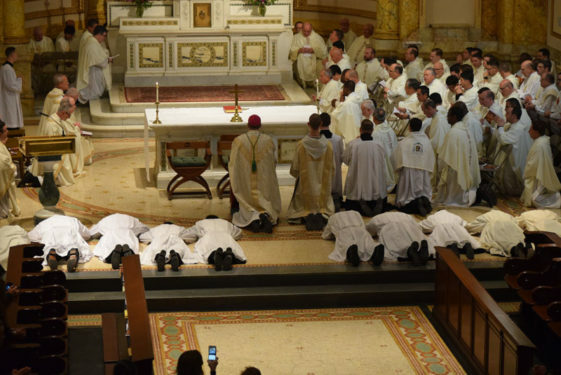 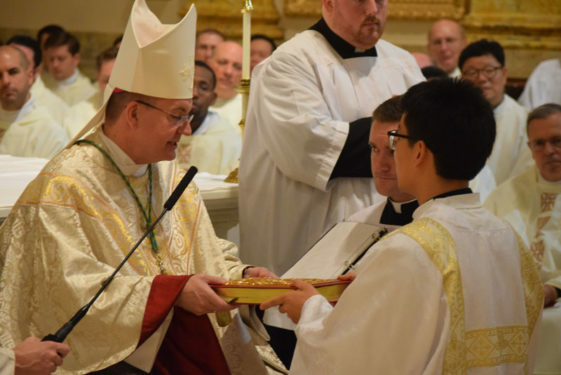 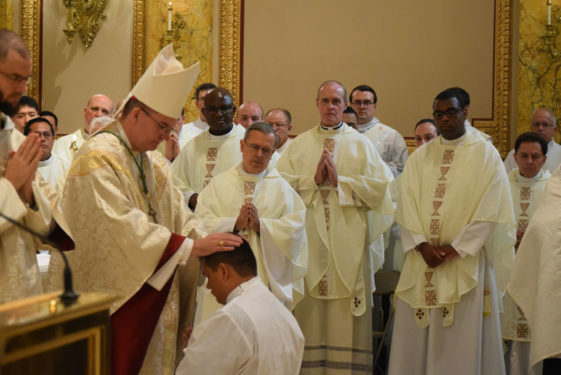 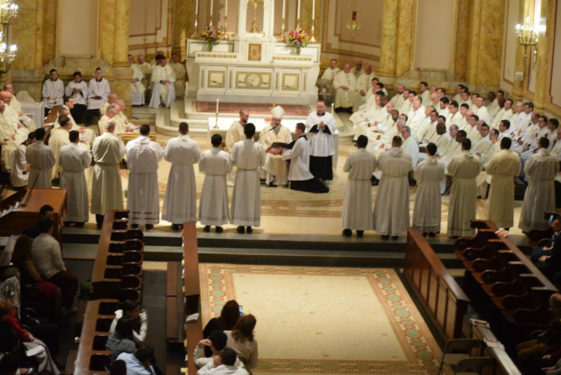 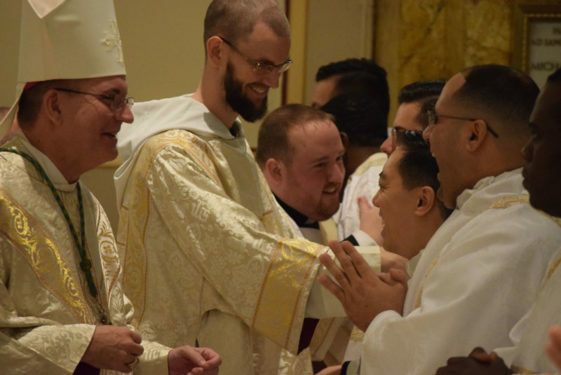 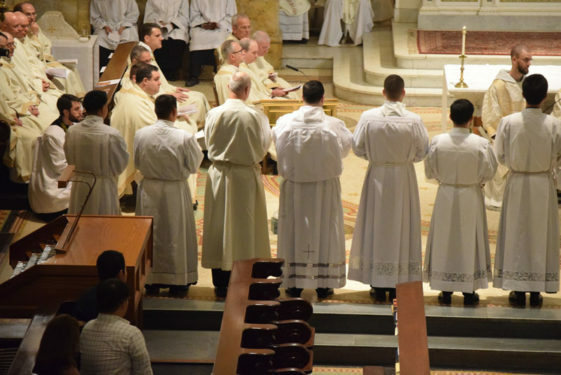 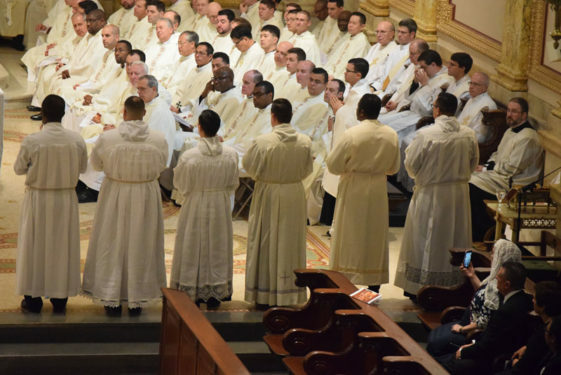 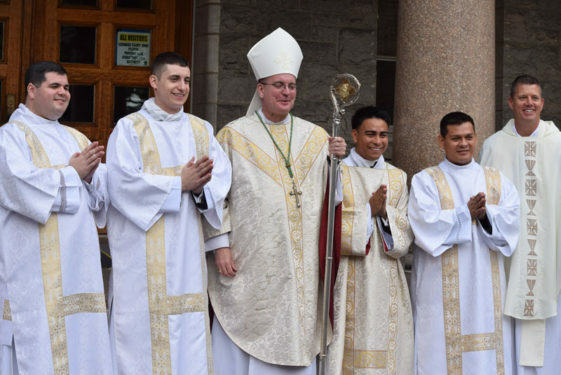 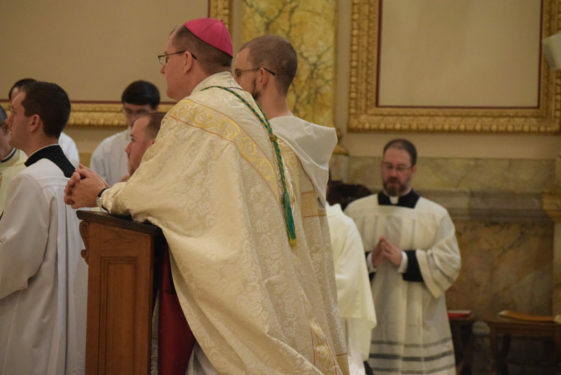 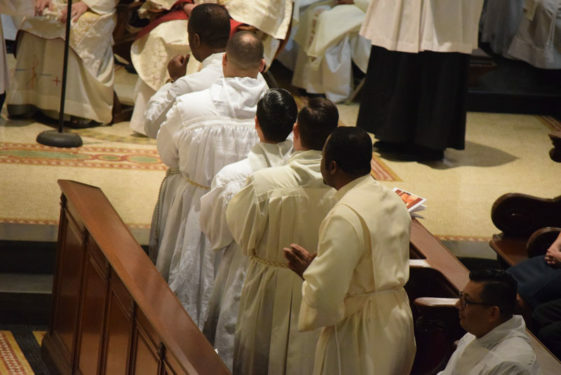 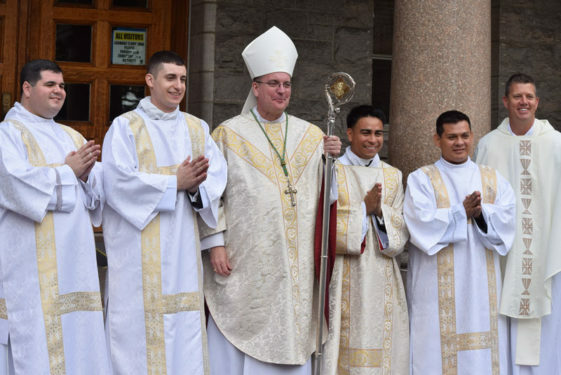 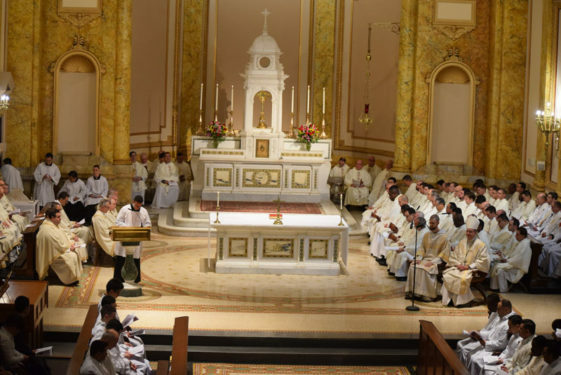 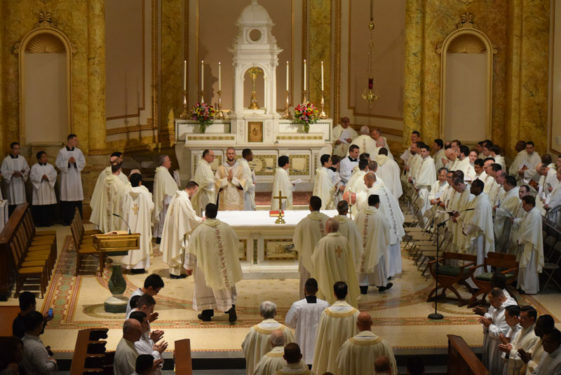 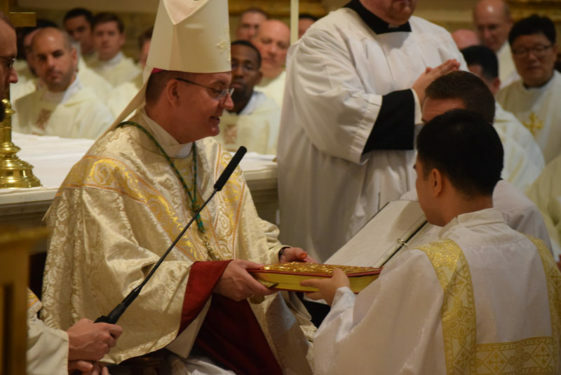 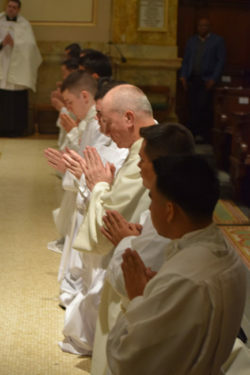 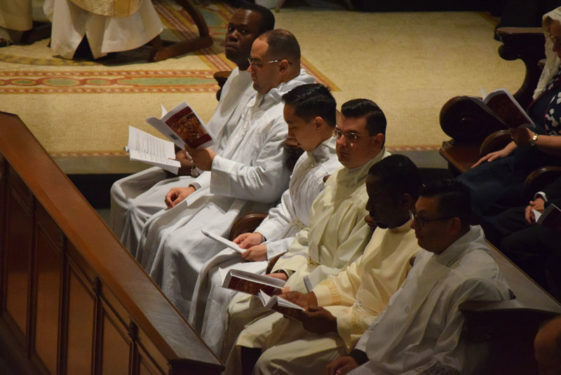 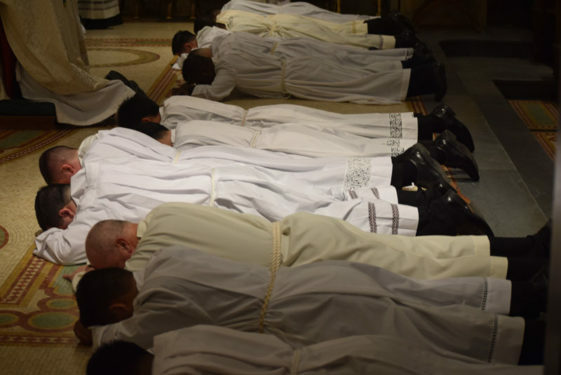 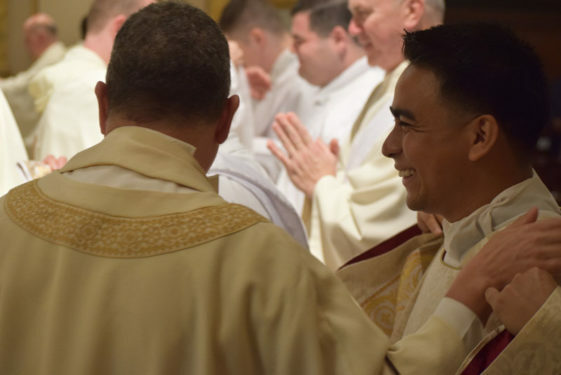 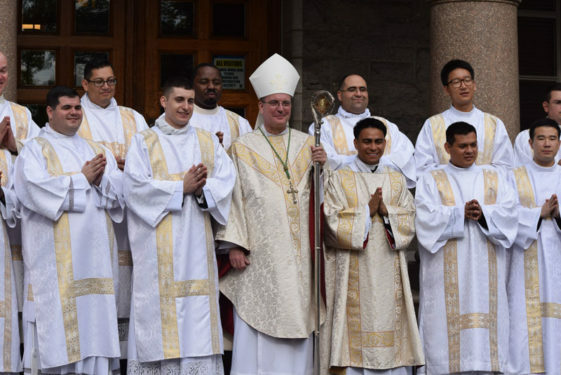 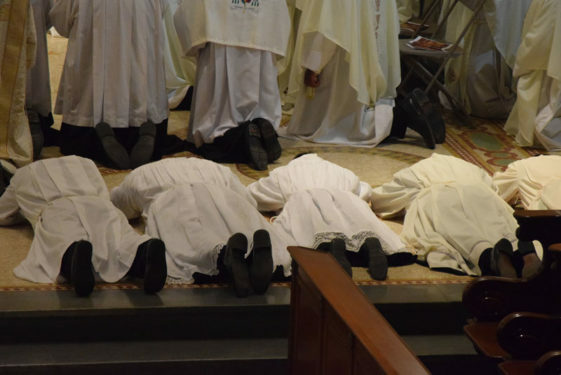 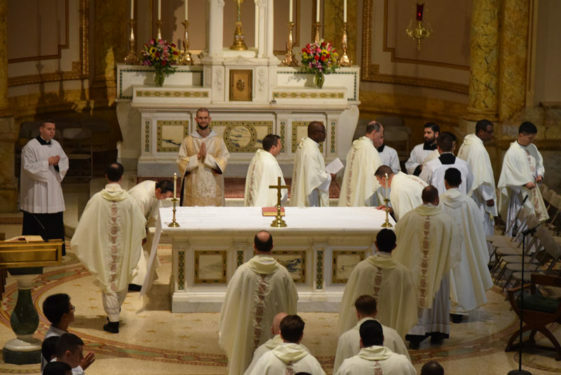 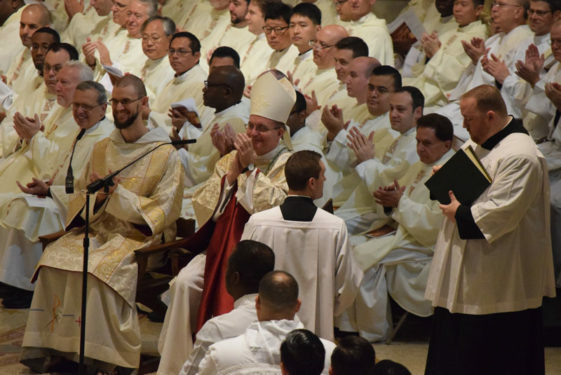 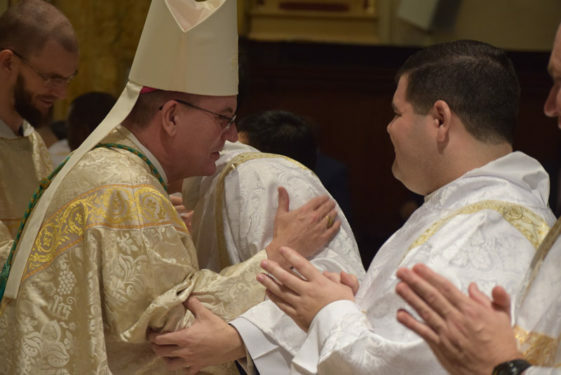 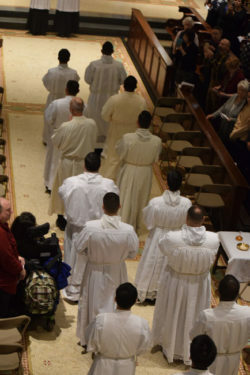 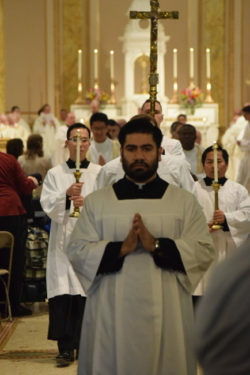 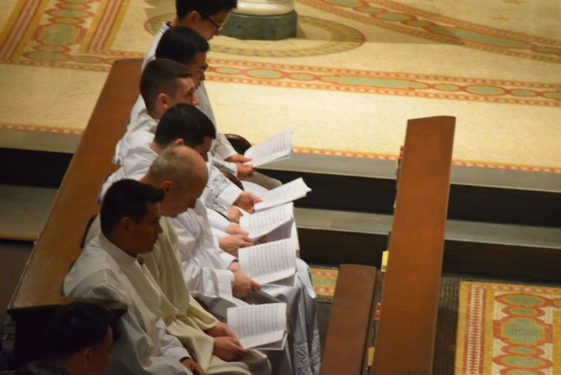 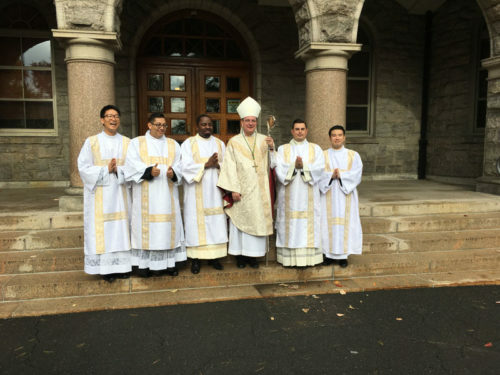 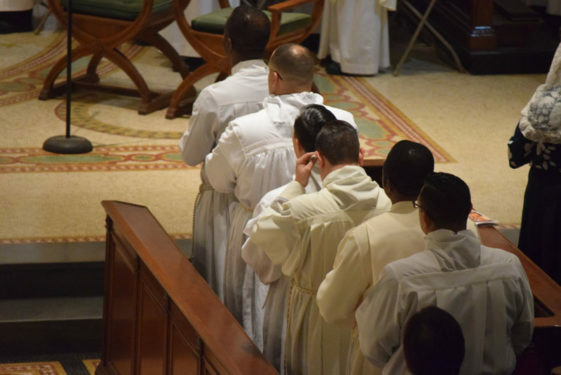 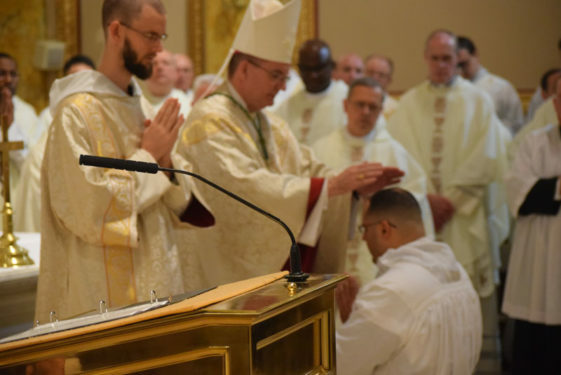 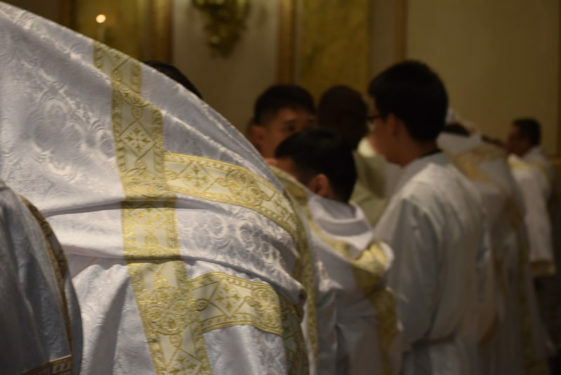 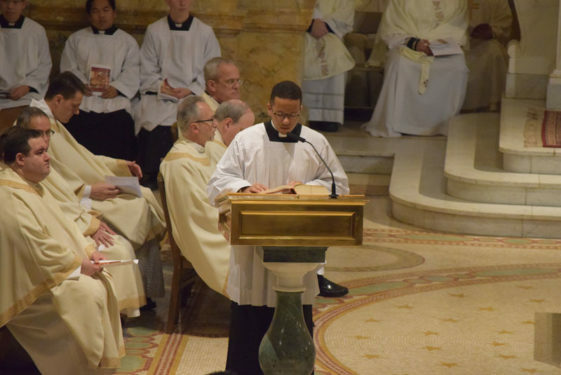 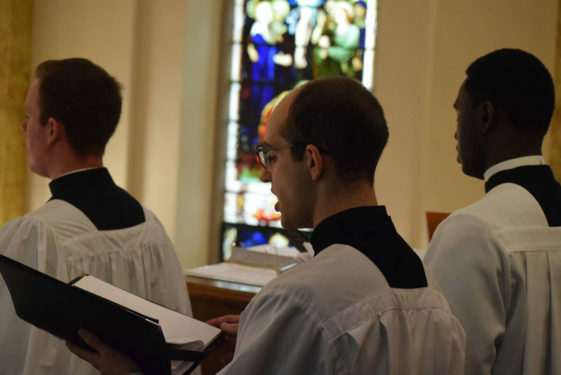 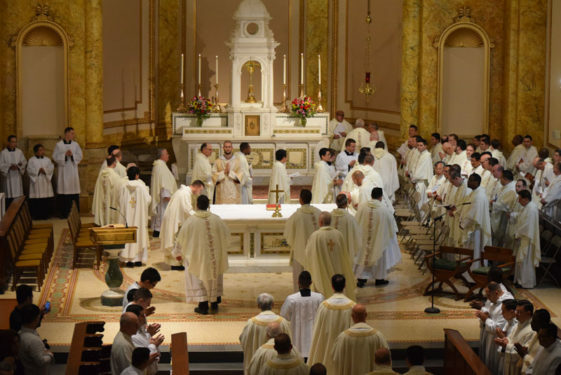 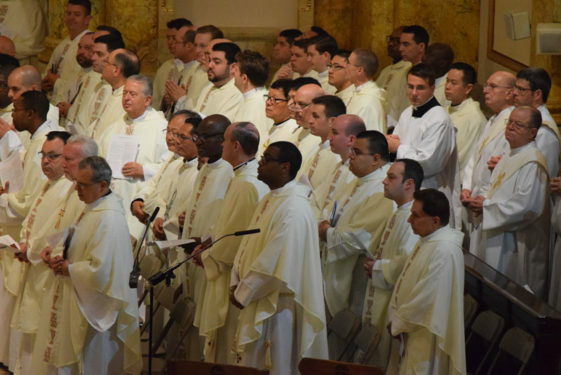 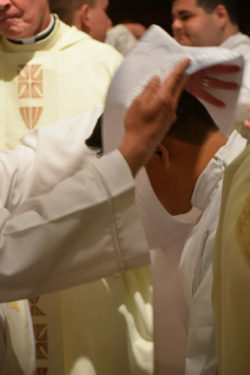 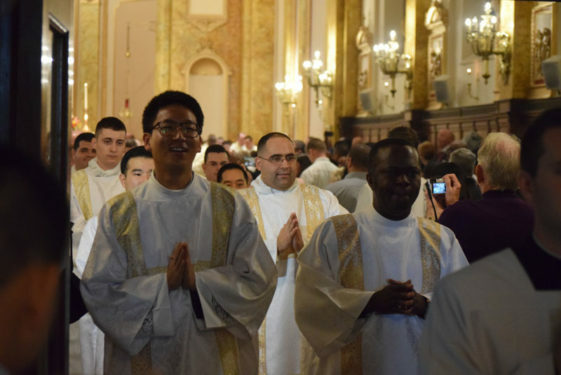 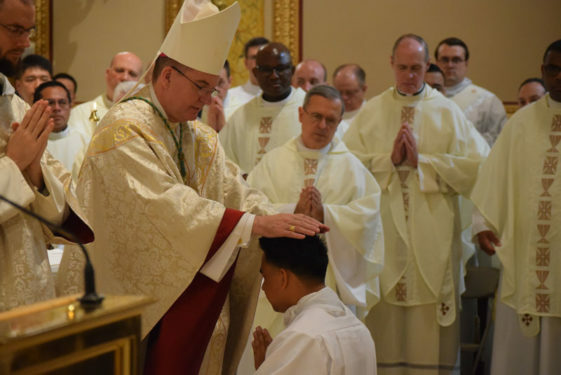 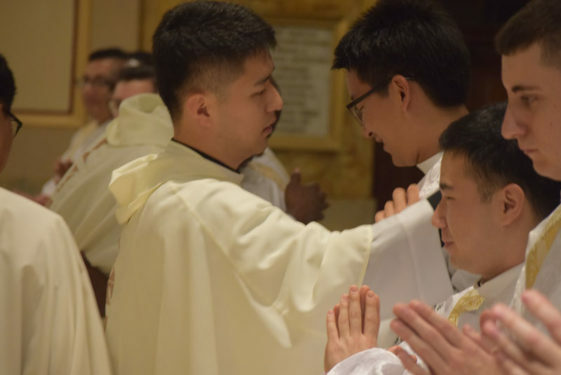 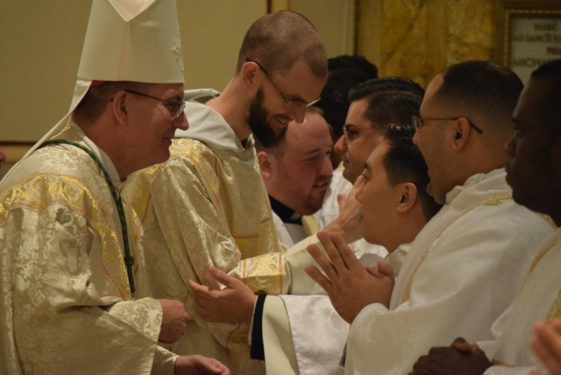 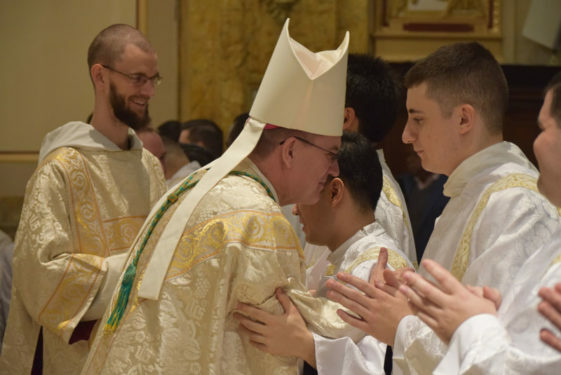 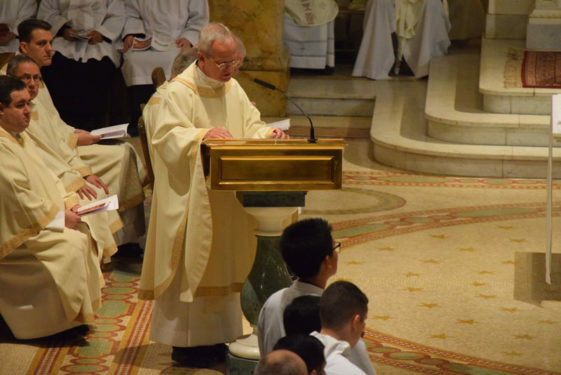 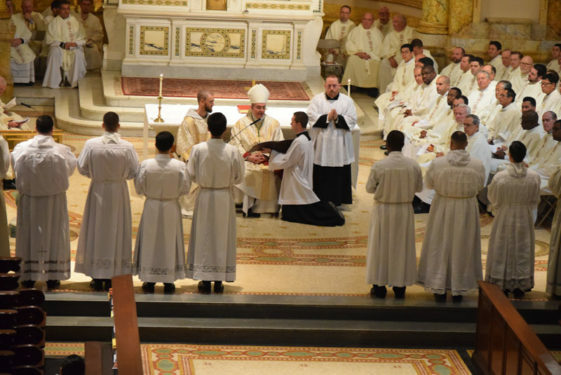 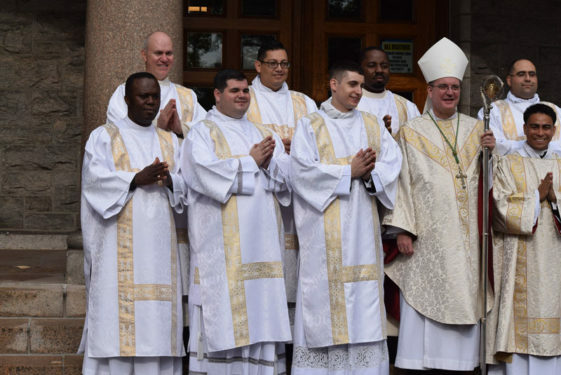 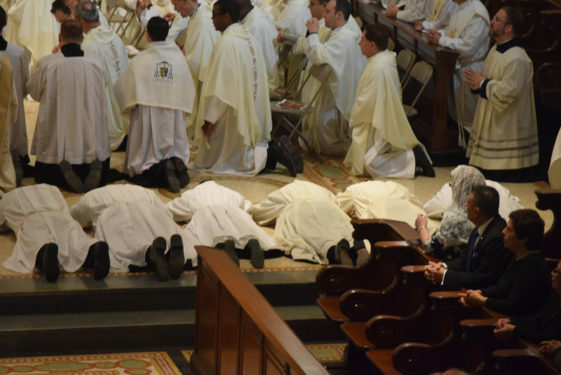 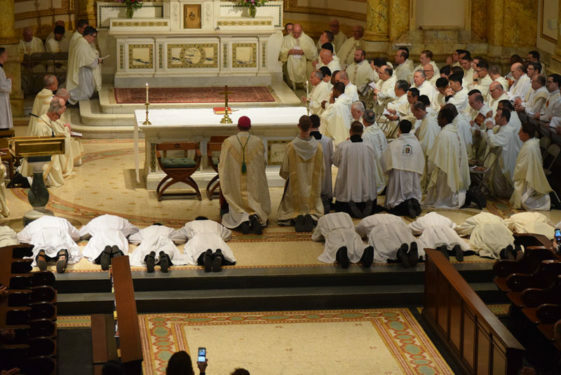 The five men from the Brooklyn Diocese are Sangbin Alex Lee, Edwin Ortiz, Johnpaul Obiaeri, Bishop Barres, Michael Falce and Myangsik Andrew Yang. 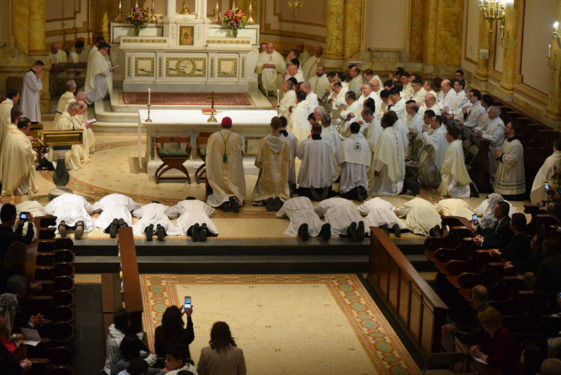 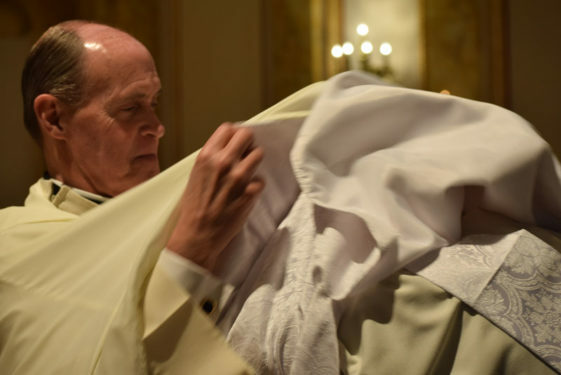 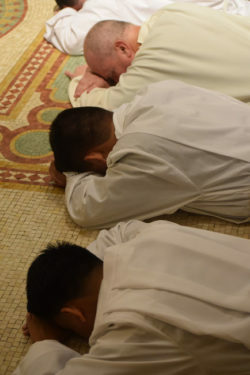 “Today is so exciting, these 13 men are from all over the world … It is a culmination and a beginning of some very powerful formation and real commitment to holiness and commitment to a missionary spirit and a beautiful embrace of the cross, the willingness to be configured to the cross of Jesus Christ. 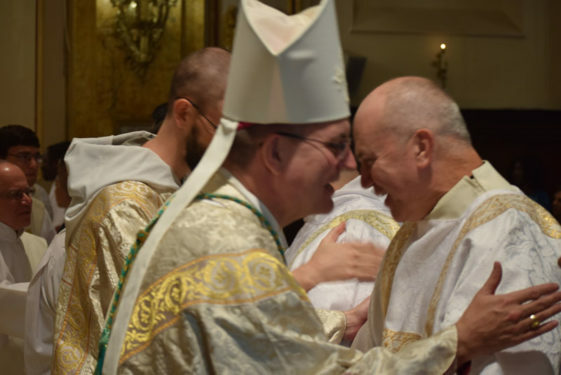 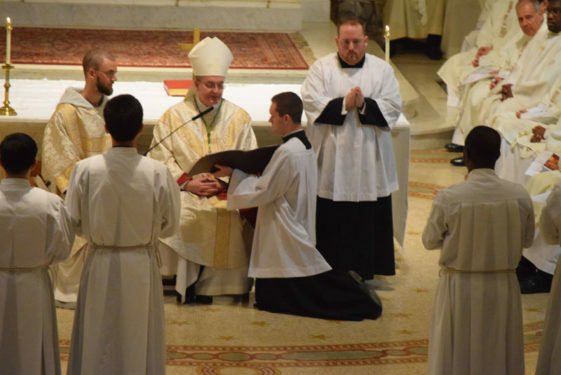 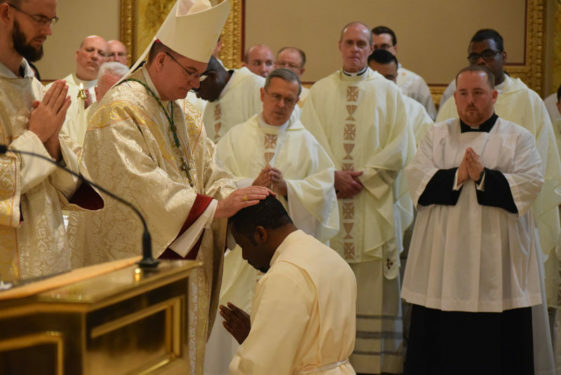 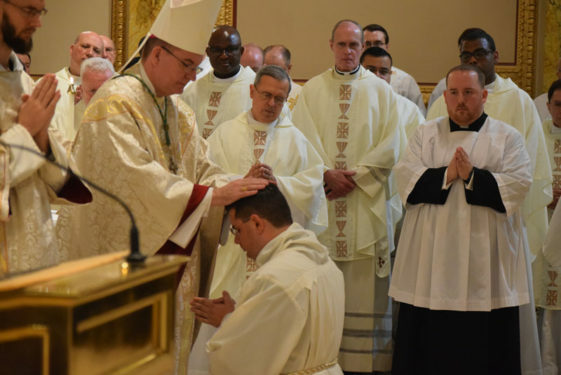 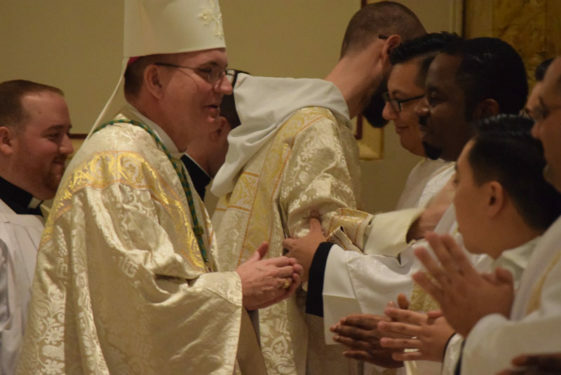 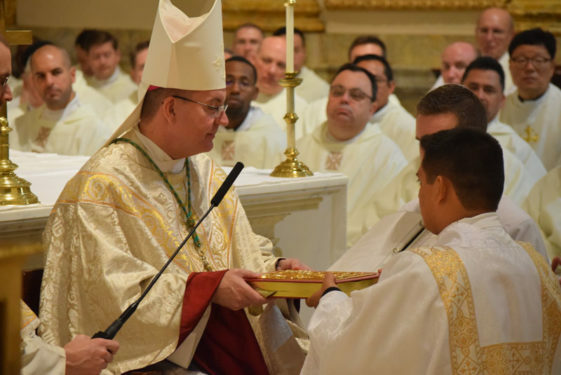 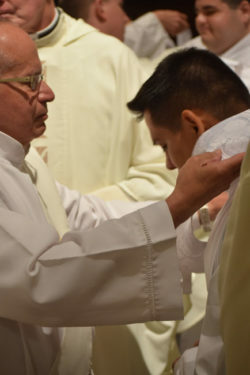 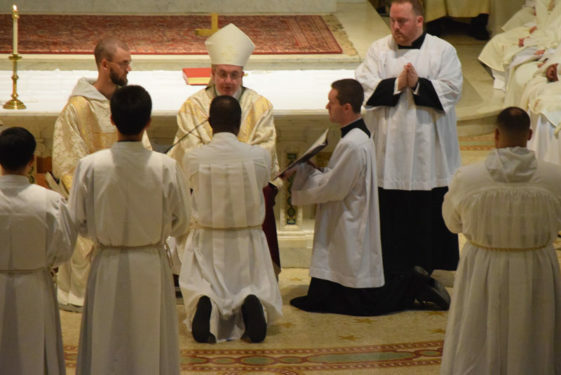 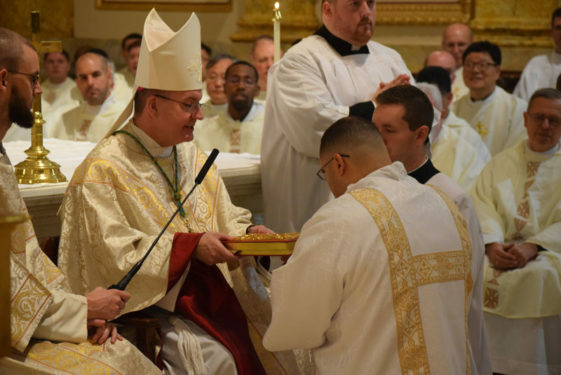 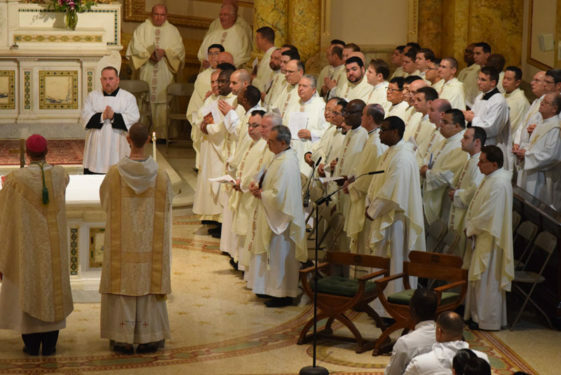 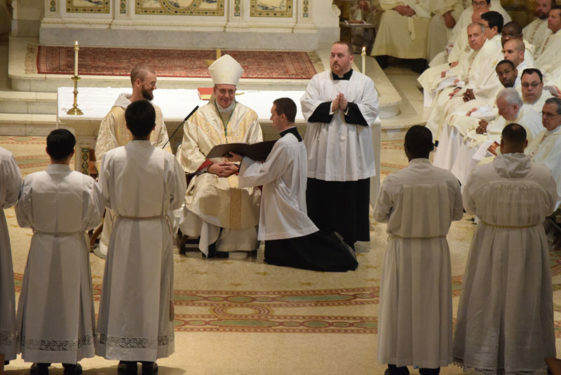 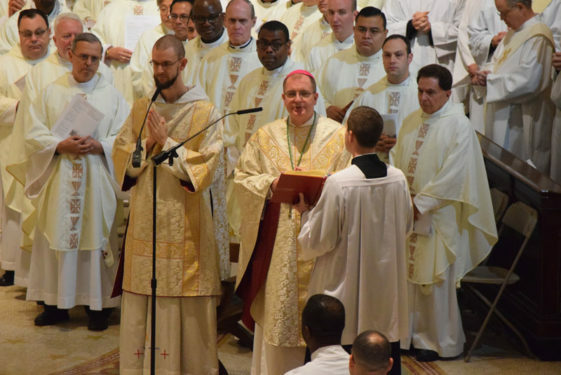 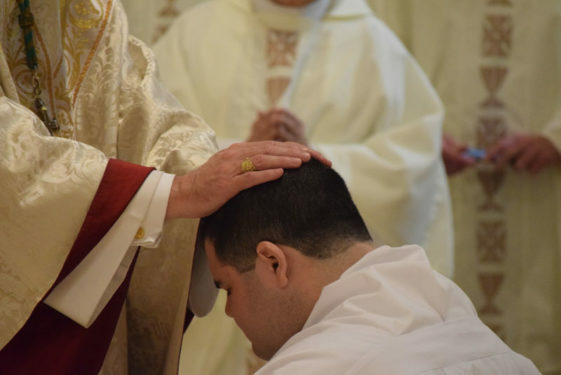 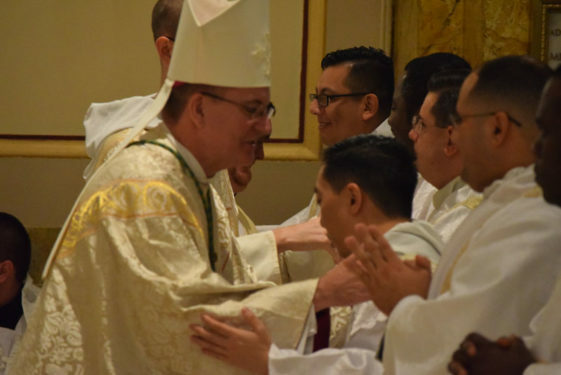 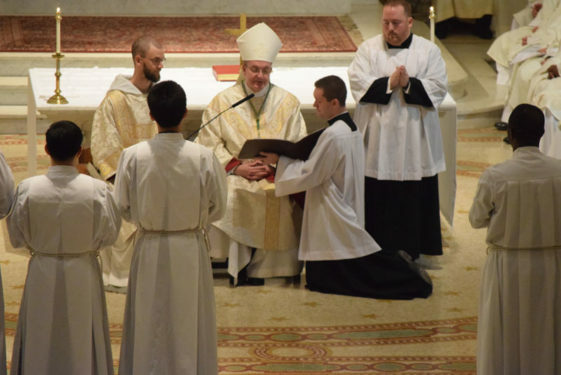 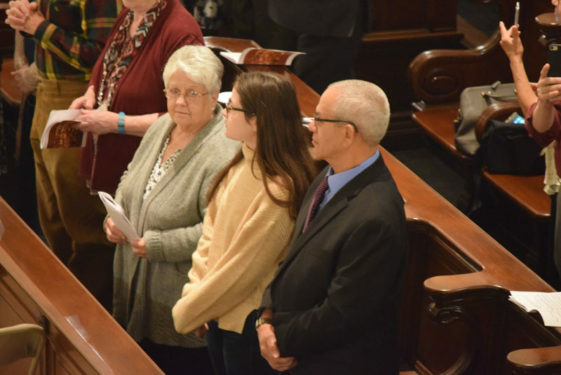 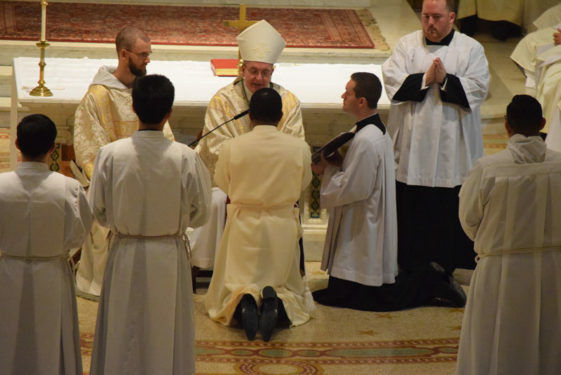 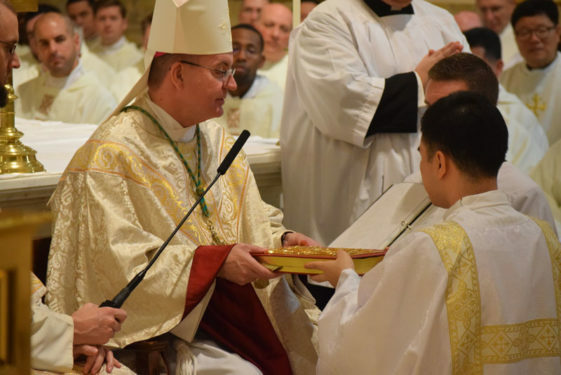 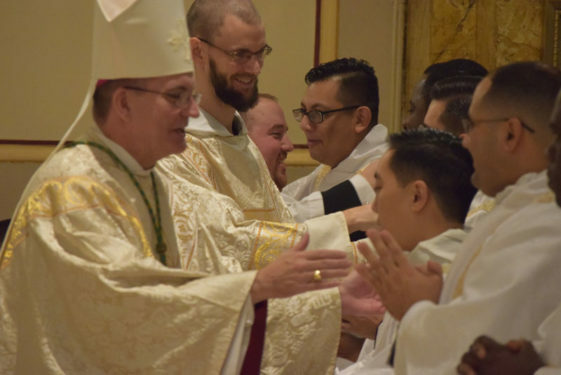 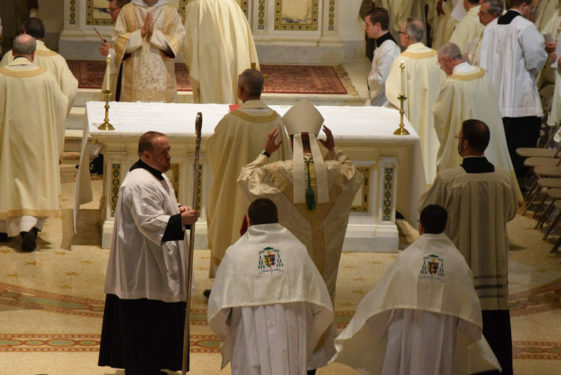 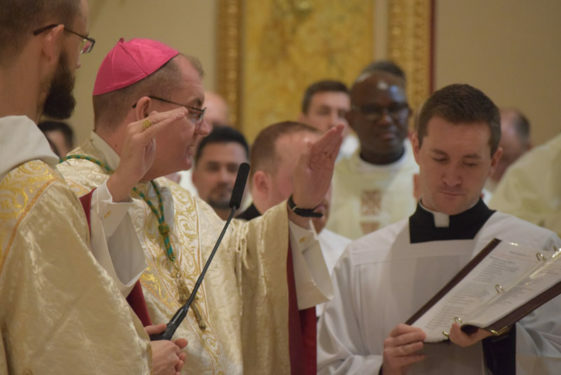 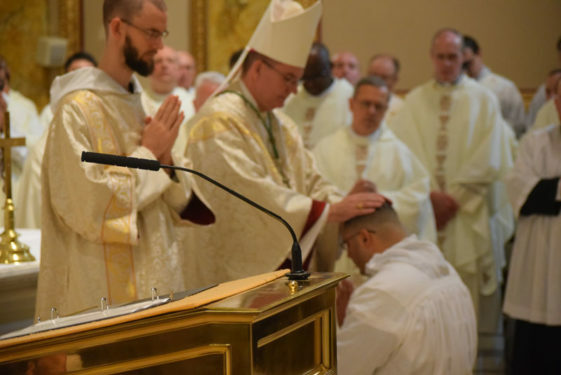 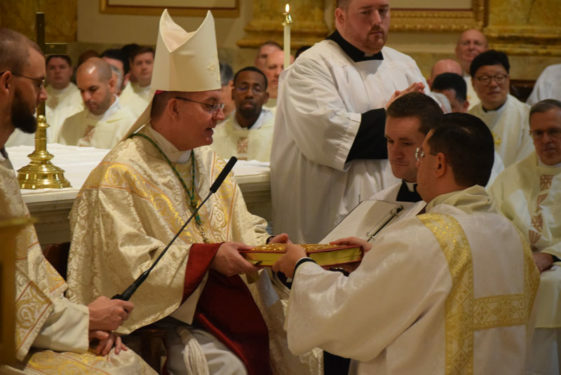 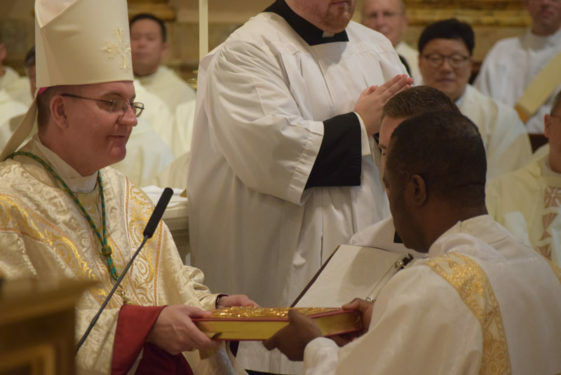 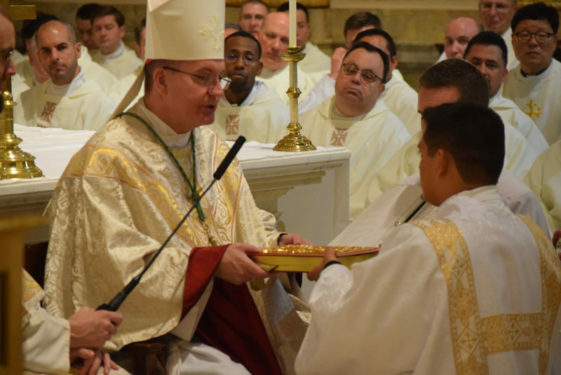 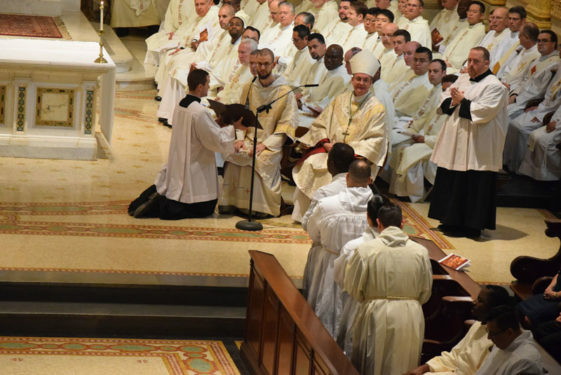 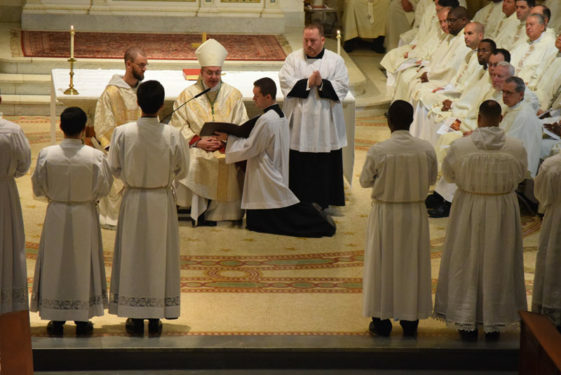 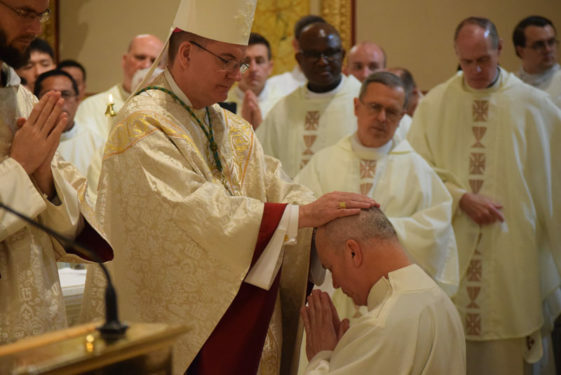 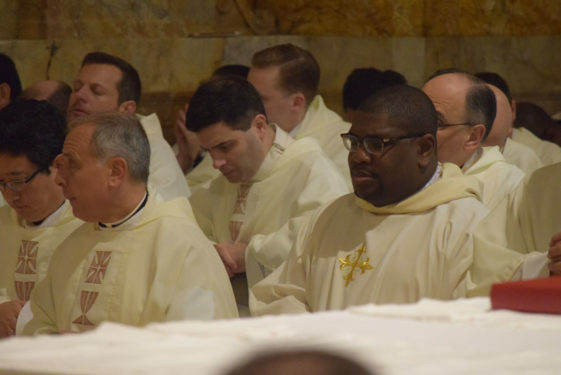 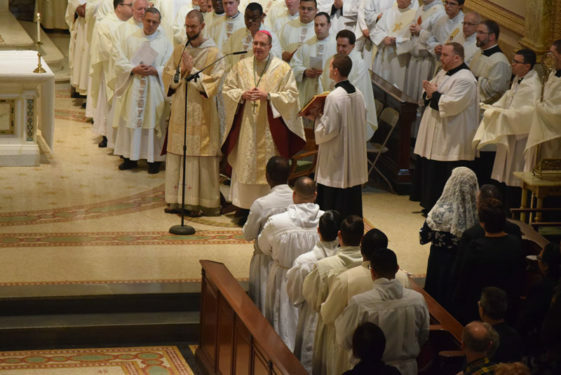 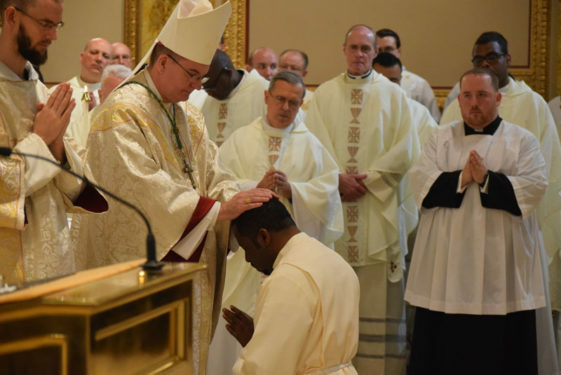 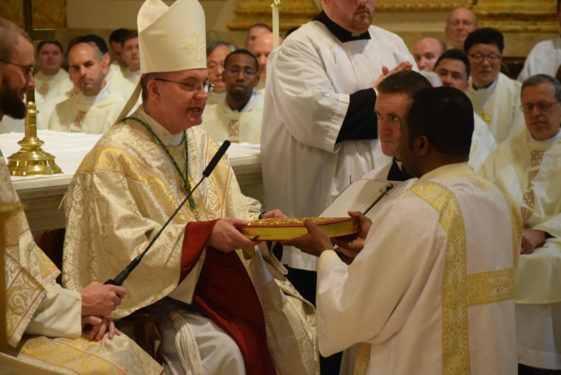 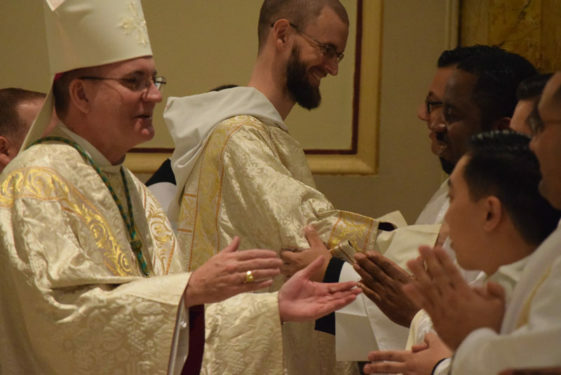 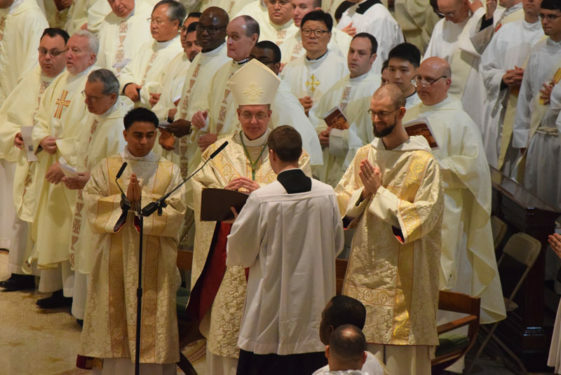 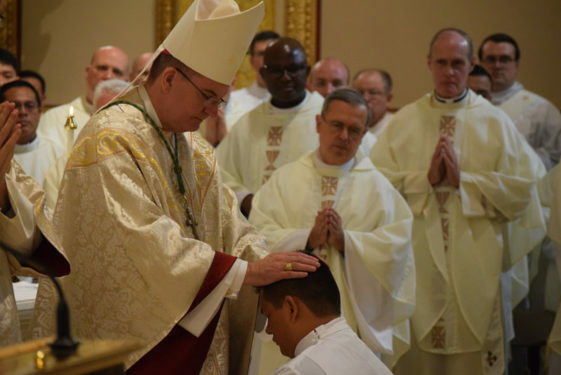 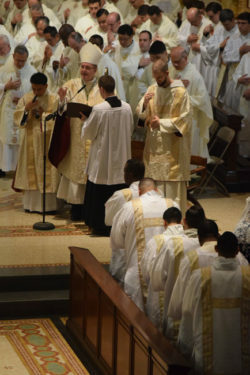 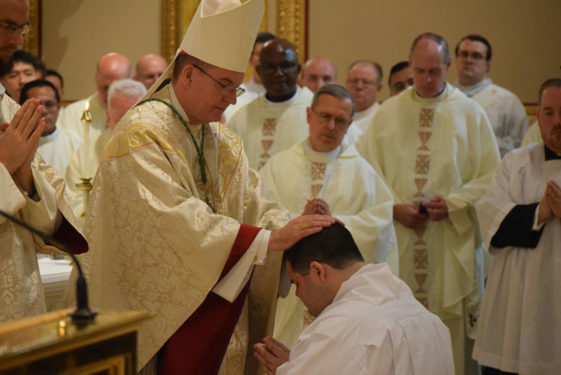 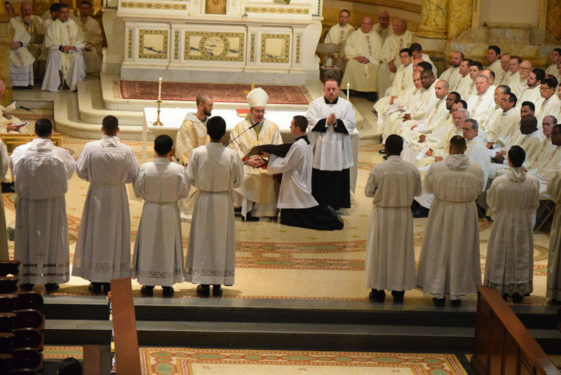 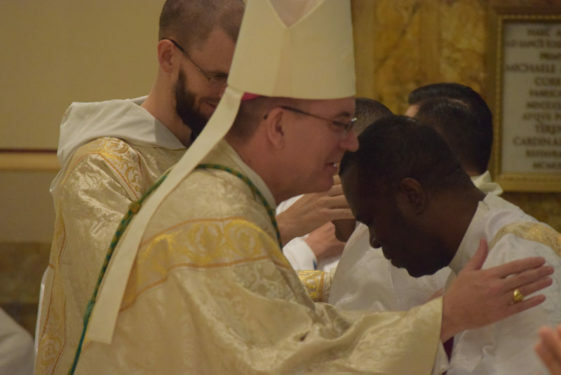 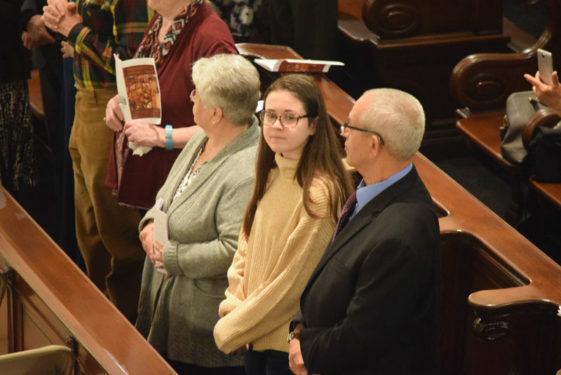 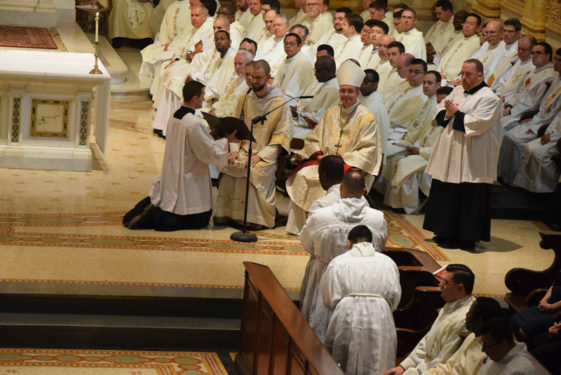 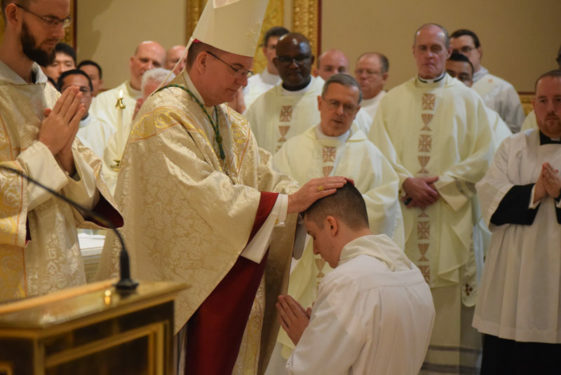 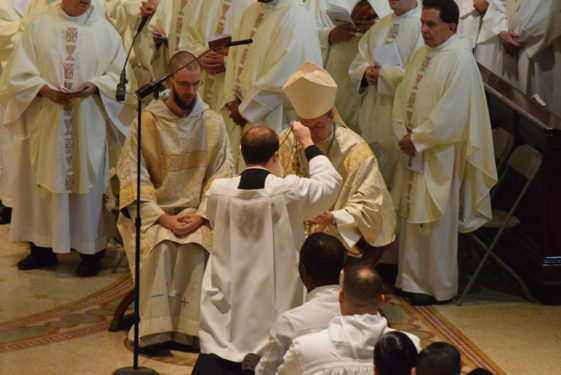 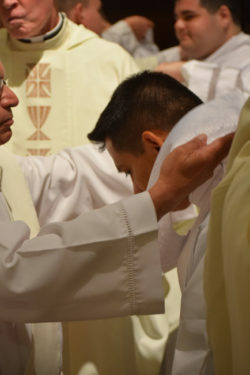 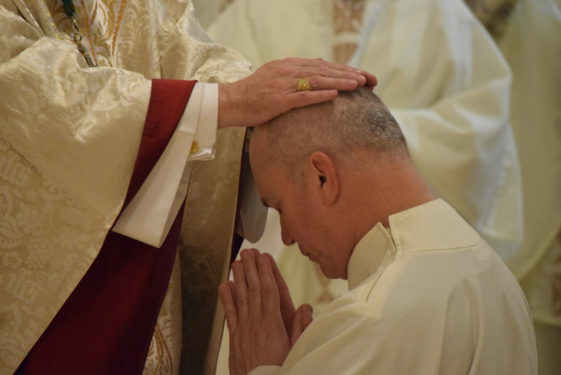 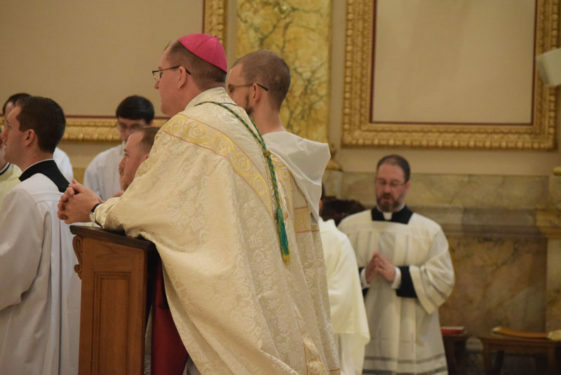 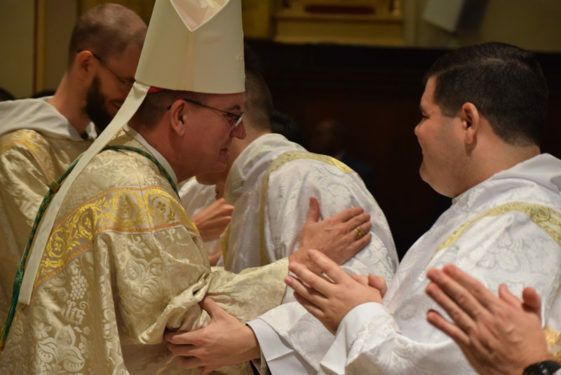 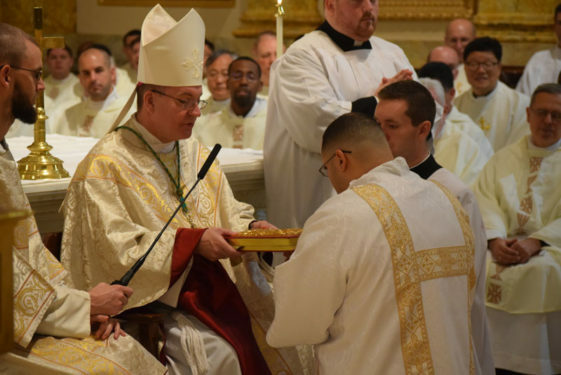 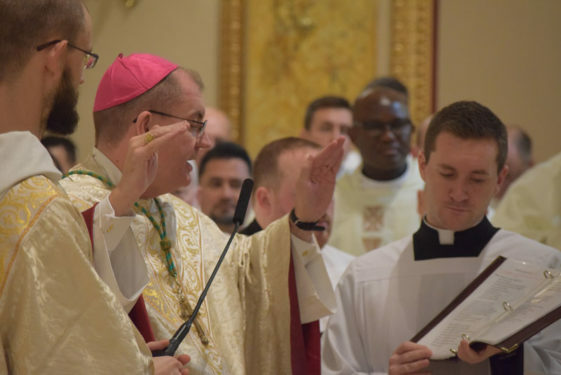 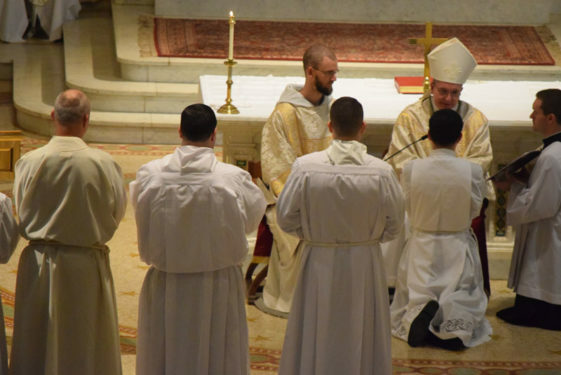 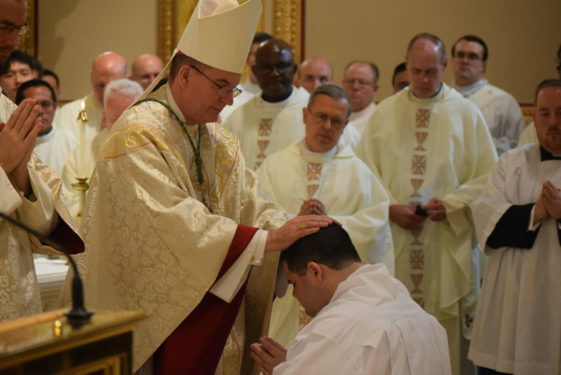 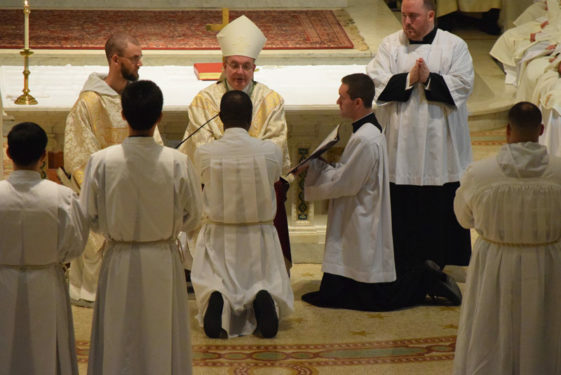 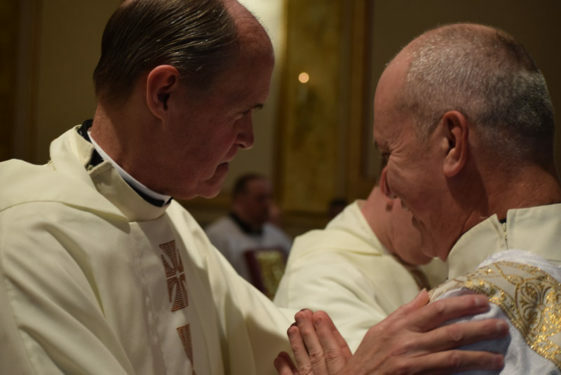 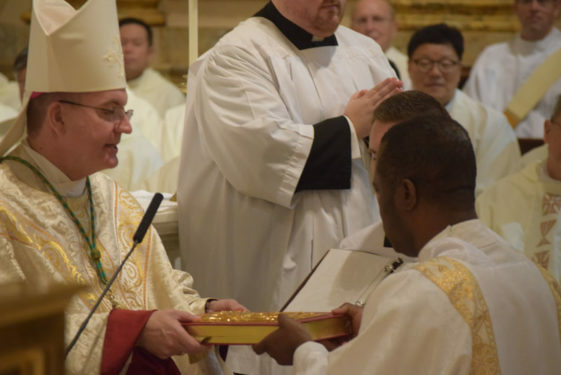 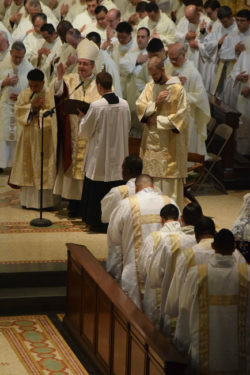 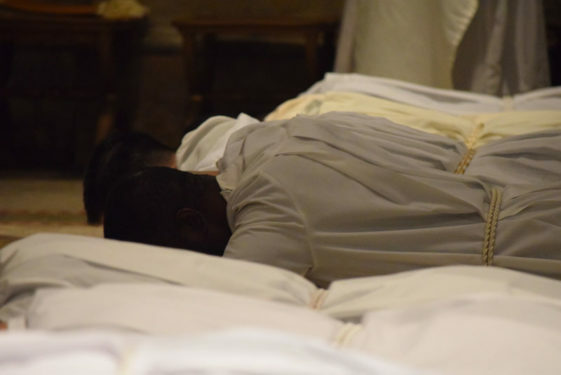 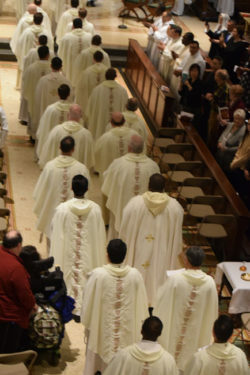 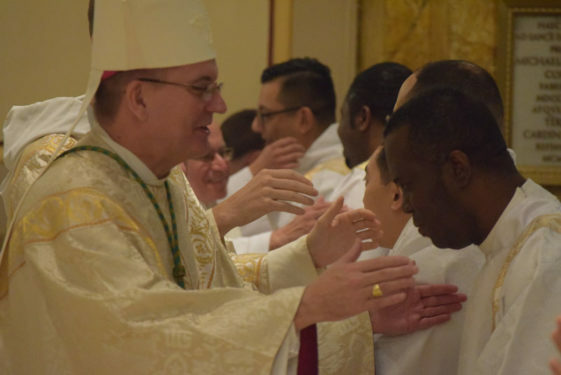 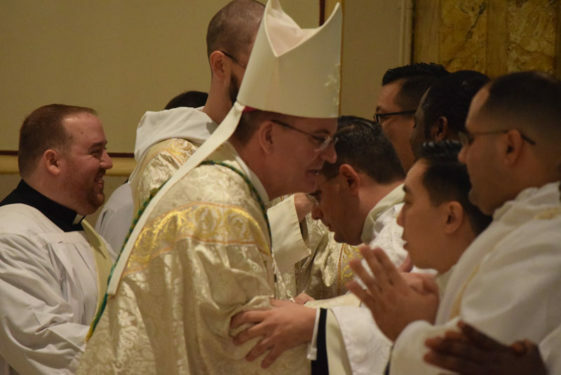 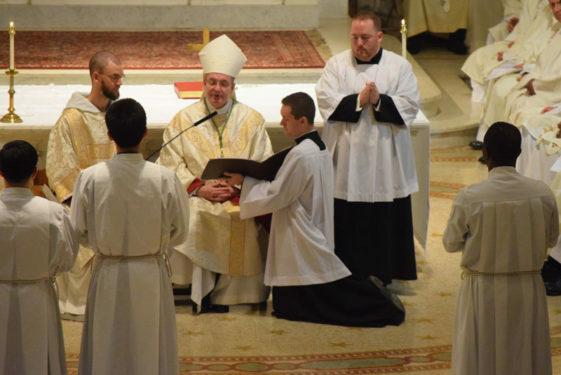 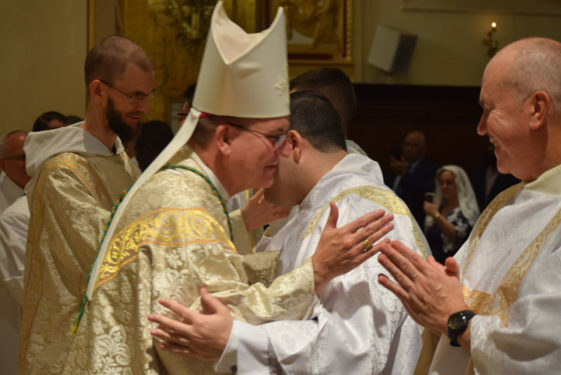 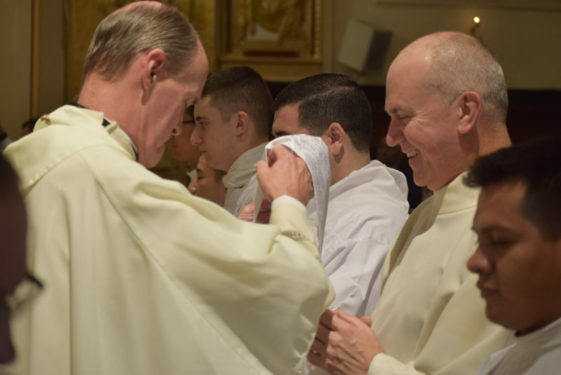 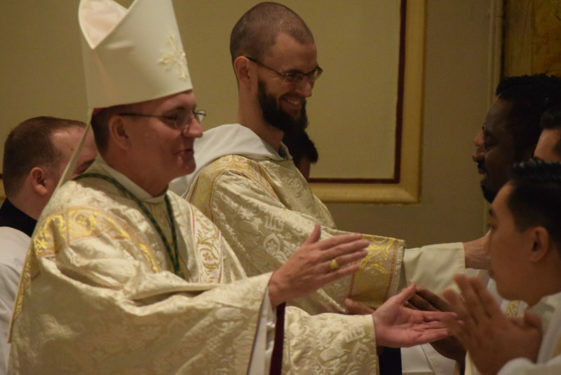 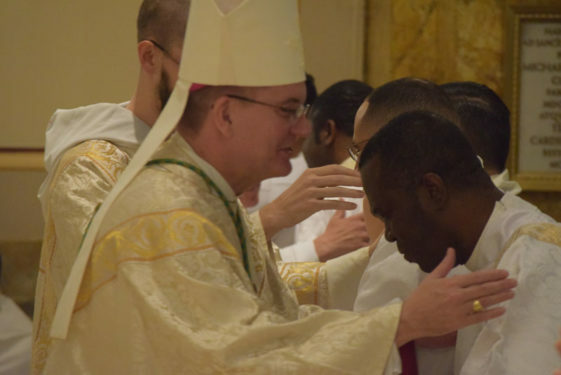 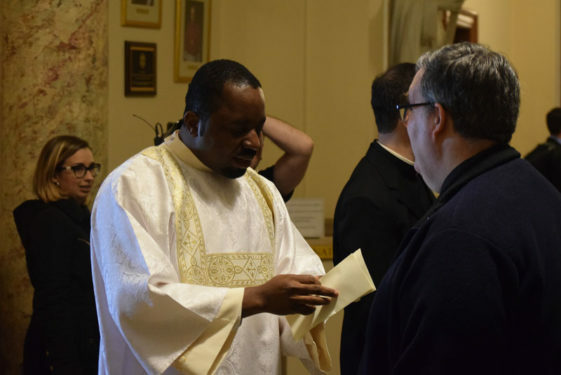 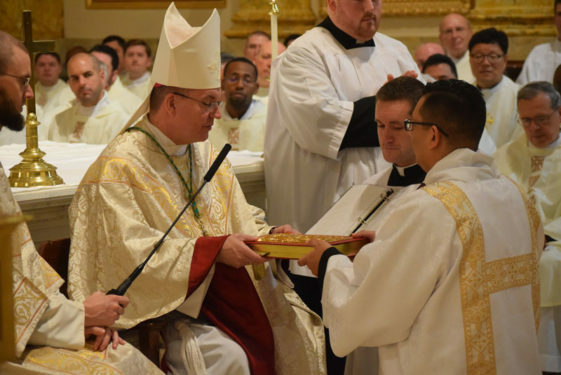 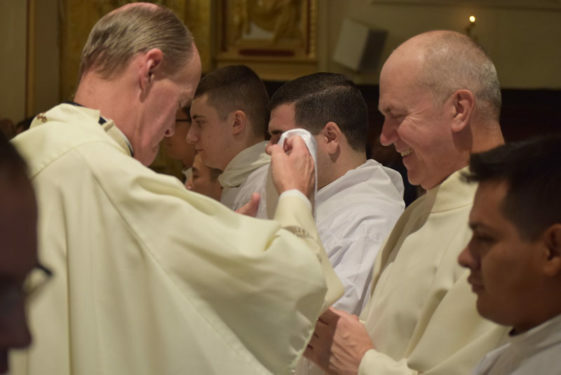 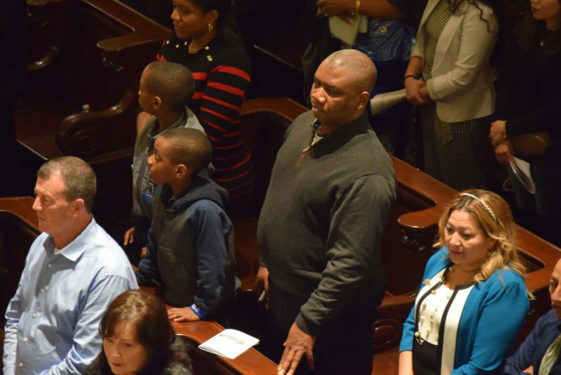 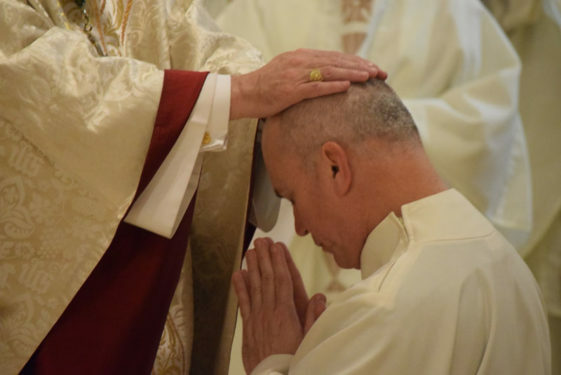 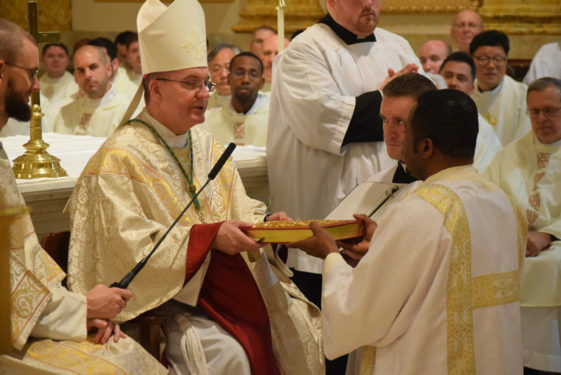 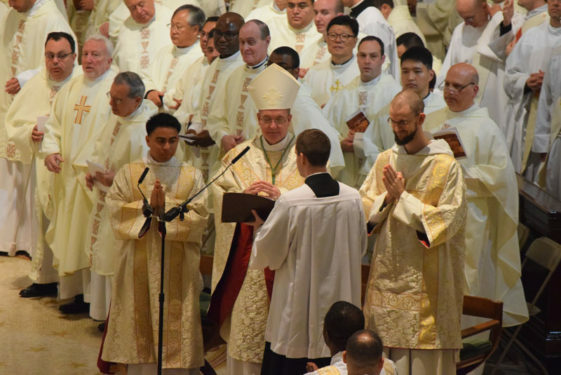 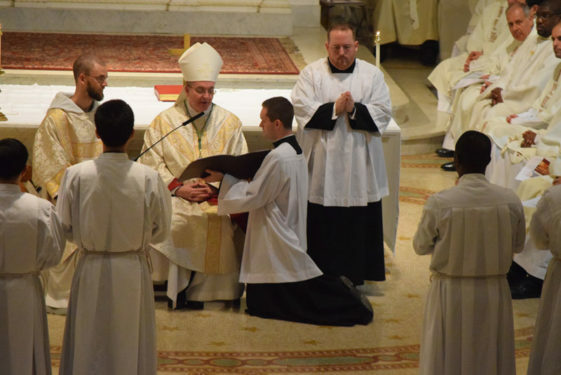 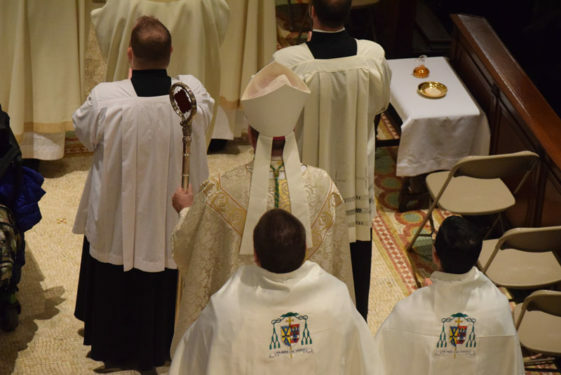 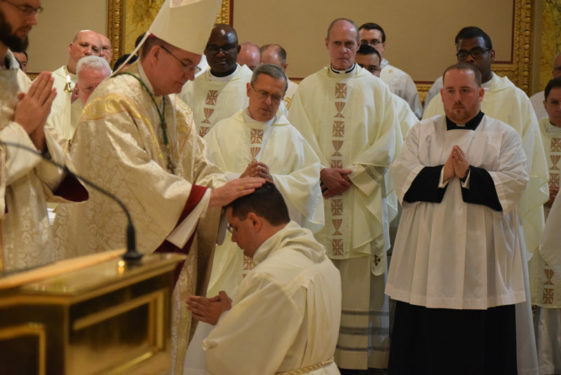 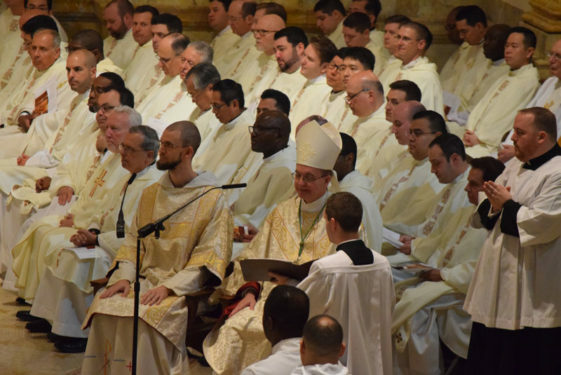 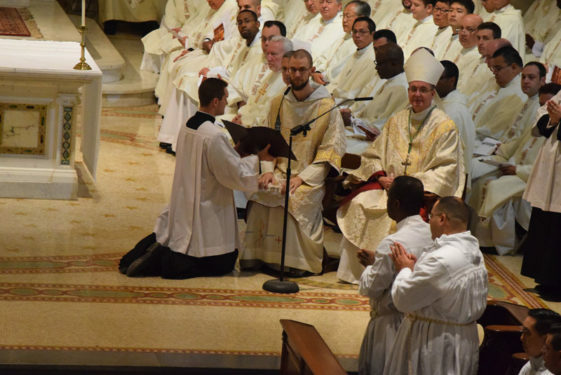 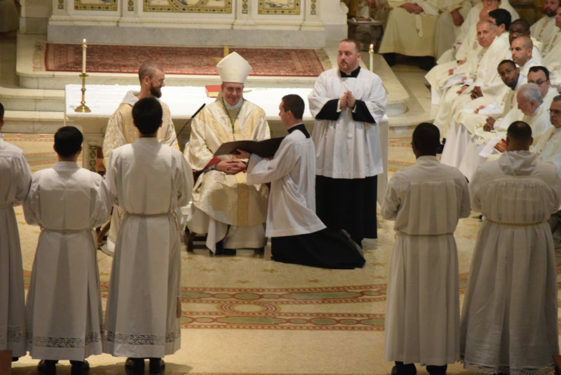 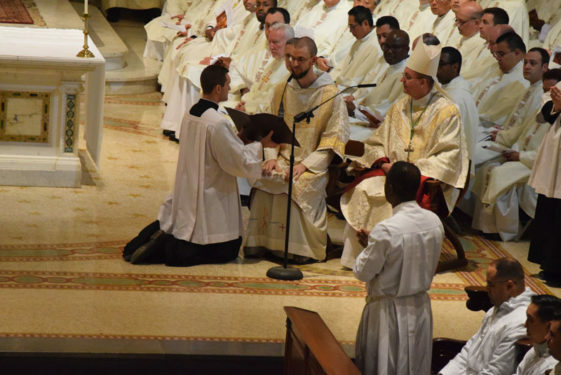 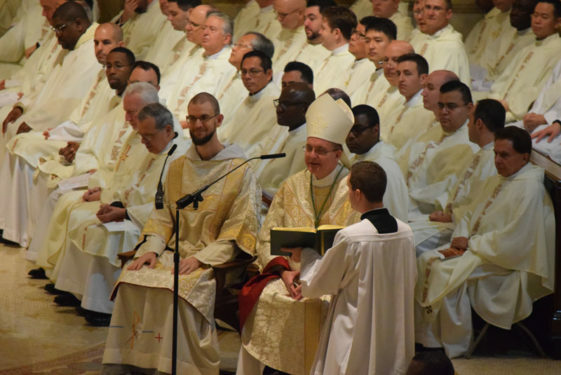 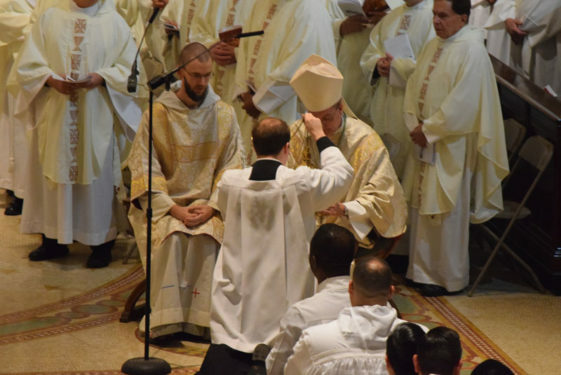 It is a powerful day as they are ordained to the diaconate and to begin their mission of service to the church,” Bishop Barres said. 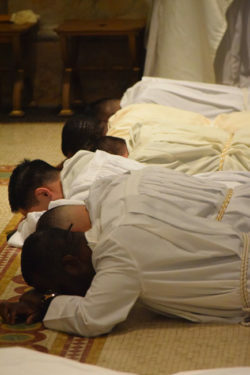 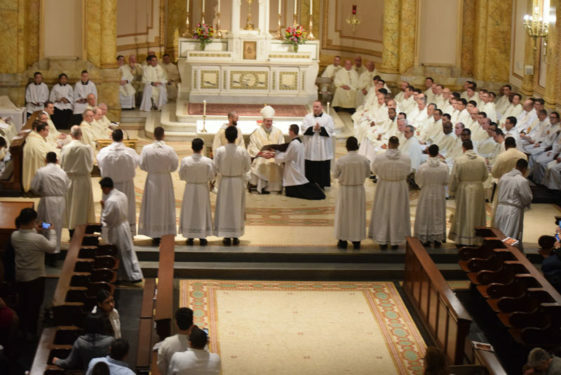 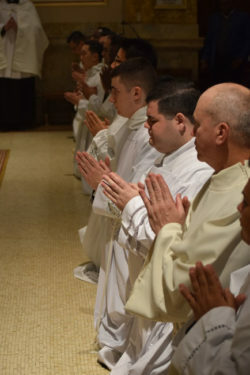 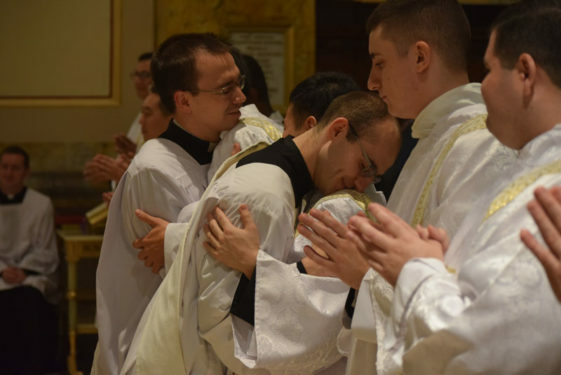 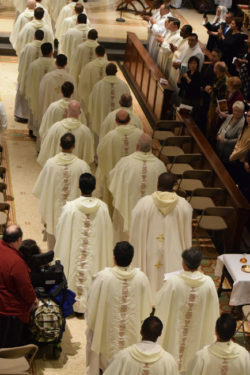 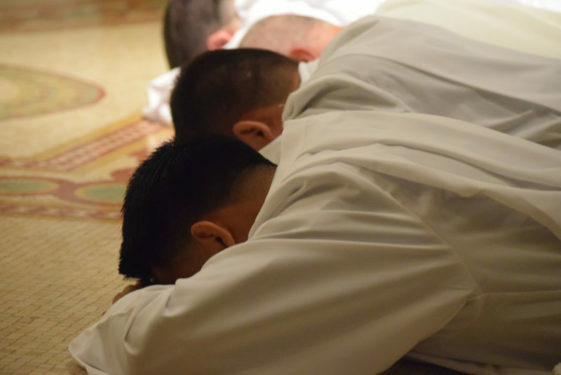 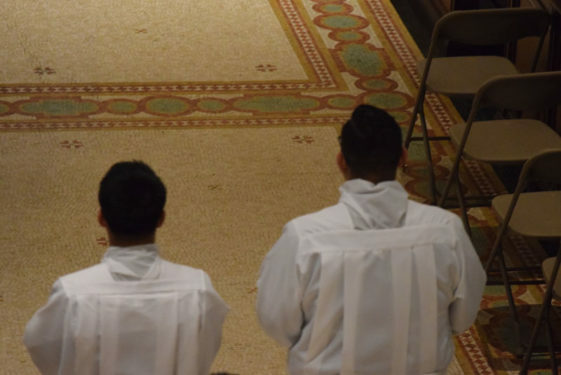 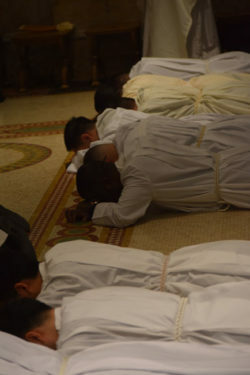 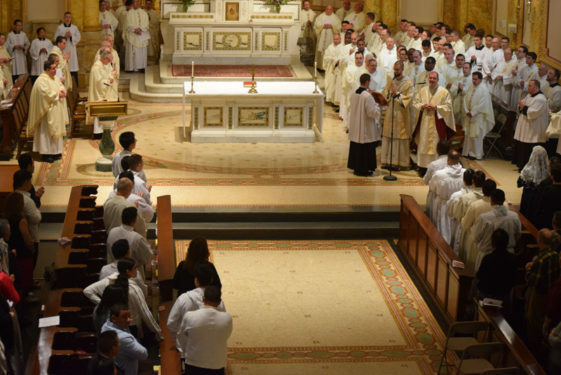 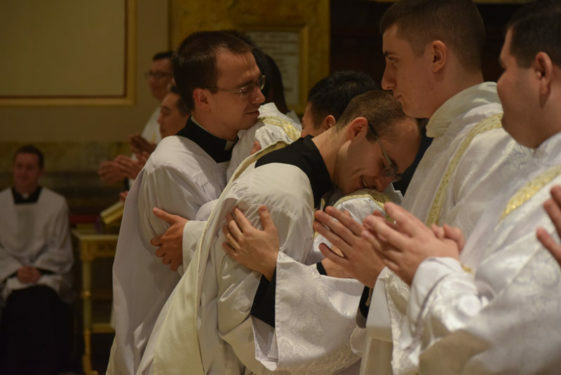 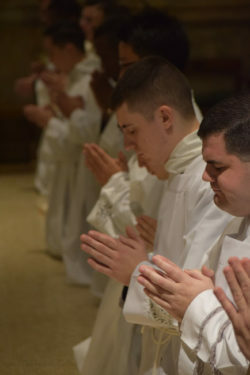 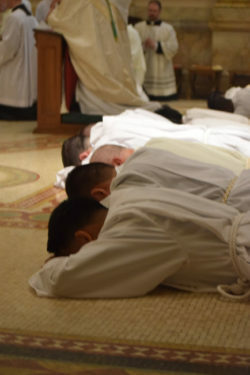 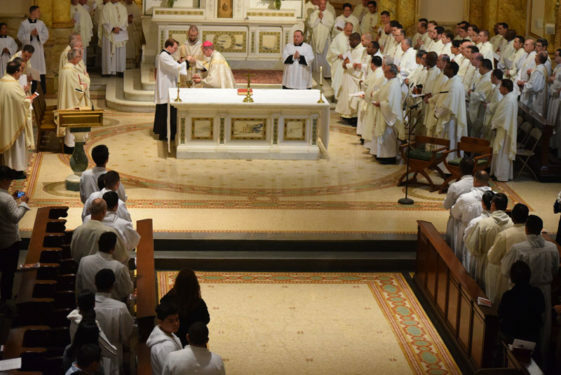 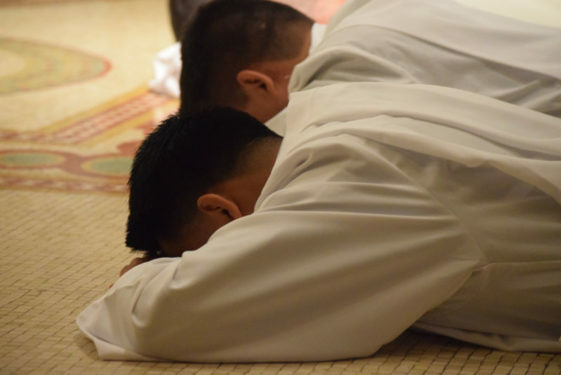 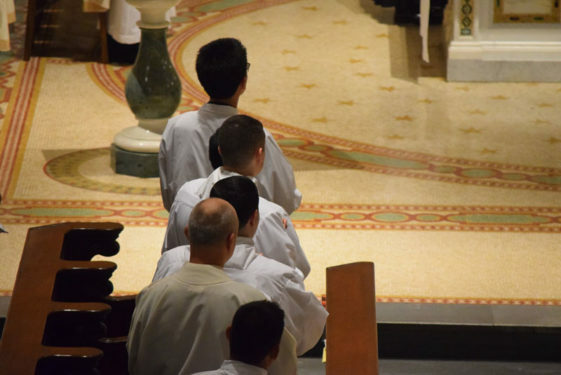 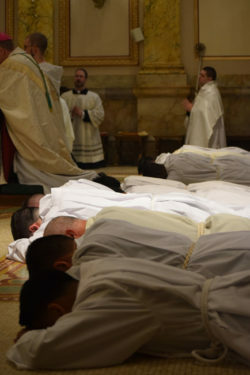 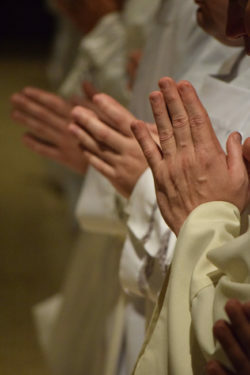 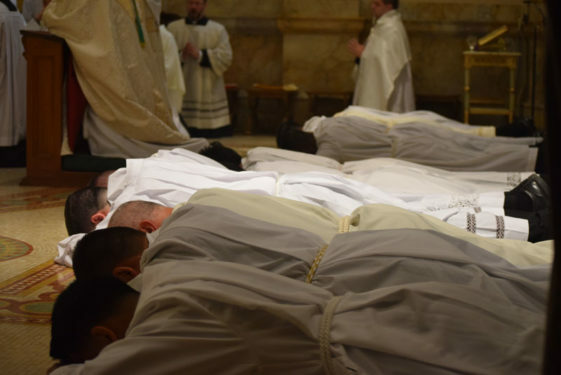 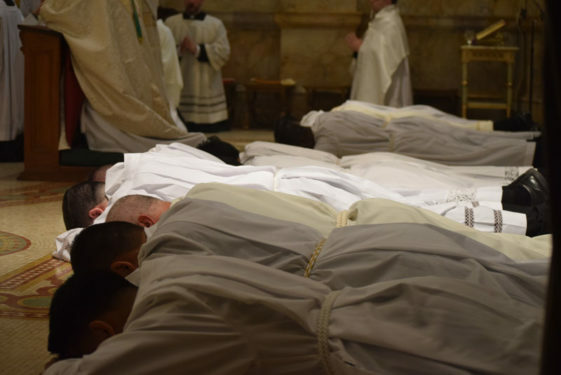 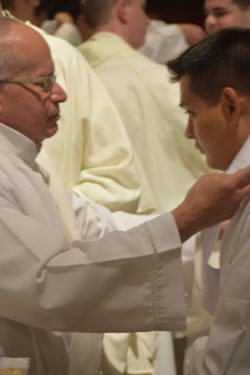 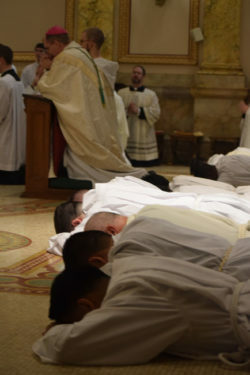 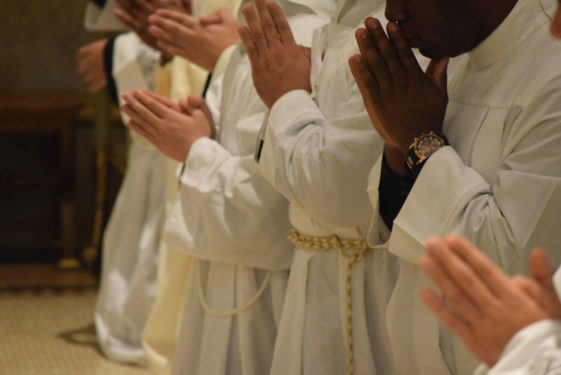 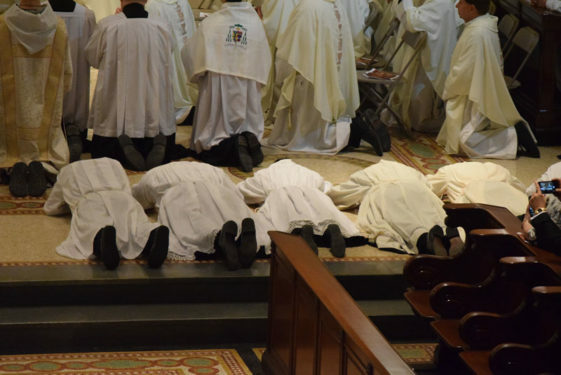 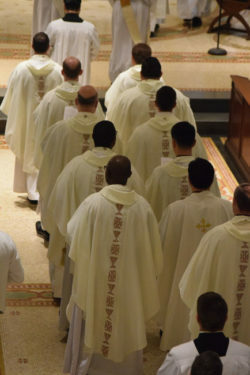 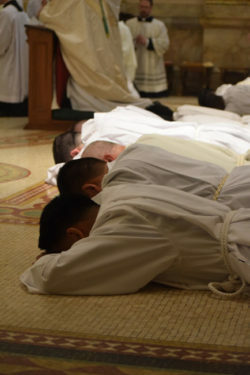 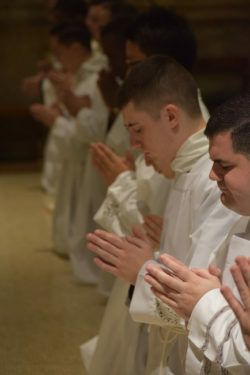 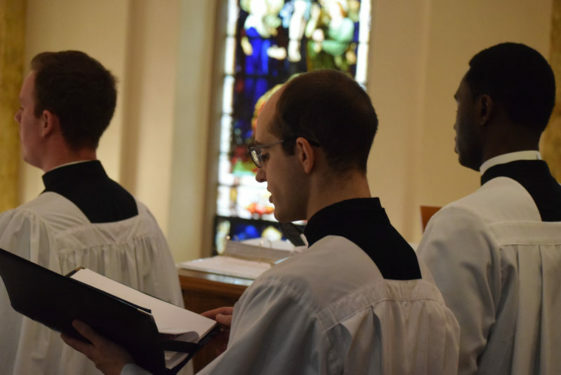 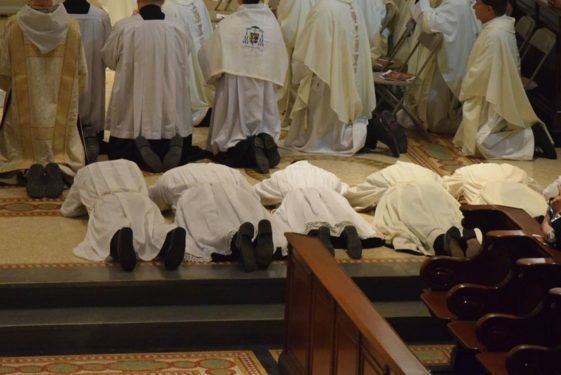 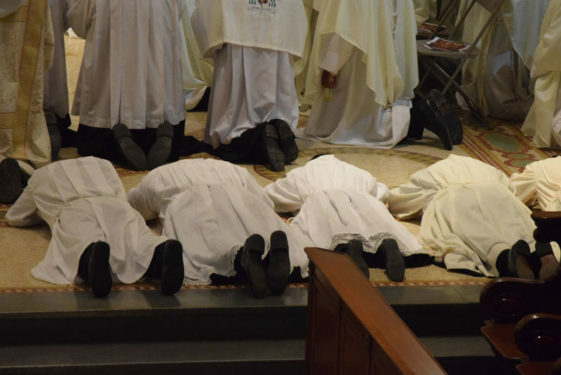 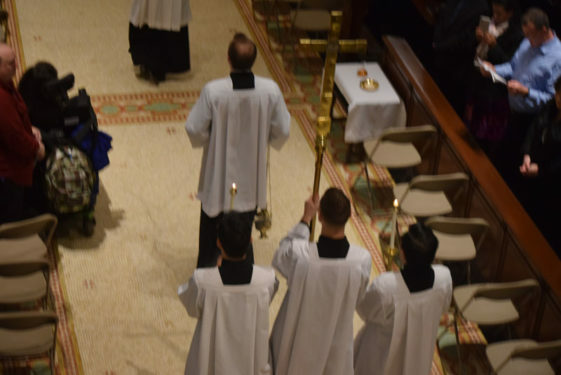 After the Mass, all the men were given assignment letters and were ready to begin their next steps to joining the priesthood.